We are finally back in full swing and getting projects underway. 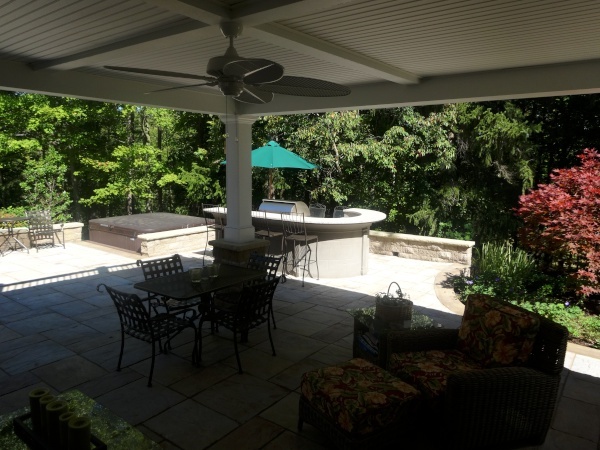 One of our latest undertakings is a custom outdoor bar and living space in Solon, Ohio. For this project, the customer chose Sheffield Blend Versa-Lok for the kitchen and bar, accenting it with a granite countertop. The appliances used are from the Summerset line (TRLD38” grill, TRLSSB side burner, SSRFR 4.5 cubic in refrigerator, one set of double access doors and one SSDR stainless steel triple drawer). The patio stone is full-range Thermal Bluestone accented with a soldier course of charcoal Holland Stone by Belgard. If you are considering a project at your home, please contact us as soon as possible for a free estimate and to get your landscaping project booked on this year’s schedule. • Planting trees and shrubs that attract everything from hummingbirds to butterflies are a good place to start. • The sound of quietly running water has been considered a soothing way to relieve stress going back at least to the Persians. • Fragrant flowers and shrubs contribute another positive sensory experience to the backyard wellness garden. Ask your H&M professional designer for help making your garden a place of healing and relaxation. He or she will have a host of healthful ideas. The first week of spring is always so exciting as it welcomes the feeling of a new year all over again! 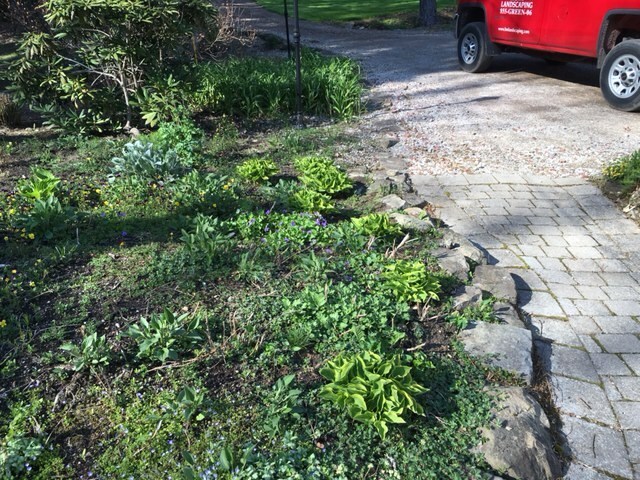 Perennials are barely poking through and breaking that hard, crusty layer of soil that winter leaves behind as it begins to thaw. You can feel the temperatures warming up and it encourages you to get out and resume outdoor activities. You will quickly realize the mess winter left behind! Our enhancement crews have been busy here at H&M Landscaping performing our spring clean-ups. 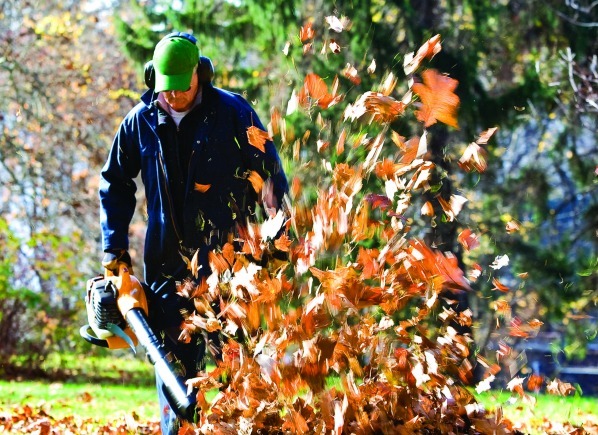 Our services include: leaf clean-up with state-of-the-art blowing equipment and manual removal of branches, sticks and all other winter debris. We do a complete cleanup of your beds and lawn areas including all hard surfaces. 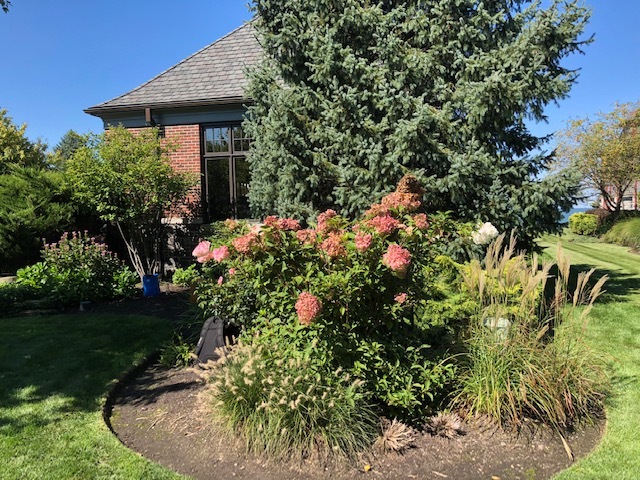 Once all beds, hard surfaces and yard areas have been completed, the crew will begin to remove old grasses and remaining perennials along with performing shrub trimming with power shears and hand pruners will be used on all shrubs and trees requiring service. All beds and tree rings are deep edged mechanically and manually with a bed edger and edging spades. This will prepare all bed areas and tree rings to be mulched. Please give us a call for a free landscape consultation that best fits your needs. Services range from a one-time enhancement to a fully-inclusive maintenance program. Let us take care of your landscape needs! Spring clean-up not only helps you achieve great curb appeal, it gives you peace of mind and allows you to enjoy that beautiful landscape. 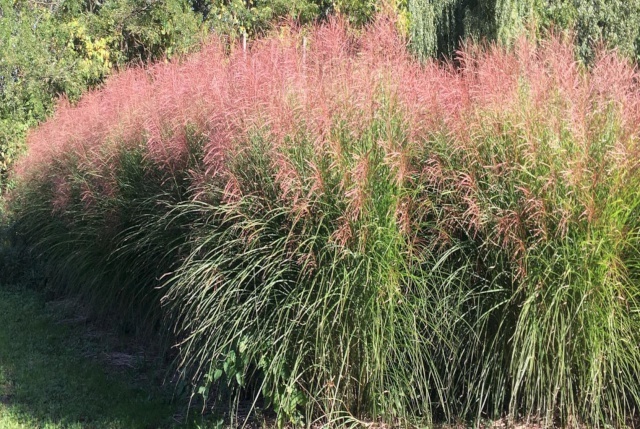 Ornamental grasses are used in many landscape applications, but a lot of homeowners may not think of using them as a privacy fence. 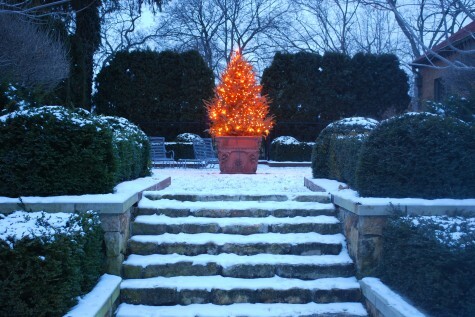 Most of the time your common evergreens are used for this purpose. 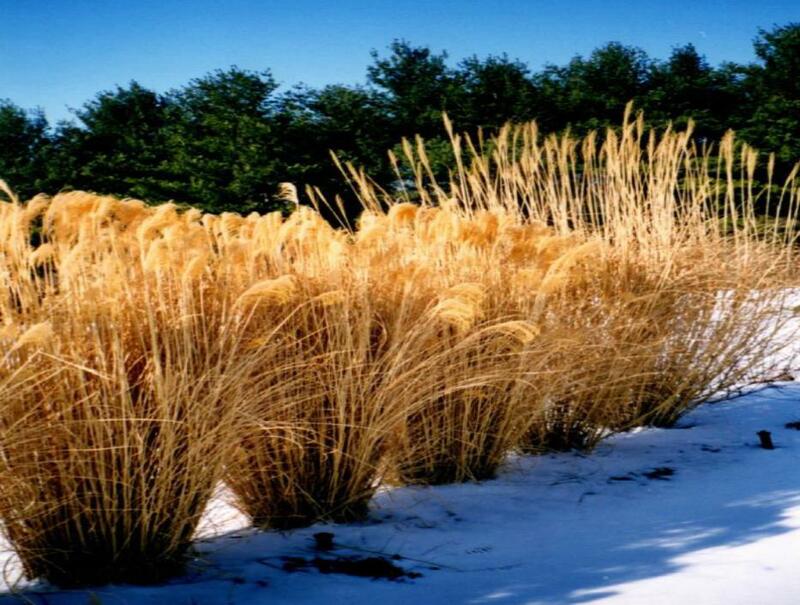 They do work well, but several grasses can be great alternatives and take up less space. Let’s say you live in a typical neighborhood where the houses are close together. You have a patio off the back of your home that you love to use regularly. Your neighbor seems to always be out on his patio every time you want to be on yours. You have a flowerbed along the patio between the two of you, but it is only a couple of feet wide. You think to yourself, “What can I plant in that narrow of a space to screen out my neighbor?” You run through a list of Spruce, Arborvitae, Pines and Junipers, but they either get too big, grow too slow or are too prickly. Then you think, “I’ll just use some grasses!” You clan keep them tall in the winter to see their winter beauty and then cut them in early spring. So, if you are imagining how you could use some grasses in your yard, give H&M Landscaping a call. One of our sales staff would love to discuss the best options for your property. Spring, we hope, is not too far down the road. As you think about ways to dress up your mulched/bed areas, you might consider ground covers instead. They can be very attractive and have two good attributes: weed control and erosion control. Maybe there is an area that always gets overrun by weeds. A thick cover keeps the area shaded and is very effective in keeping out unwanted species. You may have to be patient in getting that cover thick, but it could be well worth it. English Ivy would be one choice for rapid establishment; however, you need to keep it in check as it could overtake beds, trees and lawns. 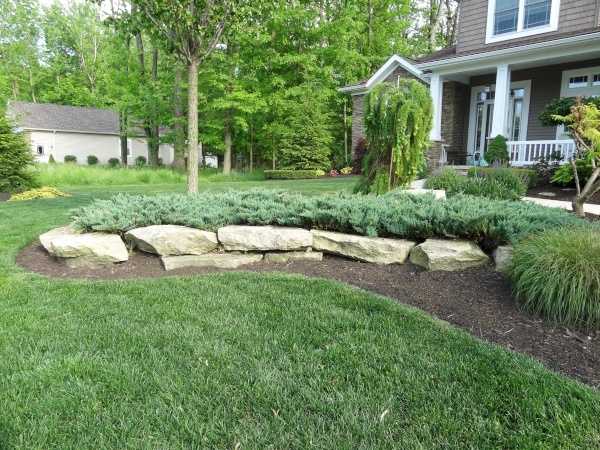 Severely sloped areas can be fortified with a creeping Juniper variety (see picture in the break wall). Again, patience is needed for total coverage which is helpful for keeping stone or bed material in place. Pachysandra or Myrtle (Periwinkle) are two slower-spreading varieties that could be used as part of your plans in any bedding area. You don’t have to fill in entire beds, just use the ground cover as part of your planning scheme. You are the artist in your back yard. Look to alternatives to the normal and make your living space special. H&M is currently working on a project where we are adding a small pizza oven bar to the backyard living space. 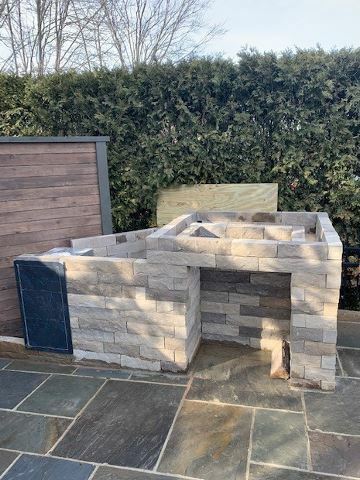 The customer chose Belgard block as well as a Belgard countertop-model pizza oven. This is a work in progress, and I felt compelled to share this with you to show that H&M never stops working. We are plowing by night when needed and installing hardscape projects during the day. This small amount of work was only two days so far and will require only one additional day to complete when the special-order material comes in. This type of efficiency can help to make a project you are thinking of more cost effective. Call us today for your free estimate and design! 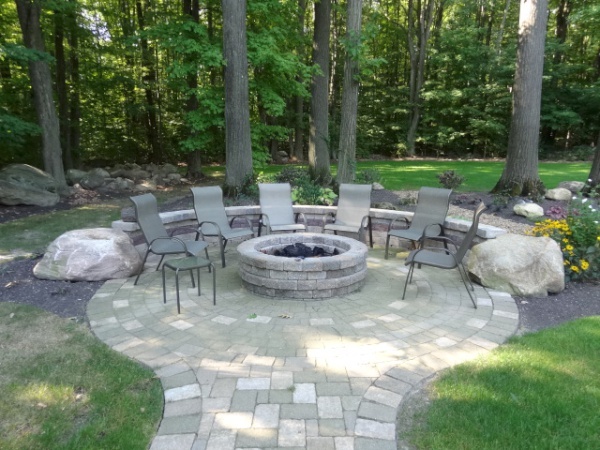 A customer in Chardon decided they wanted a new backyard to entertain in. So, if you’re going to do it, you might as well go all the way! 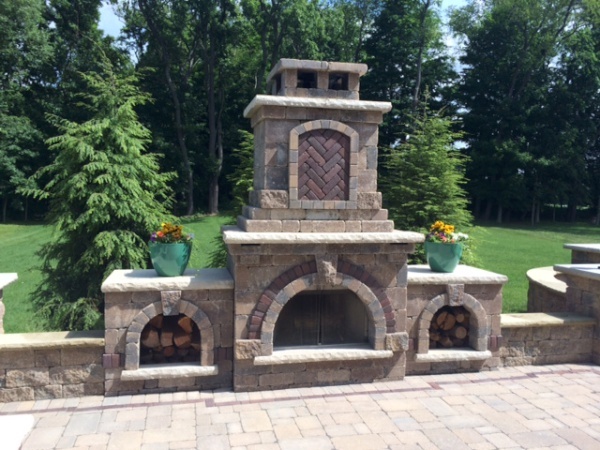 This customer decided on a custom-made fireplace with their very own pizza oven. The structures, as well as the surrounding retaining walls and steps are made of Versa-Lok block. 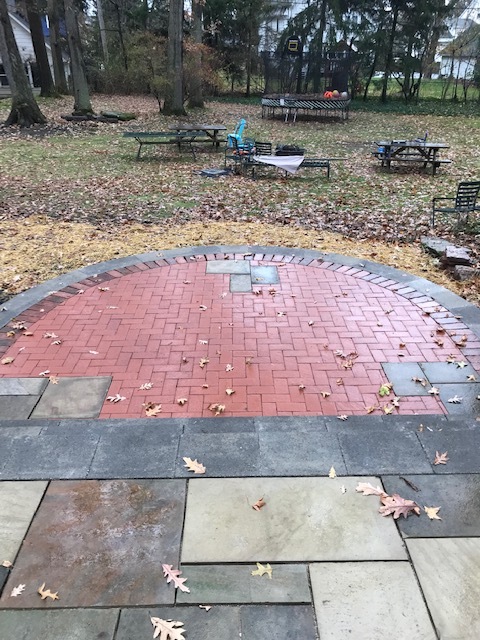 The customer had an outdated patio made of old red road bricks. After removing the material, cleaning, then palletizing it, we were able to reuse the material in their new outdoor living space. Counter tops are 2-1/2 inch buff sandstone and of course, the entire patio is locked in with Polybind Polymeric Sand. Call H&M today for a free estimate to design and install your new outdoor living space. Spring is almost here, and H&M Landscaping is getting ready for our season to kick off. There is no better way to start the season than with a new spring patio installation or renovation. Our crews are experts and we love installing paver patios. We believe patios add a lot of character to your outdoor space and provide convenience and versatility to your property. 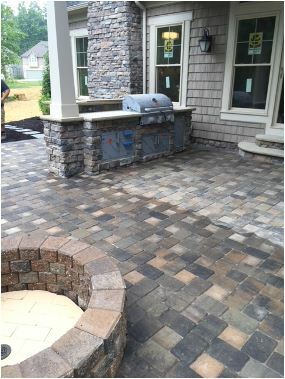 A paver patio installation can offer much needed space for entertaining. You'll enjoy relaxing on comfortable outdoor furniture and will love a built-in grill, fire pit or water feature. Improve your quality of life by adding additional living space and increase the resale value of your home as well. We pay special attention to installation details when it comes to paver patios. Your design options are endless with H&M Landscaping’s designers. You can have your choice of borders, color scheme and even paver rugs to blend or contrast with your home to enhance its visual appearance. If you know exactly what you are looking for or you need some help with the design, that’s what we are here for, to help turn that dream into a reality. Call us today to schedule a free consultation and get your new project off the ground. Start planning your new outdoor kitchen now with our newest product from ClifRock. This product allows us to create unlimited layouts and designs. 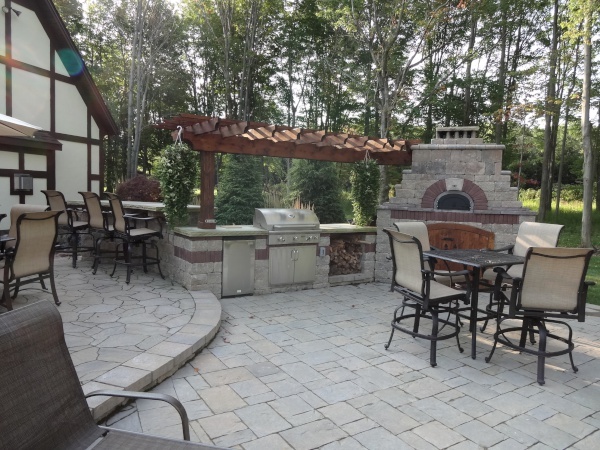 H&M Landscaping can design and build your outdoor dream kitchen to include your favorite BBQ and cooking appliances from our line of featured Summerset products or a special product of your choice. Whether you are looking for cabinets/storage, grills, icemakers, griddles, trash receptacles, paper towel holders, refrigerators, freezers, drawers or a pizza oven, we can design and install whatever outdoor features suit your needs. ClifRock is an engineered stone panel that has a much lighter footprint than most other products. It is engineered to be weather resistant with a 9000 psi pressure rating and you can choose from many patterns and colors. ClifRock can be installed much faster than traditional methods as well, so you can enjoy your new outdoor kitchen sooner. 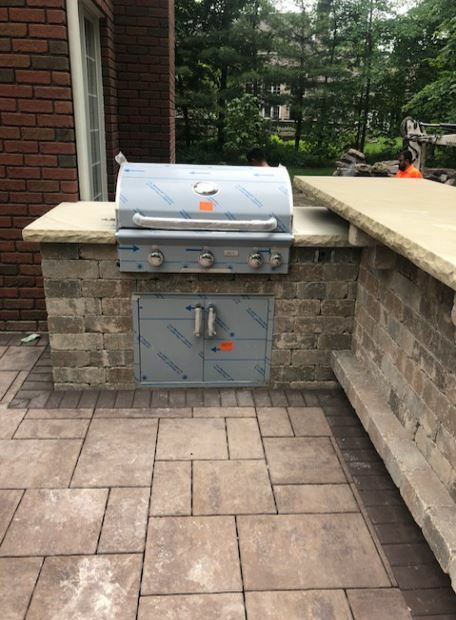 Call H&M Landscaping today to set up an appointment so your new outdoor kitchen is ready for summer 2019 or sooner! Homeowners looking to maximize comfort in an outdoor living space can’t ignore mosquitos. NuTone Manufacturing introduced the HAVEN Repellent System a couple of years ago. It's a 12V fixture that resembles a path light and can be connected directly to a low voltage lighting transformer. Each Haven fixture emits a vapor of metofluthrin – the same mosquito repellant that’s in the OFF ™ Clip-On. It can be used day or night (since different species of mosquitos are active at different times). By simply installing them every 10 feet around a patio or deck, you can repel these pesky mosquitos once and for all. The easiest system offered is a dedicated 150W IT Transformer with Bluetooth which can hold up to 12 fixtures. You don’t even have to get up to turn it on: simply load the App to your smart phone or iPad, set it up on a timer or turn it on/off manually. It’s best to turn on the system about 15 minutes before going outside so the metofluthrin can activate, vaporize the area and force the mosquitos out of the living space. H&M Landscaping is a complete in-house design/build firm offering a full range of services including spring clean-ups, irrigation maintenance installs, maintenance and upgrades to your existing systems, low voltage LED lighting, hardscapes, softscape plantings, water features, carpentry, electrical, drainage, fertilization, full design services and complete lawn maintenance packages. Give H&M a call today- as it's never too early to discuss your spring landscape needs and dreams! The winter season is upon us again and that is something you should always be prepared for. To some that may mean your Yeti Rambler Cup is ready to go for a fill up from the local Starbucks but here at H&M Snow Pros that means preparing for snow removal. This starts long before the snow is in any forecast with commercial contracts being signed, materials on order and enough manpower lined up. We can take care of sidewalks and small lots all the way up to large retail and dining sites. We make safety and training a priority when instructing our team members how to perform on your properties. This covers proper clothing all the way up to running their favorite Ford, Chevy or RAM truck with the latest Western snow plows. Area managers put together routes with the suitable number of team members to make sure your property is serviced in the most efficient manner possible. This involves long call lists with lengthy communication and mapping to make everything run as smooth as possible. 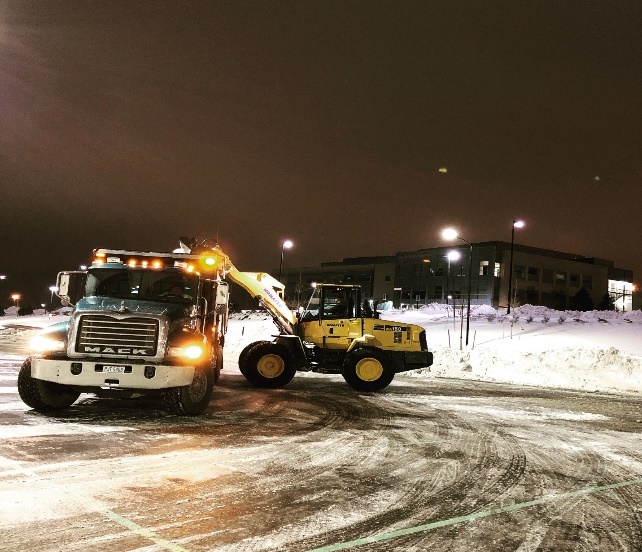 There is a lot that goes on behind the scenes with snow removal; we make sure you don’t have anything to worry about when the snow flies. We know you have a lot of options for your snow removal needs and we appreciate your business. Taking care of our customers is something we take great pride in throughout every season. With spring fast approaching and the need for seasonal workers never greater, the fear that looms over the H-2B Program has never been worse. There have been over 100,000 requests for workers and with only 33,000 visas to assign and there needs to be a permanent solution to the "Return Worker Exemption". There is bi-partisan legislation that has been started and signed by 130 members of the U.S. House and Senate. Every H-2B visa sustains 4.6 full-time American workers. Even though fall has come and gone, we are experiencing a somewhat mild winter and are still able to do plant installations. In the last few weeks we have installed two different types of privacy tree designs. The first is a mix of White Pines and Norway Spruces incorporated into an area that had existing trees but not providing much privacy. This type privacy planting is one that is designed to draw your eye to it instead of looking past it. 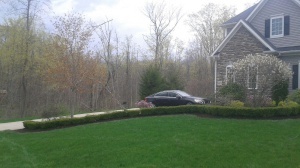 Another project used a soldier course of Western Arborvitaes to create a privacy wall. These are fast growing and will not die or brown out if they contact each other. This is a more direct approach and well suited for small city yards. This design will create a natural fence that can be trimmed to any height to a maximum of around 30 feet. As our political landscape is continually in a state of flux, one thing most Americans agree on and approve of is our H2-A and H2-B Programs. These programs allow non-immigrants into our borders for a set amount of time (usually 10 months) primarily as Nursery and Landscape laborers. However, some other labor-intensive fields also need these temporary workers who return to their home country each year. The laws protect US Citizens by controlling who is allowed in and the employers are responsible to keep them working for the duration of time agreed to. Only workers who have proof they are in this country for work and for no other reason are allowed back. We need these workers to provide services from Nursery to Landscaping and even for Hotel Cleaning and more. These programs have protected U.S. citizens and provided services for reputable businesses since their inception in 2016. 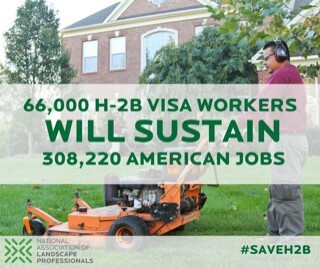 Please assist employers who provide services for which we don’t have enough American workers by sending your appropriate representative an email showing support of the H2-B Visa Program. Doing this will only take a minute but will have a HUGH impact! 66,000 H2-B visas will sustain 308,220 full-time American jobs! Managing inclement weather across Northeast Ohio can be daunting, especially with the liability associated with snow and ice. Every facility has different needs and we understand there is not a one-size approach to snow and ice management. 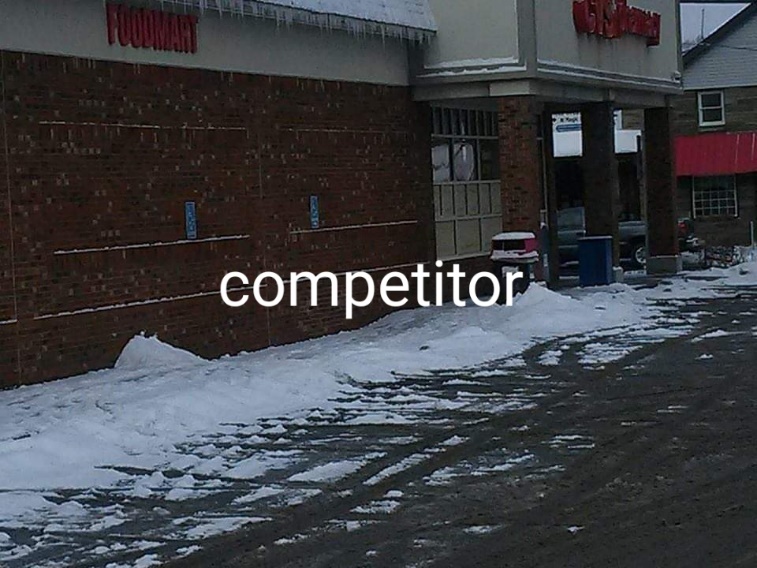 Our team will work with you to simplify your snow removal needs to remove the burden of managing multiple snow and ice removal companies across Cleveland and Northeast Ohio. We will always save you time, and money while providing timely service and a safe environment on the outside of your facility. 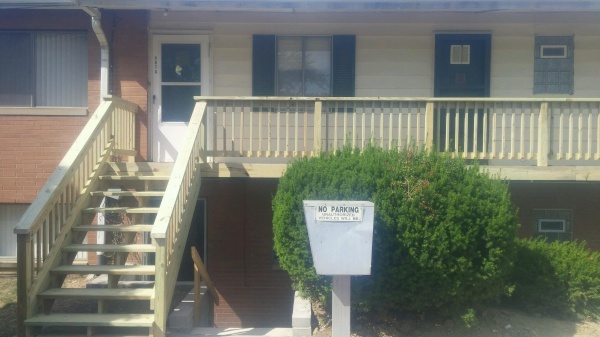 Our attention to detail on safety and a clean curb appeal stands out above the rest. 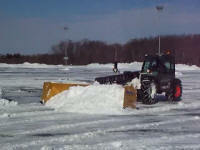 Make H&M Landscaping your one phone call for all your commercial snow and ice removal needs. 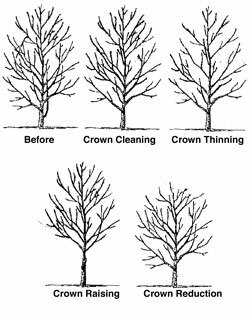 With the new year upon us, January can be the best time for a landscaper to prune your plants and trees. During the winter months, most plants and trees are dormant and there is very little sap and bleeding from a fresh cut. It is also a great time to see the actual shape of the trees since the leaves are gone. Fruit-bearing, flowering and ornamental trees benefit enormously from winter pruning as it can increase flower production when springtime arrives. White Pines and evergreens should be thinned out at this time as well, as the weight of the snow and ice can bend and snap off limbs. 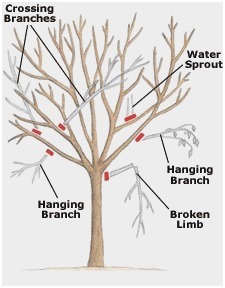 Please give H&M a call and schedule a trained professional to help with the process of winter pruning on your property. H&M Landscaping values your business and wishes you a Happy New Year! 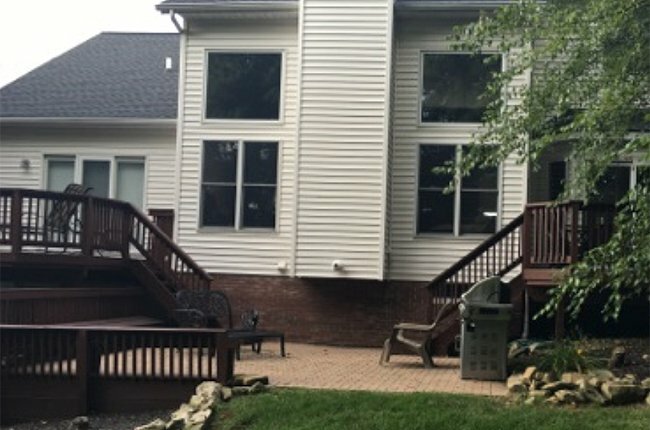 H&M just finished this project for a client in Broadview Heights who had an existing Timbertech composite deck in "Tigerwood" color. 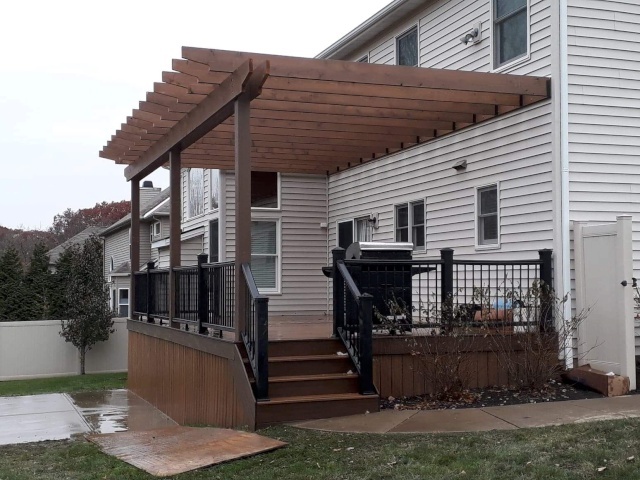 The customer was looking for a company skilled enough in carpentry to modify the deck and build a matching pergola above the deck. Step one was to dismantle the railing and deck skirting to allow us to dig post holes and install new posts. After the posts were set, we installed the large beam material to support the joists. The third step was to install the ledger board and then hang all of the joists at 16” on center. Finally, we reinstalled the siding, skirting and modified the railing to make it look like the new structure was always there. The customer supplied the cedar lumber for the pergola and stained it indoors so that it would have a finished look right away. The choice of cedar, coupled with H&M's professional installation, guaranteed an excellent result that will last a lifetime! Fall seemed to be nonexistent this season as winter weather has been around since early November. Hopefully, we will see some kind of Indian summer before we go into the deep freeze. The dark, drab weather can make landscapes seem the same. Have you considered statuary or custom carpentry to soften the look? You may already have a beautifully hardscaped Belgard patio or retaining wall. Consider adding a focal piece to draw the eye. Maybe you have an area in one of the beds that you have always thought could use a little something. Have us customize a piece to fit the location and your needs. Sometimes, just a bit a lighting on what you already have in place can give the warmth and look you need. Even though the weather may not be the best at the moment, H&M can still help you get the curb appeal that you are after. Give us a call today and we'll work together to spruce up your yard for the winter. 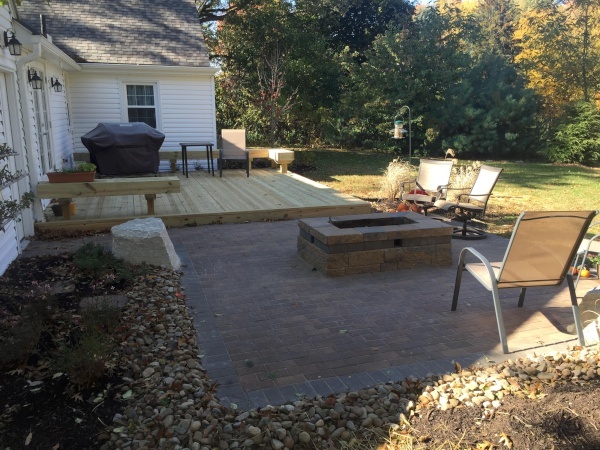 One of our customers in Cleveland Heights decided it was time for a change with their outdoor living space. H&M carefully disassembled the old raised patio and stored the materials on site for use in the new patio design. 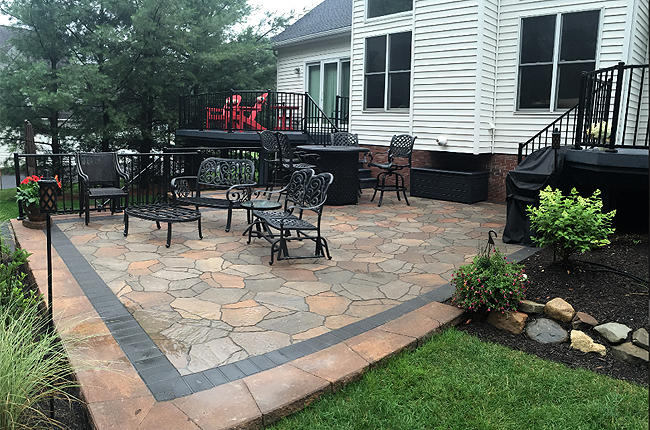 We then installed Belgard’s Versa-Lok® Retaining Wall System in Oxford Gray color to really made this backyard patio space come alive. The Sandstone from the old patio mixed with new clay-cut brick really pulled this living space together. Sandstone accents were added throughout the new clay brick patio helped give this patio the finishing touches it needed. Soon the customer will be adding in Kichler low-voltage lighting throughout the patio and surrounding planting beds. Call H&M Landscaping today to get the ideas flowing for your new upcoming outdoor living space. One of the best and most economical upgrades you can make to your outdoor living area is the addition of a fire feature. There are endless options and ideas out there that H&M Landscaping can design and build for you and your family to enjoy for years to come. You can decide on a simple fire pit for wood burning logs or a natural gas/propane fire pit with beautiful fire glass. You could have an actual outdoor fireplace complete with dry wood storage. Some of my favorites are pictured here in this article. 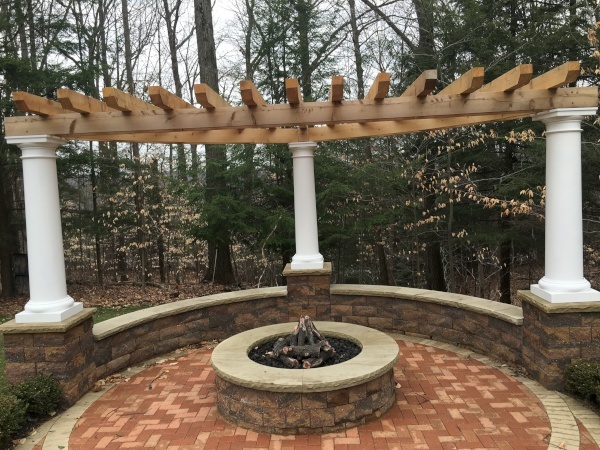 Whether we frame your new fire feature in with a custom pergola or build your new fire pit with small stadium seating to accommodate all your friends and family at once, we can help you design and build a lasting and memorable addition to your outdoor living space. H&M can design and build anything from a simple dry stack fire pit, natural stone or a custom masonry fire pit. 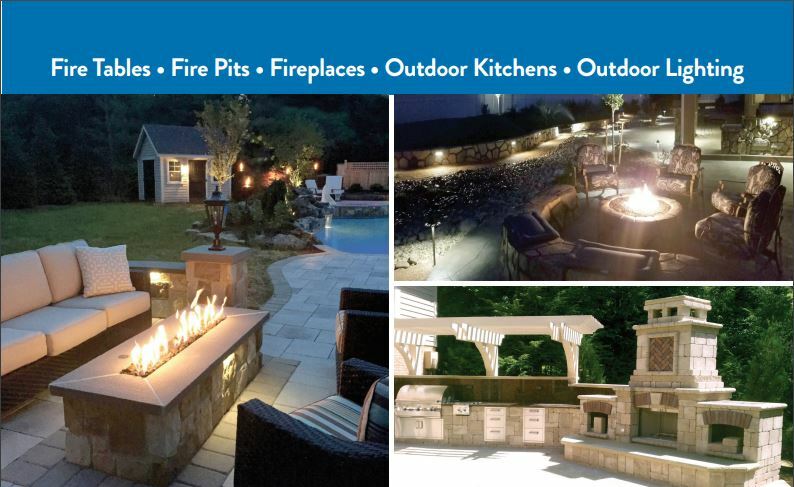 Ask one of our salesmen or design specialists how we can incorporate fire features into your existing landscape or create a whole new outdoor living area from scratch, centered around your new fire feature! Are you considering a facelift for your home? Do you need a privacy screen to feel more sheltered when doing your backyard entertaining? 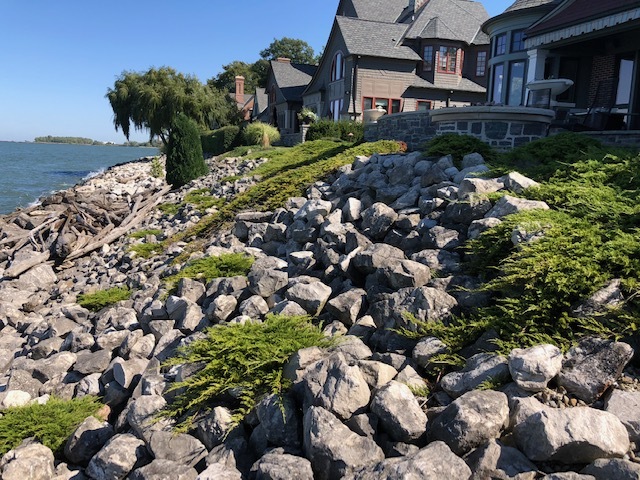 H&M Landscaping can provide both a topographical plan and a photo image, so you can easily see a view similar to how your landscape installation will look. The next few months are the optimal timeframe to speak to a representative to discuss your options and to plan for a nice home improvement that can add value to your home. Call today to speak to a representative who will be happy to assist you with the perfect design for your home. 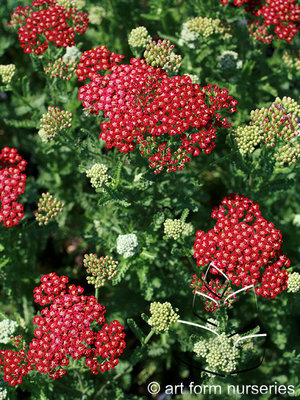 Achillea (common name – Yarrow) is an often-overlooked perennial in the typical landscape or even in the perennial garden of knowledgeable gardeners. 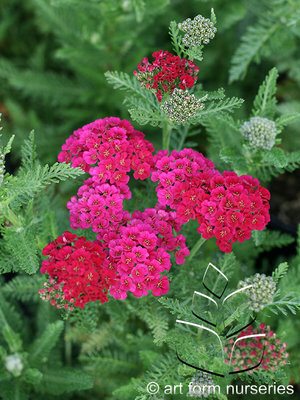 That’s a shame because Achillea is a delicate-looking flower that is tougher than it appears. It is named for Achilles; his soldiers applied the plants to their wounds. 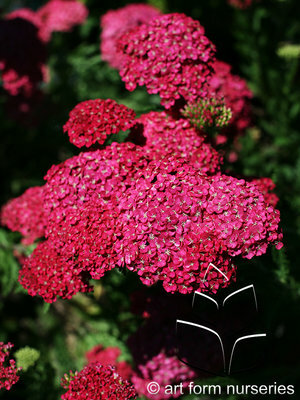 Achilleas are heavy blooming, happy-go-lucky perennials that grow in almost any soil and tolerate heat, drought and wind. 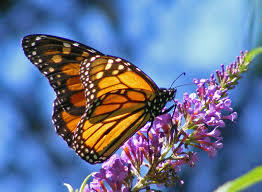 They prefer full sun to light shade and butterflies love them. 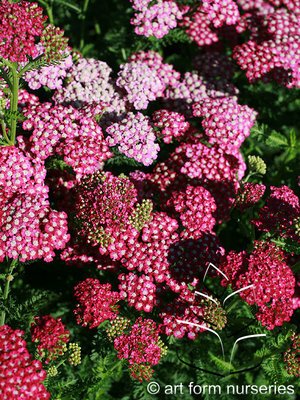 Achilleas flower from mid-summer to mid-fall in soft shades of orange, copper, red, purple, pink, yellow and white. The flowers array in gently arching lids on the top of green stalks. In the center of the flower clusters, many cultivars have a small button of a lighter shade of the flower’s color. Yarrows grow from six to 60 inches tall. King Edward is a short cultivar that produces masses of light-yellow flowers. Walter Funke, at about 14 inches, blooms red and yellow. 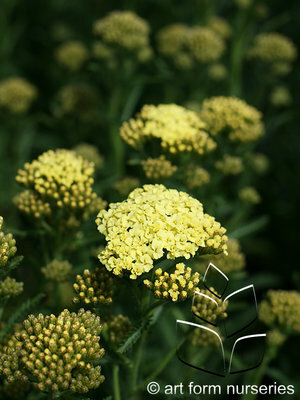 Achillea Gold Plate can grow to four or five feet in height. There are many other choices in size and color for the designer to select. 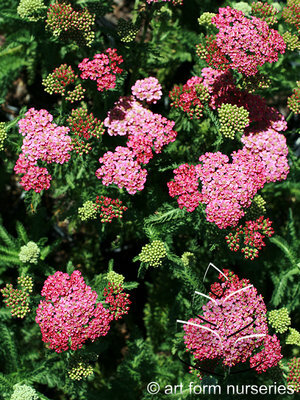 Depending on the cultivar, Achillea can be grown in hardiness zones 3 to 10. They spread easily so plant them with room to roam. As cut flowers or dried flowers, Achilleas shine in either setting. If you’re planning a new garden or just adding to an old layout, ask your H&M Landscaping professional to include some Achilleas. As they mature, you’ll learn to love this hardy little perennial. 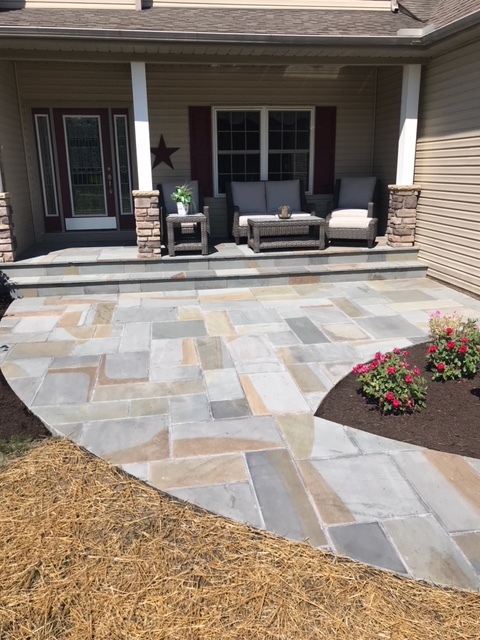 H&M Landscaping just had the pleasure of completing a beautiful stamped concrete patio and a new lawn with planting beds on a newly constructed home in Chardon. The first challenge was the steep grade in the backyard, but we were able to excavate the hillside to level it out. 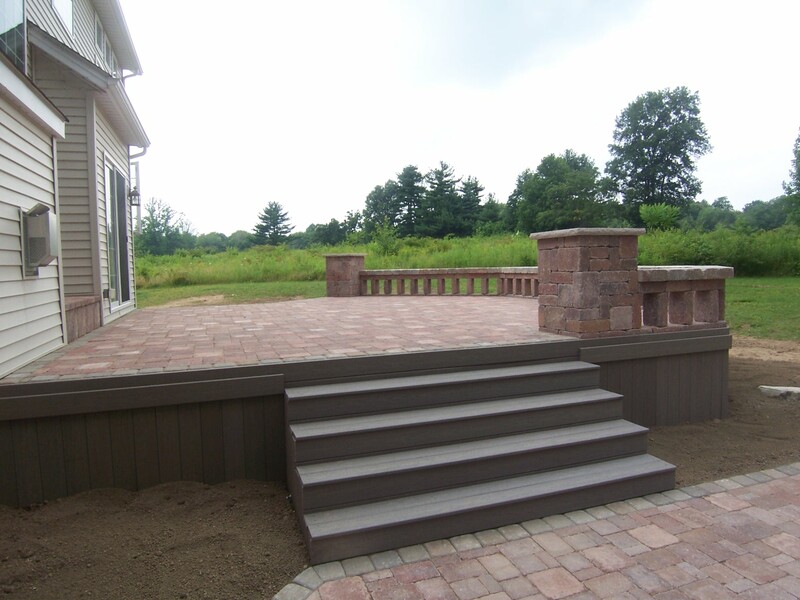 Next, we installed a Sheffield blend Versa-Lok wall and steps to serve as the foundation for the patio. 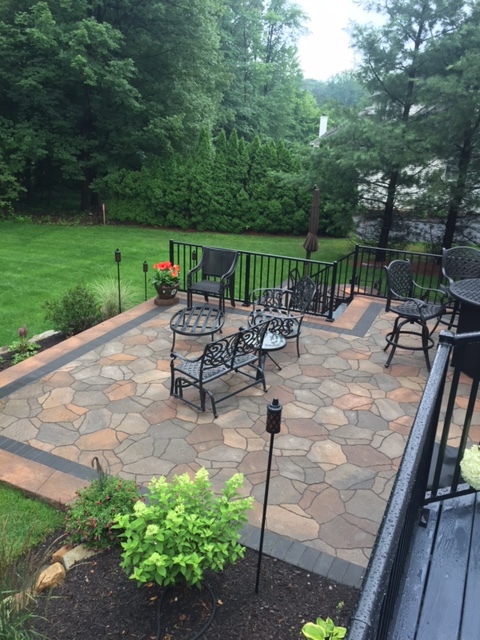 The stamped concrete patio used the Ashlar Slate pattern; the base color was Sun Buff and the secondary release colors were Charcoal and Chestnut. 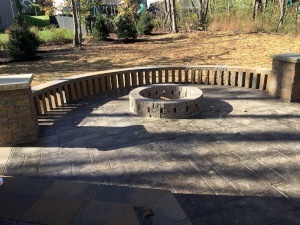 We installed a split-and-stack fire pit with a gas log starter and a louvered-style seating wall (using Sheffield blend Versa-Lok caps) to go around half of the fire pit area. Planting beds, top dressed with mulch, were then installed along with the new lawn. 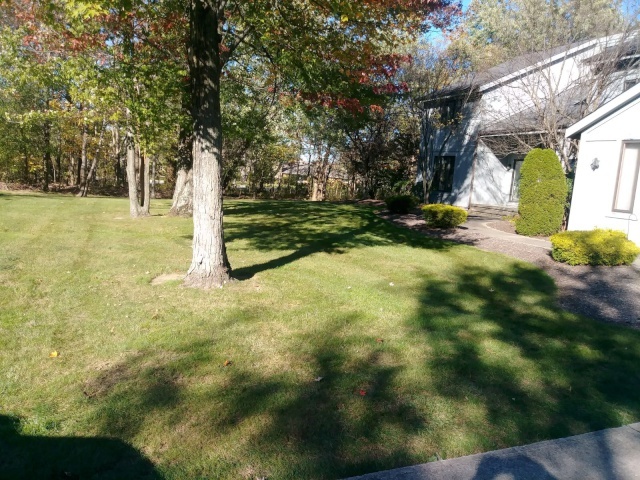 We harley-raked the existing ground to set the proper grade, remove debris, and spread new topsoil over the entire lawn area prior to hydro-seeding. The Final touch was installation of under-cap lighting on the patio pillars and steps. H&M created a beautiful new backyard that will be enjoyed on cool autumn evenings, sitting by the fire, with plenty of room for family and friends. If you are considering a project at your home, please contact us as soon as possible for a free estimate and to get your landscaping project booked on this year’s schedule. Autumn is here, and we all know what will be coming next. 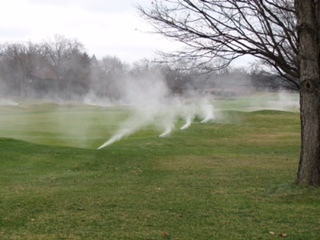 It’s time to start booking appointments for irrigation season shutdowns. There is more to a proper shutdown than just shutting off the controller. Be sure to set up your irrigation shutdown early before the winter weather sets in. Irrigation systems can be a great benefit to your lawn. We all know that lawns need regular watering to stay healthy. To keep your irrigation system performing in tip-top shape, you should ensure that it receives regular maintenance. You also need to ensure that your system is shut off during the winter season. Shutting off irrigation systems just before the temperature begins to drop below freezing will help ensure that your system is not damaged. Excess water can remain in your system after use, whether it be in the pipes or in the sprinkler heads themselves. If this water freezes, it can cause cracking or other damage to your system which can be costly. When you are ready to winterize your system, call H&M Landscaping at 440-564-1157 to book your appointment and to have one of our experienced technicians protect your irrigation investment! What is thatch? Thatch is a layer of living and dead organic matter at the surface of the soil. Thatch can be beneficial to have if it’s less than half an inch. It can help to insulate the yard from extreme temperatures, protect from foot traffic and prevent weed germination from reaching the soil. When thatch becomes excessive and has become thicker than half an inch it can create many issues. It can harbor pests and many lawn diseases. Eventually thatch can limit the ability of oxygen and water to filtrate through to the root system. It may interfere with insecticides and fertilizers as well making them less effective. Step 1: Thatch will have to be removed mechanically with a dethatcher. What this does is remove the dead and living root system from the lawn. This will create a very unsightly view of all organic dead matter. The main purpose of dethatching the lawn is to get rid of the “carpet like feeling” from the lawn by breaking it up and removing that layer of thatch. After dethatching, removal of all leftover thatch and lawn debris will need to be done manually with a rake. Step 2: Aeration of the entire lawn. 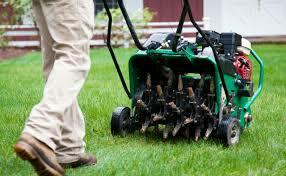 The main purpose of aerating the lawn is to penetrate and break up the compacted soil. You will start by poking holes about 4 inches apart with a 2-inch depth in about a one- half inch diameter with an aerator. 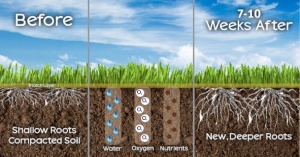 This process will allow nutrients, oxygen and water to penetrate the root system in the soil and reduce compaction. Step 3: Slit seeding will be the final process to complete the lawn overseeding. A slit seeder is used to accomplish this by creating small grooves or slits in the ground where the seed will be injected. This process will have to be done throughout the entire lawn. As the seed is being put down the slit seeder will inject seeds into every plug from the aerating process. It is also recommended to broadcast seed after aerating the lawn. H&M is just finishing up the final touches of this large project. We removed an old deck from the house and then started with a clean slate. The first step was to install the new Composite decking. We used TimberTech brand decking- the color chosen by our customer was Silver Maple. 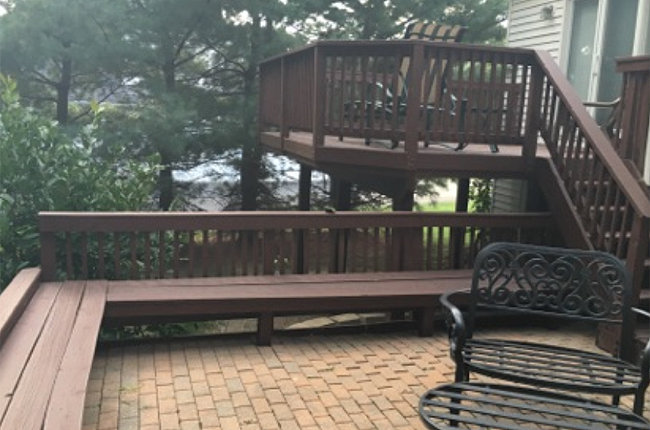 We finished off the deck with custom Sandstone-topped seating benches trimmed in Composite to match the deck. The next thing we worked on was the grill and kitchen area. 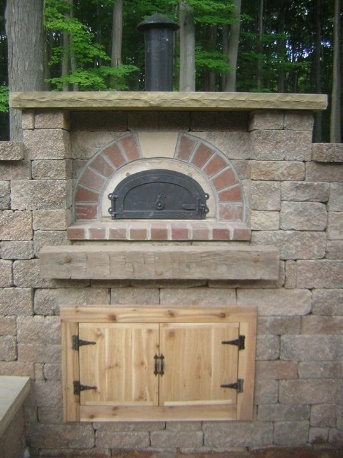 We used Cultured stone to match the house and installed a new 36” AOG grill with rotisserie. We completed the kitchen area by installing a custom Sandstone countertop. We moved on from there and started with the hardscape retaining walls. The customer chose Belgard brand Versa-Lok wall stone and picked Sheffield blend as the color choice. 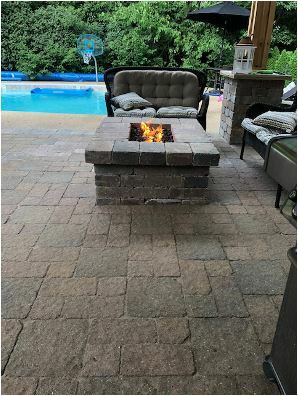 The fire pit was Belgard Brussels Block with a gas log lighter installed to make lighting the fire problem free. The patio surface itself is 1” Thermal Bluestone in the Full Range color. We re-purposed old Sandstone curbs as steps by cutting and rock facing the fronts. This always adds a great conversation starter with guests, as these old curbs are reclaimed from vintage Northeast Ohio roads. The plant selections were specific for this backyard as well because of the unique area with less sunlight and deer-resistant needs. Projects like these are great to do all at once, but don’t feel like you need to undertake an entire job all in one year. 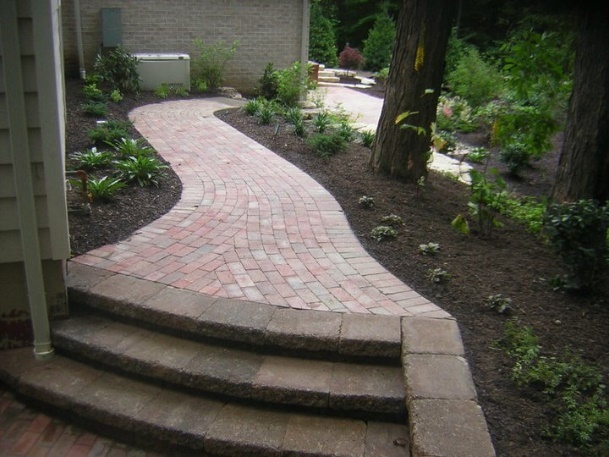 H&M Landscaping can implement your design in phases, done over several years, to realize your ultimate dreamscape! We also offer financing options if it suits your needs better. Please reach out anytime for a no-charge estimate with zero hassle. 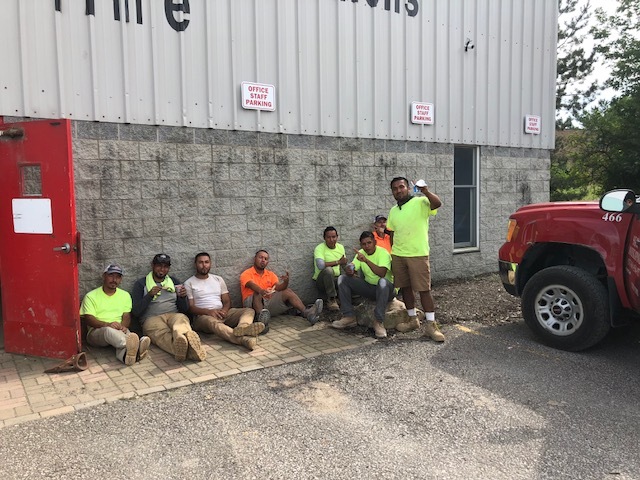 As our landscaping season winds down, we hope that you have had a chance to get to know your crews. Some may see the same crew weekly, others only for a few days. Whatever the case may be, we do hope that they were cordial and friendly, but I can say without a doubt, if you talked with them it made an impression. We have quite a large labor force with multiple skill sets and personalities. Getting the right people together on the job is key. They all know that the impression you as the customer have when they leave the site is the most important thing. Some are new and learning, but these members could be the strength of our team down the road. Others have been with us a long time and many of you ask for them by name. 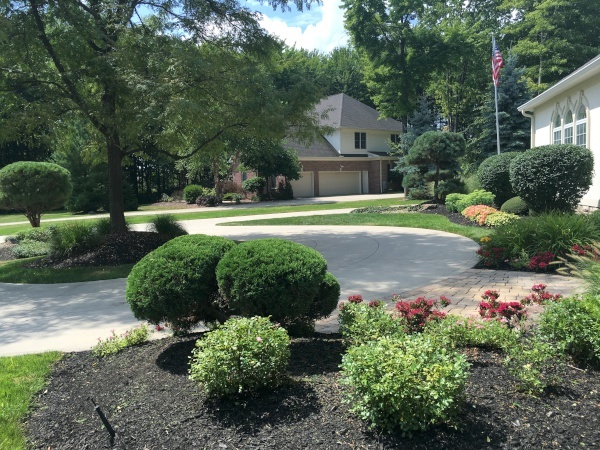 Some of our crews are only here in the Cleveland area for the summer landscaping season. Without this seasonal labor, our capacity to serve would be very limited. Many of them have been coming for years and as you can imagine, they miss their friends and family. I think that many of you have become extended family for them and they thank you for your friendship and patronage. After a snowfall, it is important to clear parking lots and sidewalks to provide safe access for employees, customers and suppliers. Promptly removing snow and minimizing icy surfaces is crucial for reducing the likelihood of slips and falls. H&M Snow Pros is always there to attend to and manage Mother Nature for our customers. Small or large snow amounts can be easily handled without issue by our certified and professional snow account managers. Our reliable crews are in heavy demand again this year, so it is critical to have H&M service contracts in place prior to the first snowfall of the season. When selecting a contractor, it is imperative to make sure the people who remove your snow/ice will show up as anticipated, do a thorough job and work within previously negotiated contracts and price guidelines. We make sure the contract covers all your needs (i.e., parking lots, driveways, walkways). Look for an established, licensed and bonded professional and always check references. Ask to see the contractor’s certificates of insurance and make sure coverage for liability and workers compensation insurance is current. 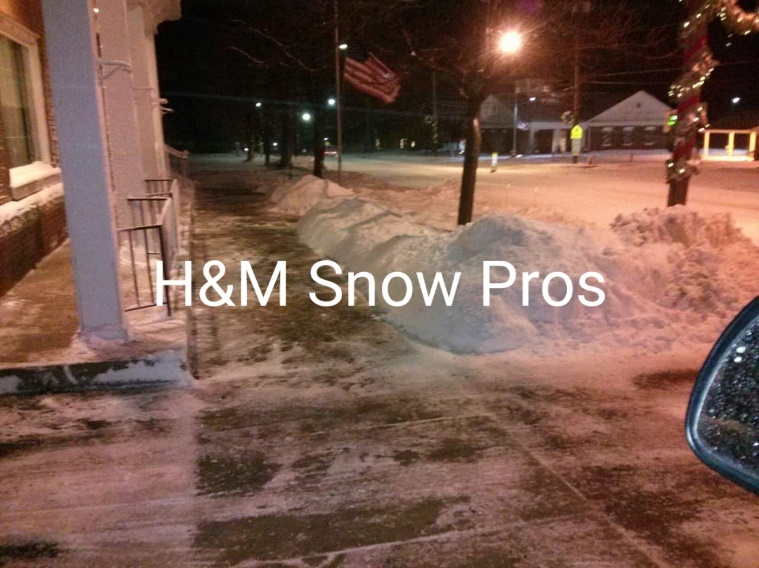 H&M Snow Pros is a very sought out and reputable company that is a one-stop shop and can handle any landscape project or any snow removal needs you may have. From small snow storms to large blizzards, our company will make sure your property is serviced and taken care of so you can have peace of mind. We strive to bring the same incredible service to all of our accounts- no matter what size the property. We take tremendous pride in our business and our clients’ needs are of utmost importance to our company. Call us today for a free quote on snow removal services for your property. 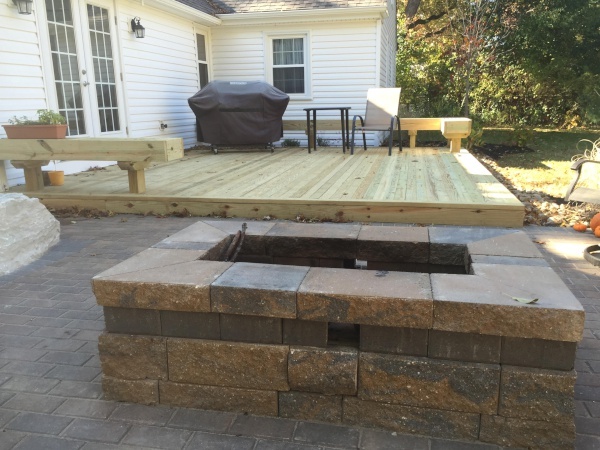 A customer in Aurora is getting a new back patio with fire pit seating area. 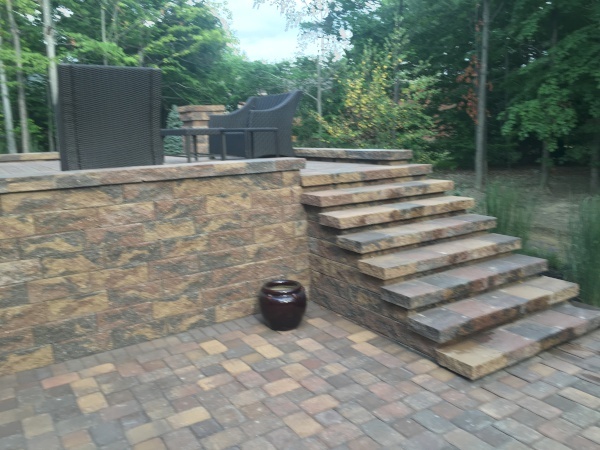 The upper patio side walls, steps, and pillars are Versa-Lok standard blocks in Stone Gray color. 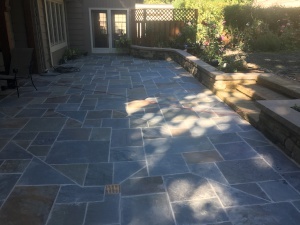 The main patio fields are Beacon Hill Flagstone by Unilock in Fossil color, while the soldier course border is Holland Stone in the Charcoal color by Belgard. 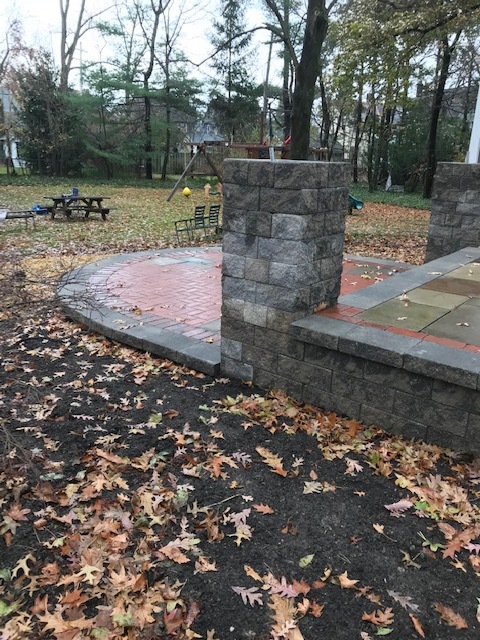 Once finished, the two small seating walls by the fire pit area (as well as the pillars) will have 2-1/2 inch Sandstone caps rock faced on all exposed sides. Finally, everything is sealed-in with Polybind polymeric sand in Nevada Tan color. 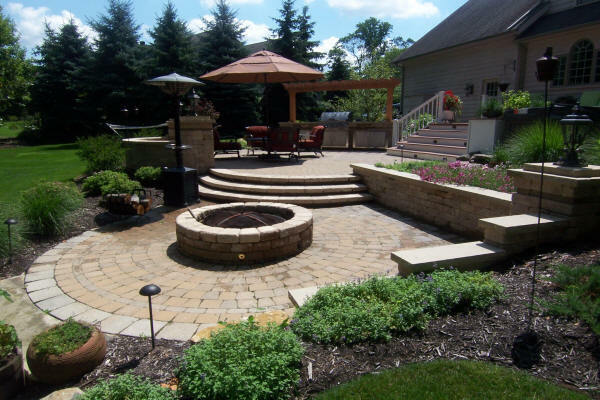 Call H&M Landscaping today to set up an appointment with one of our experienced landscape supervisors to learn about materials to create the perfect patio for your backyard. 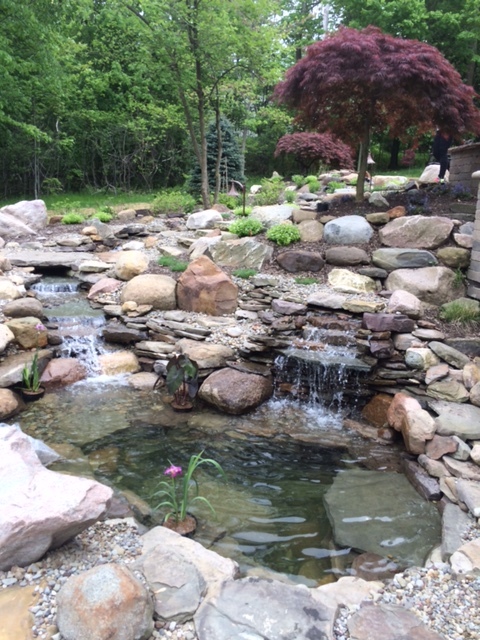 H&M Landscaping has exceeded another customers needs with this beautiful pond-less water garden. It all started when H&M's owner, Mark Mazzurco, met with an existing client in Pepper Pike to create an area to sit down and unwind. Once the idea was brought to Mark, he designed something special for them again. 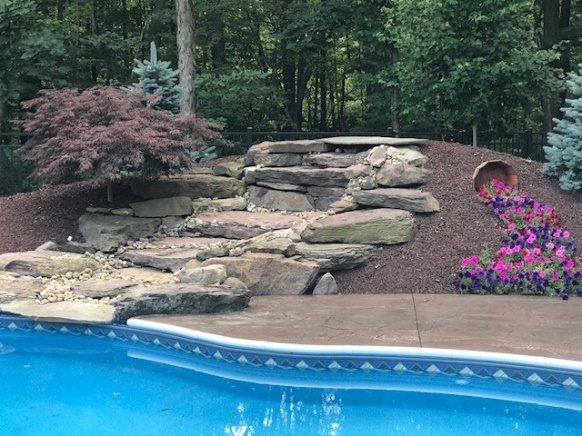 We used a natural stone called moss rock combined with some #3 washed gravel and added beautiful plant material to make this water garden the new favorite spot to relax on this property. H&M wanted to continue to build a strong relationship, literally made of stone, with this existing customer. The client had a dream and Mark and the H&M team has helped turn it into a reality. We look forward to maintaining this water garden and building strong relationships with all of our existing and future customers. Call us today for a free consultation. When thinking of improving your yard, many people try to focus on lush lawns, colorful flowers and the perfect definition of a deep-edged bed. What about the timeless addition of Natural Stone? Let H&M Landscaping help you incorporate Natural Stone into your outdoor design. Natural Stone will last a lifetime and provide the perfect contrast between live growing plants and the steadfast feel of always being there. Natural Stone will fill any voids in plantings and will require zero upkeep; it will also last a very long time. Place it and forget it. Most Natural Stone applications benefit from a long-term setting by developing moss and algae over the years to enhance the natural look. Sometimes Natural Stone can be used to augment a landscape setting where drainage or soil conditions are an issue. Natural Stone can come in many forms – from decorative river gravel to large boulders. Natural Stone can be found on your property and re-purposed or bought and installed. Either way, Natural Stone comes with a history and the ever-wondering curiosity about where it came from and how it got to your property. This can range from one single boulder near a mailbox, an outcropping, all the way to a three-tier waterfall. Let H&M Landscaping add some Natural Stone to your next project. We have the designers, the inventory and the qualified crews to get the job done for you and add the timeless feel of Natural Stone. People think that when it comes to getting a landscape design, it always involves some type of elaborate drawing and blueprint. At H&M Landscaping, we live by the motto that no job is too small. 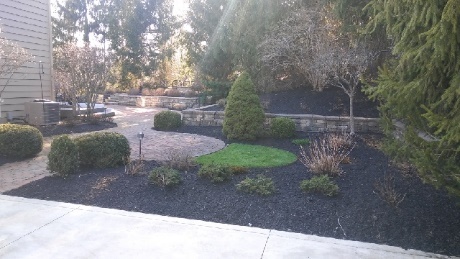 Here is an example of a small planting job that was sold to a commercial client in Solon, Ohio. It was a quick and easy conceptual design that was presented to the customer and allowed them to see what the finished product would look like. 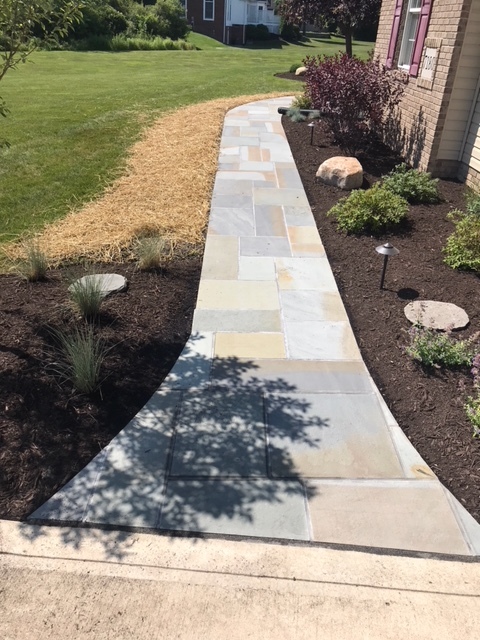 This was a softscape planting with some gravel mulch and large, upright boulders to offer some different textures in order to spruce up their front entrance. The following pictures show the design concept and the finished product. If you have a small project in mind and would like to see it come to life, please give us call today and make an appointment with one of our design specialists. 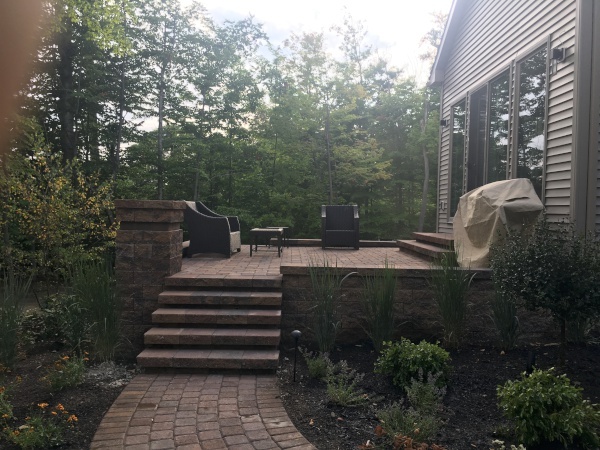 When a wood deck and a stone patio began to show their age, owners of a home in Bainbridge, Ohio, called the veteran designers at H&M Landscaping to reimagine their outdoor living space. The homeowners wanted to enjoy the view and also improve access to the back yard. Although the project had three levels, the homeowners had to walk across the lawn to reach the patio. The owners were thrilled when the H&M designer returned with innovative solutions for the reimagined backyard. Then it was time to bring in the expert H&M craftsmen. 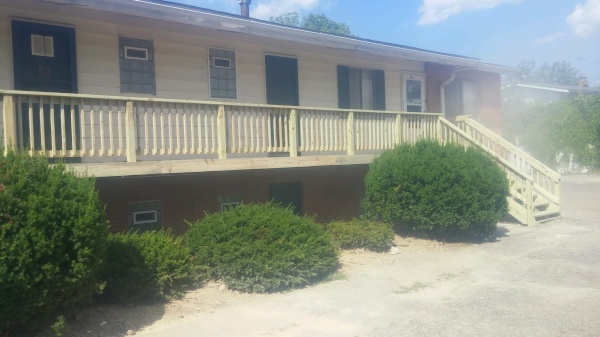 The wood deck on the highest level was replaced with a new composite deck material from TimberTech, while commercial quality aluminum railings replaced the outdated wooden rails. Bright red Adirondack chairs provide bold accent colors, giving the deck a fresh, modern look. 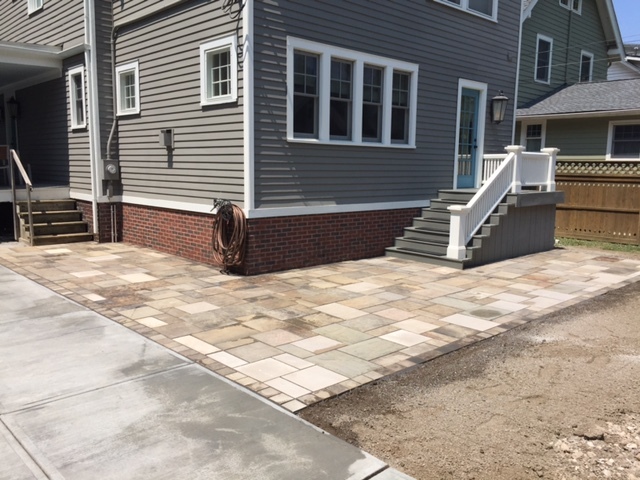 The masonry patios on the middle and bottom levels were replaced with Mega-Arbel pavers surrounded by a dark sailor course border. 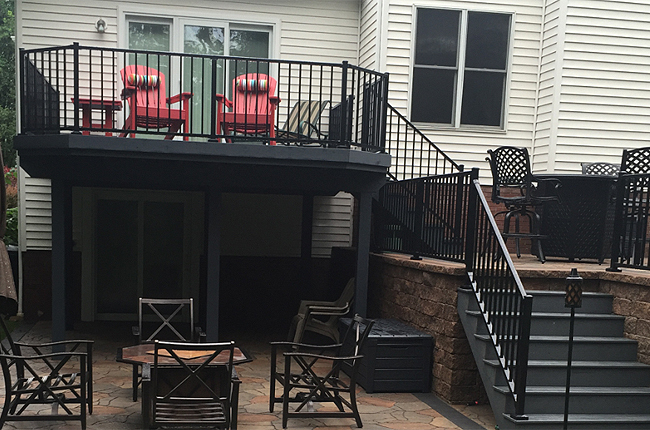 New black patio furniture was chosen to match the railing and provide contrast to the home’s white exterior. H&M constructed VERSA-LOK retaining walls to support the redesigned middle level. New stairs made of the same material as the deck now connect the middle and lower levels – no more traipsing across the lawn to reach the patio. Heavy-duty table and chairs were selected for the lowest patio, creating another pleasant place for family and friends to gather. This project will provide the homeowners years of low-maintenance beauty and add to their home’s value. Our designers and craftsmen were pleased to give the family a much more functional outdoor space. To learn what H&M Landscaping can do for your home’s outdoor spaces, call us today for a free quote. Are you tired of constantly changing burnt-out bulbs in your low-voltage outdoor fixtures? Are your electric bills too high? Some of us have already replaced the incandescent bulbs in our homes with LED bulbs. Now is the time to do the same outside, increasing your home’s energy efficiency. H&M Landscaping can install Kichler LED bulbs into any existing fixture or install a new outdoor lighting system designed specifically to fit your home and lifestyle. Kichler bulbs come with a 6-year warranty. Check our our LED Landscape Lighting Calculator with Cleveland area rates and call H&M Landscaping today for a free lighting layout and estimate. If you are tired of looking at your old patio or no patio, consider stamped concrete as a low-maintenance solution. 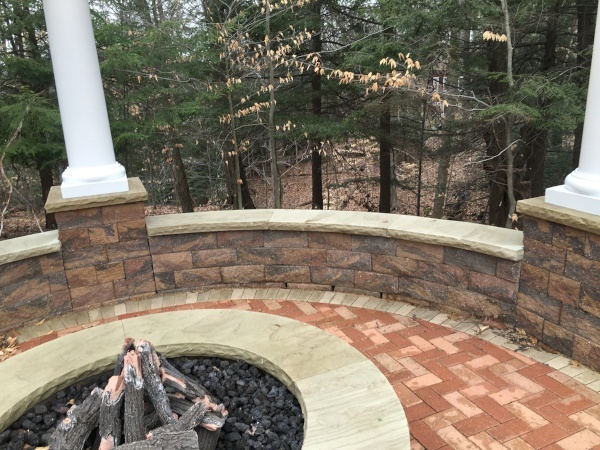 One of H&M Landscaping’s latest jobs was to remove an old deck and build up the grade on one side with a natural stone wall. For the other side, we used Versa-Lok block to create a step for the second landing. 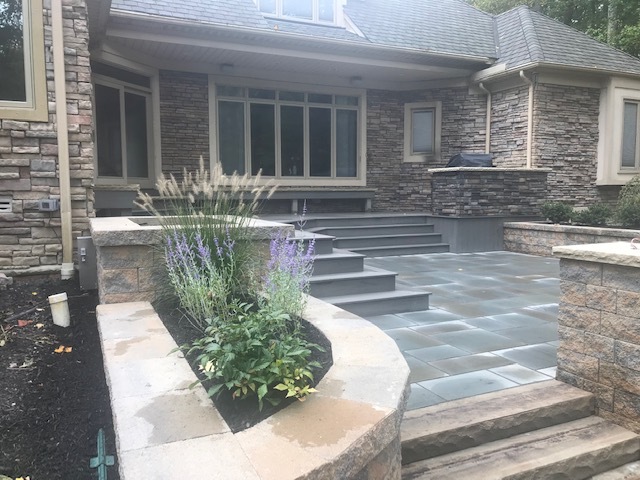 After grade was established, we poured a two-tiered concrete stamped patio with textured steps leading around the side of the house. The customer chose to use pewter for the base color and medium grey for the secondary color; the stamp pattern was Brickform’s Stone of Athens. Please call today to schedule your free estimate. I drew my first landscape plan in 1970. It was a crude drawing with colored pencils on graph paper. It may not have been state-of-the-art graphics, but it gave the homeowner an idea of what the landscape contractor was proposing. To say things have changed a lot in the last 48 years is a tremendous understatement. Now the landscape designer has many tools available to show what’s possible. 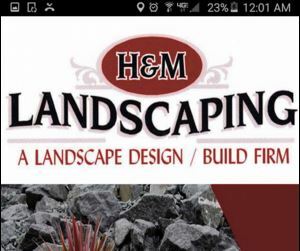 One of those tools is landscape graphic design software in use at H&M Landscaping. The software allows landscape plants and other products to be overlaid on a photograph. We take a series of pictures of the area to be landscaped. The pictures are then downloaded to our computers. They can be knitted together or used individually. The designer then has a full palette to create a new landscape. The plant list alone includes hundreds of choices – perennials, annuals, trees, shrubs, cacti, even water gardens. The plants can be shown as they mature, from planting to how they’ll appear in 5 or 10 years. And patio, deck and water feature ideas are a mouse click away. Patio or sidewalk surfaces can be designed with concrete, tile, brick, pavers or even marble. 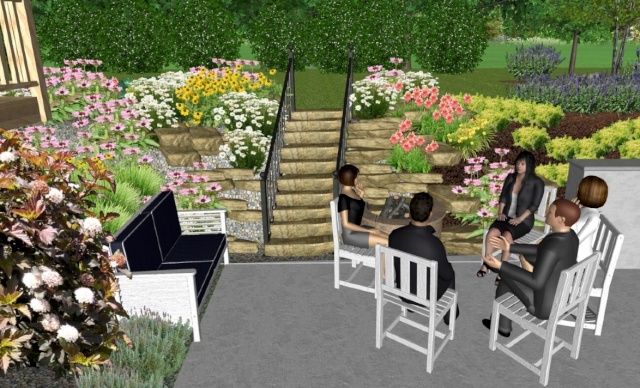 Planters, container gardens and statuary are offered to help complete the design. Retaining walls can be shown made of brick, stone or pre-cast tumbled concrete…then topped with a white picket fence and climbing roses. Outdoor furniture such as tables, chairs, swings, firepits or fireplaces and pizza ovens can be dropped into a picture of your back yard. You’ll be able to see exactly what changes can be made to your landscape. Call our office and ask for one of H&M’s trained designers to meet at your house. They will listen as you explain what you want to accomplish, take some pictures and return with some ideas that will surely dazzle you. We do it every day. 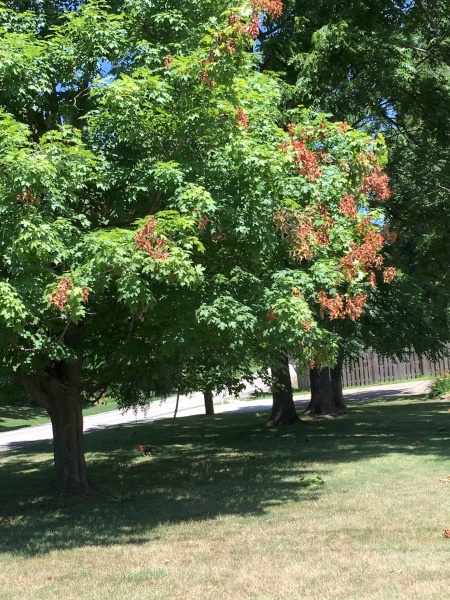 Are Japanese beetles making your plants look bad and eaten up? For the last several weeks, they are becoming a problem in the Greater Cleveland Area and I will explain what you can do to prevent and control them. Unfortunately Japanese beetles are quickly becoming a nuisance to farmers, gardeners and landscapers. Over the last few years, this pest has been making a steady migration. Japanese beetles are less than one half inch long and are metallic green. Another distinguishing characteristic for the Japanese beetle is the absence of foliage on your favorite plants coinciding with the presence of hoards of copulating beetles. In Northeast Ohio, adult beetles emerge from the ground in late May and early June. Adult beetles live approximately 30 to 45 days. Heavy feeding pressure from Japanese beetles usually lasts from 4 to 6 weeks. By September damage from the beetles has usually slowed down significantly. Japanese beetles are not picky eaters and will feed on over 300 species of plants. Foliage of roses, many tree fruits and grape leaves seem to be especially attractive to the beetles. The grubs of these beetles can also damage turf before they emerge in the spring. Japanese beetles are known to fly as far as 5 miles but one to two miles is more common. There migratory nature makes controlling the beetles very challenging. Even if you kill every beetle on your property today, more may begin showing up immediately. Japanese beetles produce aggregation pheromones which attract more beetles to feed and find potential mates. Additionally, beetles may be attracted by volatile odors produced by damaged plants. High beetle populations produce significantly more pheromones and volatile oils and attract even greater numbers of beetles. Today we are wrapping up a large renovation job in Concord Township, Ohio. 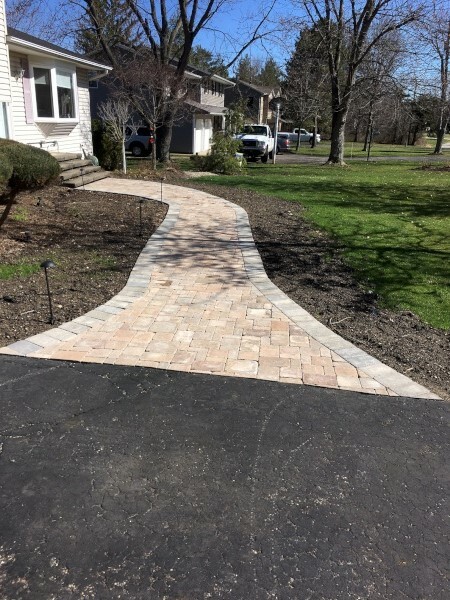 The customer had an old concrete walkway that was somewhat unsightly and looking for a fresh, cleaner appearance. Our solution was to overlay the existing concrete with 1” Full Range, Thermal Bluestone. The result is outstanding and is generally cheaper than removing the old concrete. Most times this can also be done with a paver product as well and achieve a similar result. 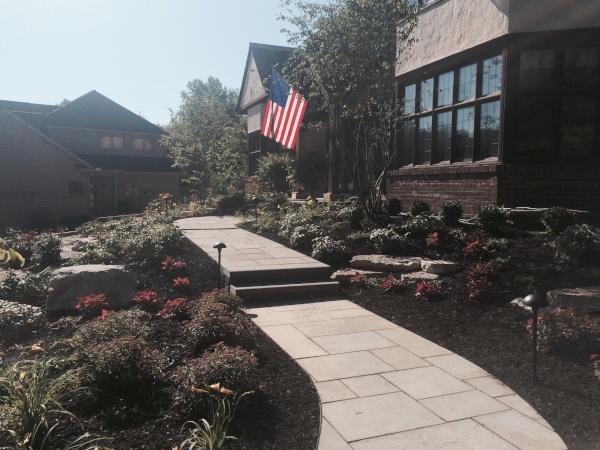 We completed the project by installing all new landscape plantings and mulch. The customer couldn’t be happier with the quality workmanship and we couldn’t be prouder of our installers, especially with the hot days recently! H&M Landscaping would love to help you plan your next project. Just give us a call and a knowledgeable designer will come out and give you a free estimate. As our world and landscape changes, life still goes on in the wildlife arena. We have developed woodlands and other areas that used to be home for a variety of wildlife. They still need a place to call home, and sometimes that is in your own back yard. The Belgard patio and retaining wall along with the new ornamental trees and bushes have now become enticing to who knows what critters that used to live in the area. Sometimes it may be food for them, other times it might be nesting areas or places to hide. If they are after food and you don’t want them feeding on your plants, you may have to go with different varieties. There are also repellants that work well. Animals like routines as well as we do. If they find something a bit displeasing, they tend to find a different route. It may be your neighbor’s place, or possibly the next block. If it is nesting or resting areas, it means that they are comfortable there. If you don’t mind the company, try to observe, but don’t bother; they will stay. I can recall a client that liked them and tried to “help” by building a man-made shelter. The nesters did not stay. Remember that wildlife is “wild” and doesn’t really want to buddy up to you. They may get used to you but will leave if bothered or the changes you make do not fit into their lifestyle. We are all just trying to make it in this crazy world, and like it or not, life finds a way. With the summer months well underway, everyone is starting to enjoy their outdoor living space as the weather gets nicer. 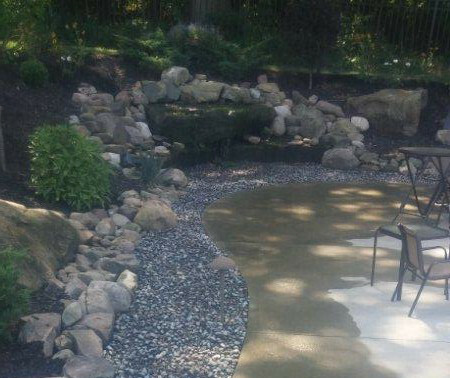 One sure fire way to bring your outdoor living area to life is with an outdoor water feature. There are many different types of water features, something a little different for everyone’s tastes. 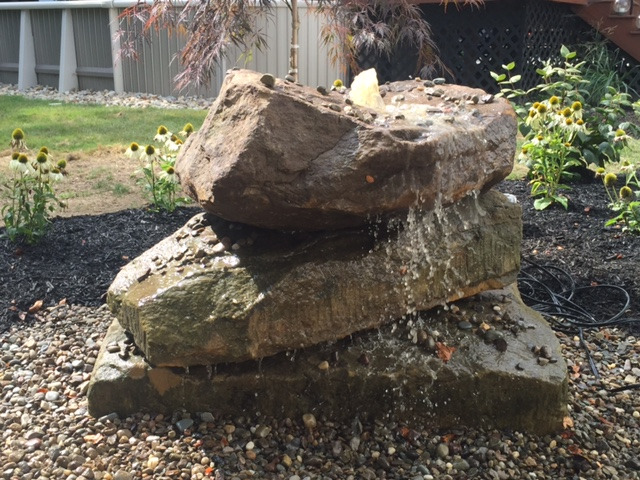 A pondless waterfall uses an underground vault that is hidden in a gravel bed to store the water feature’s main water supply. 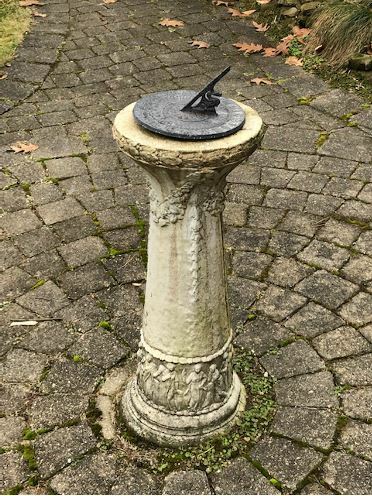 This water feature is less maintenance than a conventional water feature that has a pond because you do not have an open pond of water that is exposed to the elements and will need regular chemical applications to keep clean and clear. No matter what your budget is, H&M Landscaping can come up with a design to suit your needs and fit whatever space you have in your yard be it big or small. Give us a call today for a free quote. Now that the trees are full, you may find that certain areas of your property appear to be very dark and lacking color. How about using white-colored plants for the shady areas? 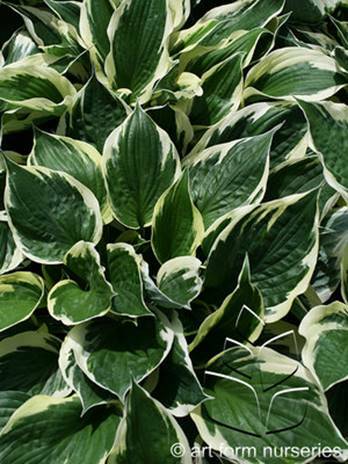 Your yard can benefit from using a variegated Hosta that comes in many varieties; one of the most popular is the Patriot Hosta. The Patriot boasts a strong white border and lasts late into fall. 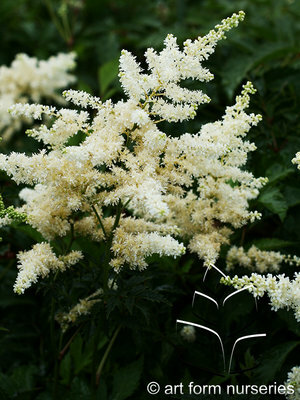 Also consider White Astilbe to brighten up and bring new life to that shady area. For design ideas for your shady or sunny areas, contact H&M Landscaping at 440-564-1157. 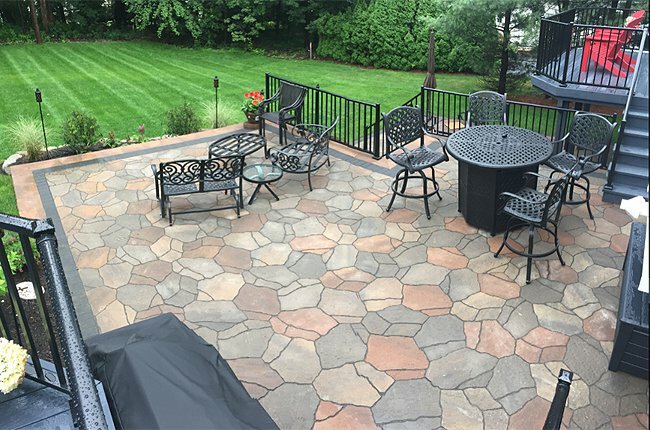 We can incorporate your hardscape design of Unilock or Belgard pavers, Versa-Lok retaining wall and your Composite deck designs with softscapes to complement and bring a whole new look to your home. This is the time of year to start enjoying time outside with your family. A perfect way to spend that quality time is with a cookout at your own custom-built bar and grill. H&M landscaping offers great designs for outdoor bar and grill areas for you to enjoy. With multiple products available from Belgard, Unilock and many natural stone products to choose from, we can build it for you. Take your pick of a counter top product such as granite, marble, sandstone or limestone. Whatever your preference, we can get the job done and meet your needs. Please give us a call and one of our sales associates can come out and help with the entire process. If you have some ideas of your own or just want to start from scratch, we are here to help you. Get outdoors and enjoy a great summer! With the heavy summer thunderstorms running through Northeast Ohio lately, you may have noticed overflowing drain pipes or gutters. Not attending to these issues promptly can lead to several serious problems in your home down the road- like wet basements or foundation failures. H&M Landscaping can take care of all your drainage needs. We use all the latest technology, including HD video cameras that can snake down and inspect drains out to 150 feet and the DJI Phantom 4 Drone to inspect hard-to-reach roofs or gutters. We can supply you with a full analysis of your house and landscape drainage system. 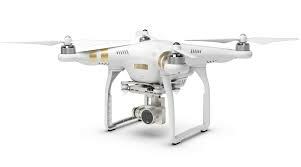 Our drone can even take full HD videos and pictures of your property for any occasion or reason. Get in touch with us today and let us help you keep your property looking good for years to come. With the heat of summer fast approaching, it’s imperative to provide proper fertilization and water to all plants, shrubbery and lawns. As we know, Northeast Ohio summers are hot, humid and dry. Plant life can dry out and die quickly. Even random thunderstorms aren’t enough to ensure the vitality of your landscape. If you have an irrigation system, it needs to be activated, adjusted and set properly. H&M can work on any system from Rain Bird to Hunter. Our irrigation crews are all over the Greater Cleveland Area servicing clients’ irrigation systems daily. 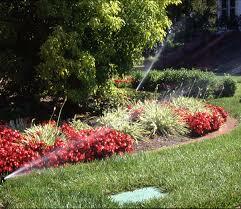 You’ve already made the investment in your landscaping- irrigation is an affordable way to protect that investment. Now that the warm weather has arrived you can easily see the ornamental grasses starting to spring up. This is a good time to check to see if the center of your ornamental grass is brown and if it is no longer a clump but more like a ring of grass; this happens as the clump ages and naturally shades out the center. If this is happening, you can have your grasses split and replanted thus allowing the grass to flush fully again and provide the same beautiful look it once had. Other plants such as perennials like to be divided too. 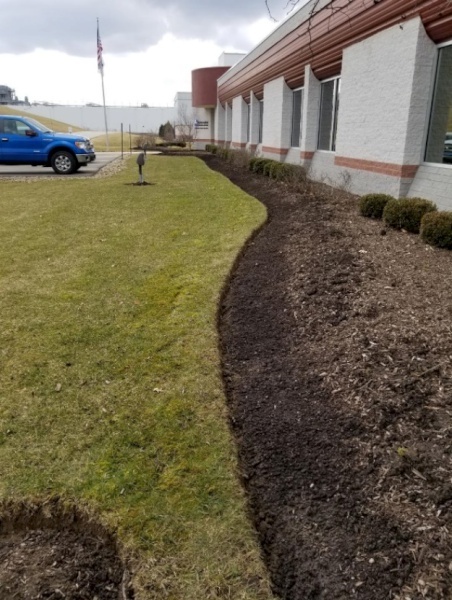 If you are not sure or would like to proceed with this type of spring landscape improvement, just contact the H&M Landscaping office and one of our associates will be happy to assist you. To guarantee that landscaping your yard or business is a success, have a plan produced by a knowledgeable and experienced designer. Be prepared to provide some basic and simple guidelines that will help get the results you want. First, admit you have a budget. Everyone has a budget but for some reason many are afraid to disclose it. Tell the designer approximately how much money you want to spend. Be realistic. This information allows the designer to produce a plan that will fit your pocketbook. Second, give the designer an idea of what you want to accomplish. If you see a picture in a magazine or book that suits your taste, show it to your designer. Better yet, start a computer file and download pix from the internet. There are millions of good ideas available a mouse click away. Open a file marked LANDSCAPE IDEAS and copy the pix to that file. Your designer will see that you mean business. Third, discuss practical problems you want to solve. Is the current deck too small? Does water pond in the backyard? 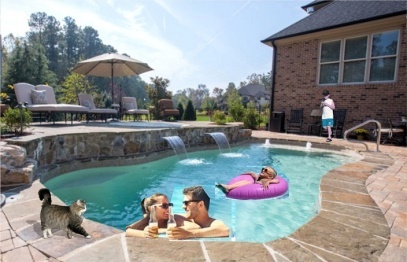 Does your neighbor throw wild pool parties that you’d rather not see? Your designer has a full palette of problem-solving remedies that have proven successful over the years. Finally, be a good client. I always tell my clients that a good client makes a good landscape. What does that mean? Your designer will listen carefully to your ideas and try to deliver what you ask for. But if he sees that you’re heading down a poison-ivied path, he’s going to tell you. He has years of experience so listen to him. You can always reject his ideas but hear him or her out. They want nothing more than to see you smile and say that you love your new landscape installation. If you are wanting to make a statement in your backyard or just want a place to sit and enjoy your outdoor living space, consider calling H&M Landscaping for a free consultation. We are currently working on a custom fireplace in Novelty, Ohio. The process started by pouring a footer for the structure. Next, we laid masonry block to create the shell. 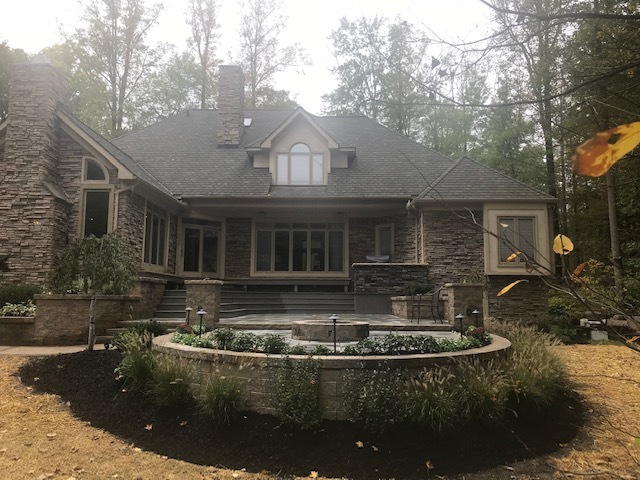 After we had the shell built and flutes installed we used natural stone to veneer the outside; (natural stone is more expensive and harder to work with than cultured stone). The benefit to using natural stone is a quality, high-end looking product that is sure to exceed your expectations. The top of the fireplace and pizza oven are topped with 2 ½ buff sandstone caps with a rock face. These custom fireplaces truly make your backyard a place to enjoy and entertain. Call today for your free quote! 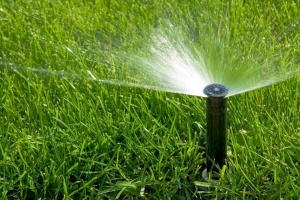 Make an appointment with one of H&M Landscaping’s experienced irrigation technicians. There is a little more to do than just turning on the water and hoping for the best. We will give you a brief description of what we call, “the H&M way of best practice.” This is also a great time to have us test your low-voltage lighting system for proper setup and perhaps upgrade your bulbs to LED lighting as most of us have done inside our homes. These bulbs are warranted for SIX years, eliminating the cost of changing burnt-out bulbs. Give us a call today to book your appointment, or email Ralph at [email protected] Thank you for your time and Happy Spring!! Why do the work yourself when H&M can do it for you? 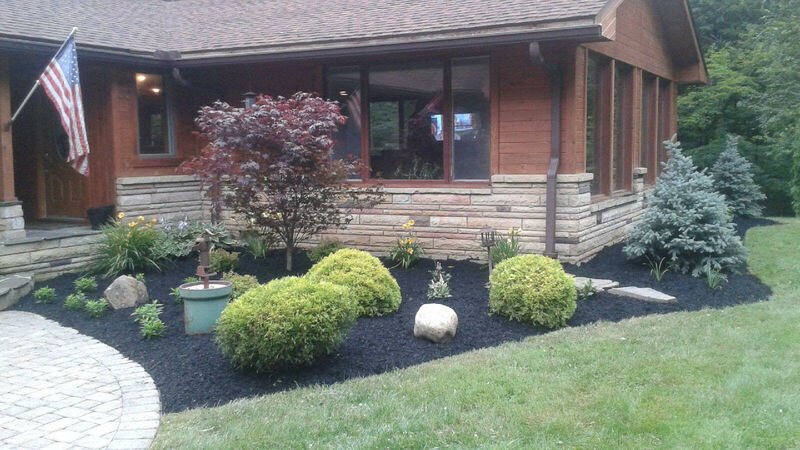 Today, we satisfied another Cleveland Area customer as we pruned, edged, mulched and mowed their residence. 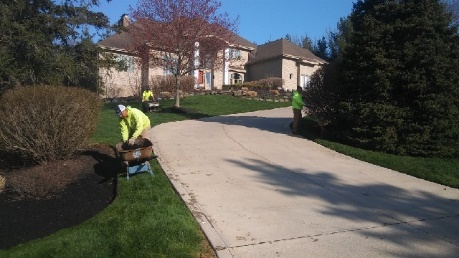 With many of our staff being Certified Landscape Technicians, we ensure accurate pruning, crisp landscape edges, premium mulch and fresh, straight commercial lines in your lawn- alternating every week. We pride ourselves in being a detail oriented landscape company and want to be a part of beautifying your residence or commercial facility. Call H&M Landscaping today to schedule a free estimate for all of your landscape needs this year. 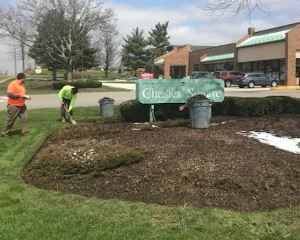 With our seasonal help back in Ohio for the next 7 months, we are geared up to complete spring clean-ups and mulching! Beyond the nice seasonal color that fresh mulch offers, your plants need the nutrients that decomposing mulch provides. Also, most customers opt to have H&M Landscaping put down a granulated fertilizer to give their plants an extra boost of growth and strengthen color. An application of a weed prevention barrier product to limit weed growth for the year is also helpful. Call one of our team members today and we will gladly provide a free estimate for any of your spring landscaping needs. Northeast Ohio: Has Spring Finally Arrived? Driving around today on a beautiful 70-degree day made me anxious to see spring colors and nice green yards. Maybe you are hoping for that same transformation at your property. Have you done what is needed to reach these expectations? Soil needs to reach certain temperatures to achieve this transformation. Do not overfertilize early trying to help things along. When the grass does begin to push growth, if too much Nitrogen is around, you may have a very difficult time keeping up with your mowing. Remember, never remove over 1/3 of the grass blade at one mowing. Ornamental plantings will do the same in the spring…push fast as temperatures warm. Overfertilizing can push excess growth and hinder blooming down the road. If your plants and lawn were not what you were looking for last season, get on a program to address those issues. 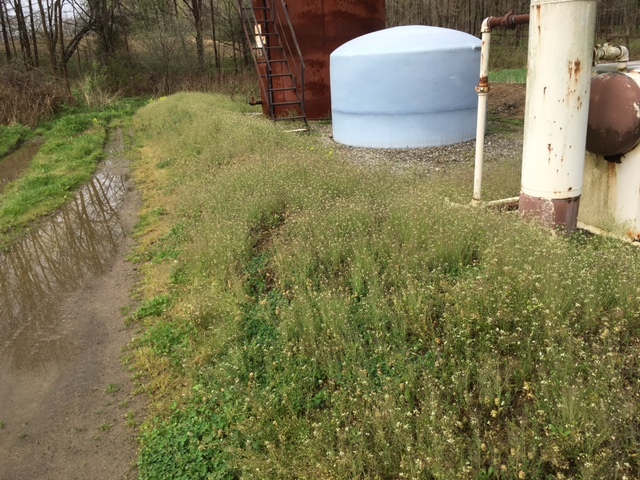 If weeds were a problem, one treatment will not clean things up. 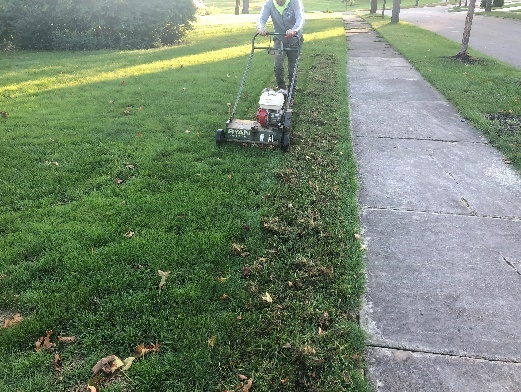 Residential lawns in Northeast Ohio with issues need at least five visits, with the first one being crabgrass control. Successive visits with a broadleaf weed control will help your lawn show marked improvement by fall. Feed the lawn. But as stated above, heavy spring fertilization can cause big problems. A light feeding program throughout the year with a heavier application in the late fall is the best course of action. Do some research. If you only feed once a year, this is the time to do it. Core aeration should always be considered as it is one of the best things you can do for the health of your turf. Prune ornamentals properly and at the right time to maximize blooming and health. Enjoy the outdoor living space you have created. A beautiful landscape can best be enjoyed on the back patio with friends and family. We put so much time and effort into making our backyards enjoyable spaces to relax. Despite many outdoor living conveniences, a common problem remains. Pesky mosquitoes prevent us from using our outdoor living spaces to the fullest, especially given heightened concerns over mosquito-borne diseases. H&M installs both lighting and mosquito protection systems powered by low-voltage electricity. 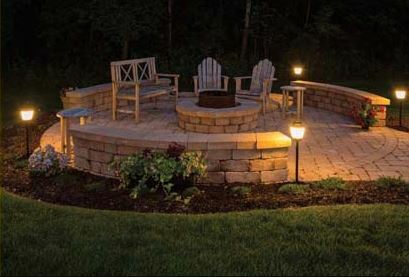 Nu-Tone Haven fixtures can provide backyard lighting and mosquito control all in one system. This new technology allows for more time spent outdoors without the nuisance of bugs biting. Each Nu-Tone Haven fixture contains a mosquito repellent cartridge. When the system is turned on, low-voltage electricity heats the cartridge, which produces a repellent vapor. Each fixture fends off mosquitoes within a 110 square foot area and four to five fixtures provide enough coverage for the average deck or patio. This product eliminates the need for sprays, messy traps, fuels, candles and torches by providing effective, convenient, season-long mosquito protection in one complete system. With the flip of a switch of the automatic optimal timer/control, the emitter delivers an odorless, silent and invisible vapor to repel mosquitoes. Call H&M today for a no obligation quote and you'll be well on your way to a bug free summer! With the nice weather just around the corner, now is the right time to get your outdoor living space in order and ready for entertaining. Depending on the age of your patio, there might be some low spots that need attention before we get to the beautification part. Our specially trained crew will carefully disassemble the patio where needed and re-level the sub-base to promote proper drainage and restore the original look to your backyard living space. After all the re-leveling has been done, the next step is to power wash and clean the entire patio surface. Over the winter months, leaves and debris sit under the snow pack on top of your patio and sometimes cause surface stains. 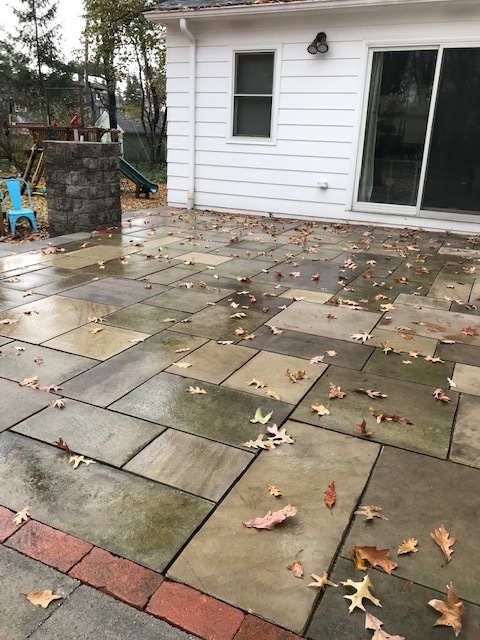 A good power wash using some of the Alliance brand products (such as Alliance gator clean oil and grease cleaner), will guarantee a good overall result for your patio and stone surfaces. The final step is to sweep Polybind Polymeric Sand into all joints. Once properly installed, the sand sets to near concrete strength- not only binding the patio together, but keeping weeds, ants and other insects from finding their way into your patio joints. Call H&M Landscaping today to set up an appointment with one of our experienced landscape supervisors to see what beauty we can bring back to your outdoor living space for the upcoming summer season. People want to accessorize their backyard with amenities these days, and increasingly, firepits that have a crackle and glow are more popular than ever. An outdoor firepit will add a focal point to your outdoor living space without spending top dollar. Something to consider (which will effect total cost) is choice of wood verses a gas-burning firepit. Of course, your choice should be based on your space, budget and local ordinances. Here at H&M Landscaping, we can help create what you have envisioned. With one phone call, our specialists will gladly help with this entire process. It’s Almost Pool Time in Cleveland! 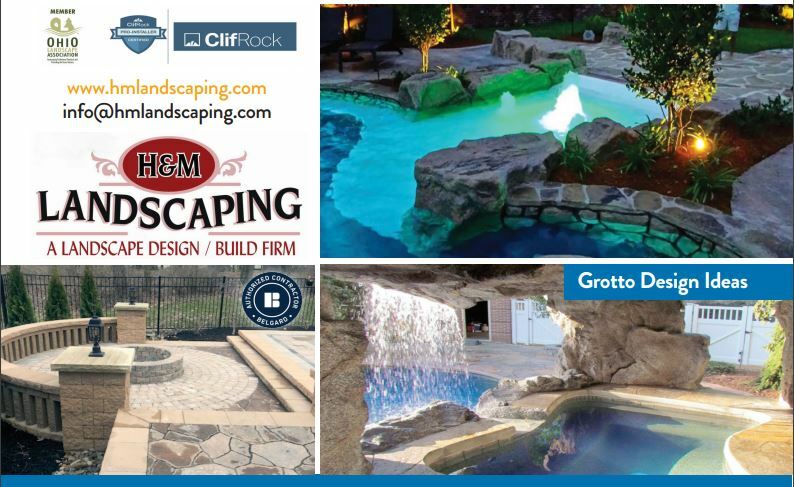 Now is the time to contact H&M Landscaping for your new backyard pool and waterfall. Here is one we built in Hudson, Ohio and we have designed and built many others in the Cleveland area. We can work with you to design almost anything imaginable and use quality Pentair pumps and filters, as well as the latest IntelliTouch automation. We can also retrofit your existing pool with a new, more efficient Pentair salt water system- so no more adding expensive chemicals like chlorine! The warm weather will be here before you know it. Call us today for a free estimate on a new pool or to see how we can update your current pool to be more cost-efficient and easy to use. • The H2B Visa program isn’t an immigration issue; the workers return home at the end of 8 months. • Companies are put through a rigorous recruiting and hiring process by the Department of Labor to screen and hire for the positions before being granted acceptance into the program. These individuals fill seasonal work needs that companies can’t fill, even after aggressive recruitment monitored by the Department of Labor. 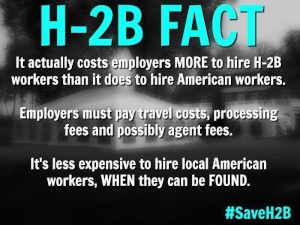 • H2B visa workers aren’t cheap labor. They receive a Federal prevailing wage determination based on the average wages of the counties they’ll be working In. This season, this wage is $12.98, nearly 70% higher than the Federal Minimum Wage of $7.25. • H2B workers pay Federal, State and Local taxes and pay into Social Security and Medicaid. They are not eligible to receive Unemployment or Social Security Benefits, so it is a double positive payment into the system. • Every H2B Visa supports many full-time jobs in the Cleveland area- with 4.1 million total in America. With our Northeast Ohio winter progressing much as usual: freeze, thaw, snow, sleet and rain- we spend most of our time cooped up indoors. You may have visited the National Home & Garden Show at the Cleveland I-X Center and are pondering home renovations or new construction ideas. This year's show featured many hardscape manufacturers in the landscape industry, including Unilock, Versa-Lok and Belgard. Regardless of what it is you wish for, now is a good time to look for outdoor furniture- both online and at your favorite outdoor furniture store. Be sure to factor in the number of people you expect to entertain this spring, summer and fall. 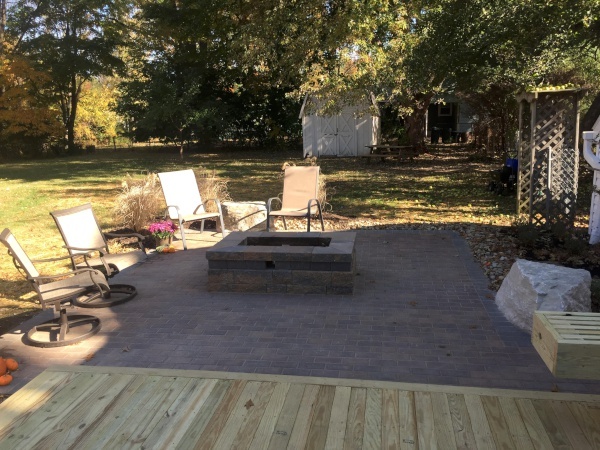 Once you have chosen a set, you may require the assistance of a landscape designer who can help with the layout of that Unilock patio, and plan a comfortable dining area. In addition, a landscape designer can guide the optimal placement of an outdoor kitchen and suggest beautiful built-in amenities, such as Fire Magic Grills, to best suit your entertainment needs. Whatever additions or upgrades you are seeking for your outdoor living space, H&M Landscaping is here to help. Call us today, before the rush, to design and provide a free quote for your spring and summer projects. Don’t Deck the Halls, Trex the Deck! The backyard deck is a staple of many landscape designs. Decks are a great place to enjoy warm summer days, grill some burgers and just plain relax with a glass of iced tea or lemonade. The major improvement in deck construction in the last couple of decades is the availability of high-quality manmade materials. A leader in that field is Trex, the world’s number one decking brand. Trex has been making their composite products since 1996. 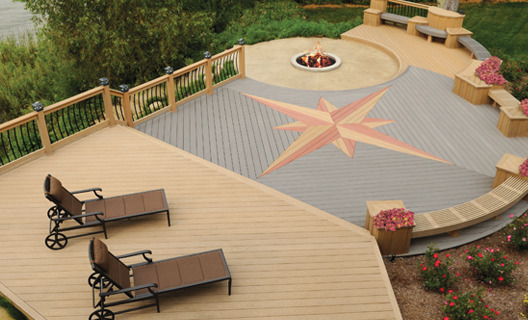 Trex decks are eco-friendly and low maintenance, extending deck life and requiring less work for the homeowner. Trex products include deck framing systems, deck planking, deck railings and fencing. Fascia boards, spiral stairs, hardware and aluminum gates are just some of the accessories that Trex offers to complete the job. Trex products come in a broad spectrum of colors and textures. The full material palette means the designer has plenty of options with which to satisfy every client’s project whims and requests. H&M Landscaping designers are experts in that department. Earth-tone planking with exotic names like Spiced Rum, Tree House, Tiki Torch, Island Mist and Beach Dune make for some fun decisions. 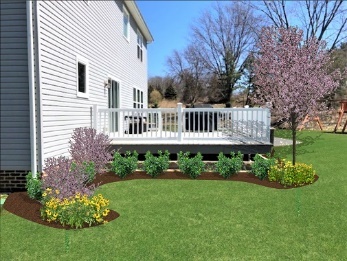 Imagine an Island Mist deck combined with white railings. The result: a bold design statement in your backyard. 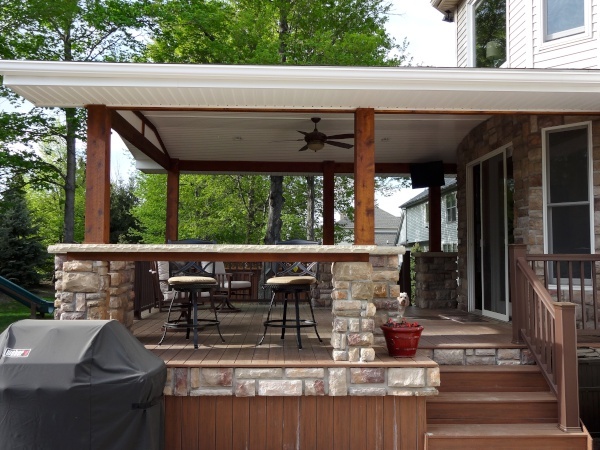 Custom overhead pergolas and built-in bars can be added to your new Trex deck. Fire pits, grills, low-voltage lighting and a water bubbler complete the outdoor room. 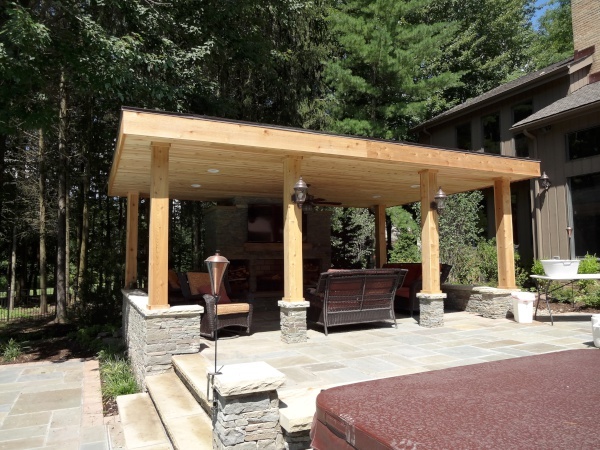 Imagine an old fashion hammock or swing suspended from the beams of your Trex-built shade canopy. At dusk the lights turn on from a pre-set timer. The evening enjoyment of the deck includes a twilight dinner under the stars. 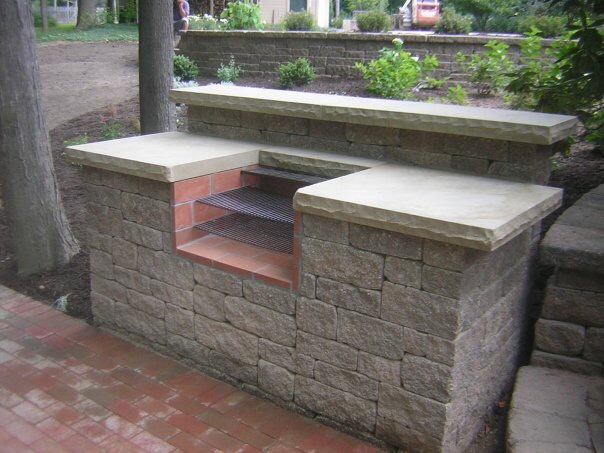 The center piece of your new outdoor kitchen designed by H&M Landscaping may well be a Fire Magic Grill. 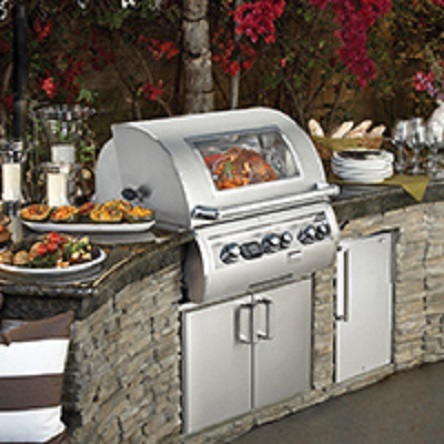 Imagine placing steaks, ribs, chicken or veggies on a sizzling top-of-the-line gas grill. The Echelon Diamond is the best built-in Fire Magic Grill model. It is for those discriminating grillers who know that grilling is not just about cooking meat. It’s a way of life, a life-style choice which demands wind in the hair while flipping a burger. The Echelon Diamond is for those discerning chefs. The Aurora, on the other hand, is a stand-alone grill with just as much heat-generating power as the Echelon Diamond. No T-bone will be safe in its presence. And you can move it to the shelter of the deck when the snow makes backyard grilling a frozen improbability. If smoke is your preference, and slow cooking suits your personality, Fire Magic Grills has you covered. High-performance charcoal grills and smokers are available in built-in, drop-in and stand-alone models. Other Fire Magic Grill options make grilling a blazing breeze as well. Value-priced Legacy grills are ideal for smaller spaces. If the condo association or apartment manager forbids gas grills, Fire Magic Grills are available in electric models. Accessories include side grills, ideal for taming a fat slab of tuna. Refrigerators, beverage centers and drawers can complete your backyard kitchen. Smoker baskets, griddles, woks, grill lights and insulated liners are just a few of the extras that can be added to make the chef’s fun complete. Fire Magic Grills have been around for 75 years with with several distributors right here in the Cleveland area. 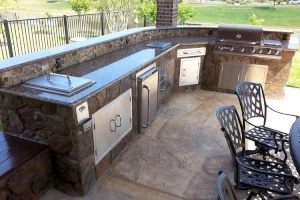 Let H&M Landscaping build your dream outdoor kitchen- using top-quality products unsurpassed in the industry. Call us today and get ready to grill. Can you imagine sitting poolside in Hawaii basking in the sun with a cocktail in your hand? I sure can!!! We can’t take you to Hawaii, but H&M Landscaping can bring the pool to you. H&M Landscaping has the perfect answer to your February blues. Blue Hawaiian Pools come in a variety of shapes – natural, classic, rectangular, freeform and kidney. If none of these shapes suit your image of the ideal pool, H&M can design a custom shape to meet your specifications. 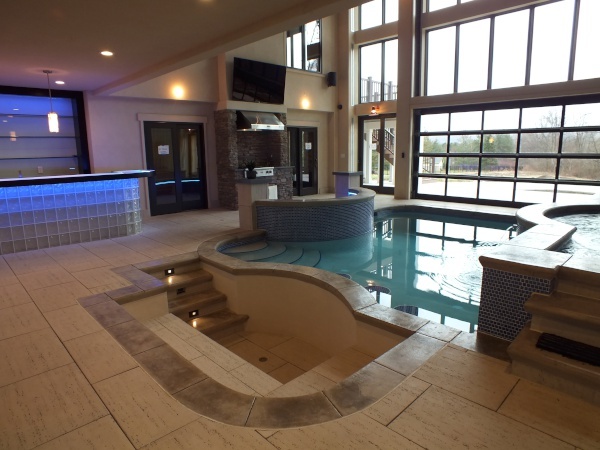 Specialty installations like lap pools, spas and swim spas are also available. Streams, cascades, bubblers and an infinity edge can give any Blue Hawaiian Pool a truly unique look. Kichler LED lighting controlled from your smartphone or tablet adds color and intensity for nighttime enjoyment of your new outdoor living space. The deck surrounding your new Blue Hawaiian Fiberglass Pool can be as varied and creative as the pool itself. H&M Landscaping crews have years of experience installing everything from stamped and tinted concrete, to Bluestone to Unilock pavers. All work is done inhouse by H&M Landscaping employees -- not subcontractors -- so scheduling is on-time and on-budget. The advantages of Blue Hawaiian Fiberglass Pools are substantial. Blue Hawaiian Pools require minimal maintenance as compared to concrete pools, and they don’t need resurfacing. Blue Hawaiian Pools support less algae, so they need less chlorine, which is healthier for you and the environment. We can also add a salt generator to lower your pool maintenance. Safety is always a concern when installing a pool. Secure & Clean automated custom pool covers ensure that your children and pets are protected. Strong enough for a family to stand on, pool covers create a barrier that guarantee safety. 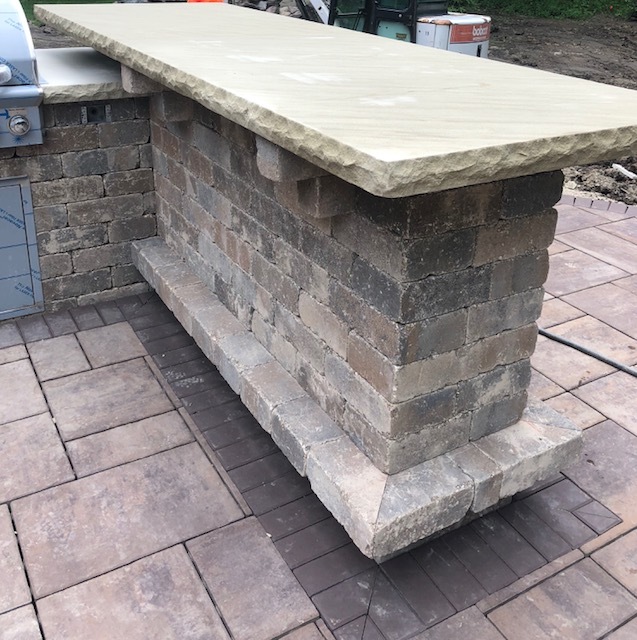 Just when you thought you couldn’t enjoy your back yard anymore, why not add a built-in Fire Magic Grill, a bar and seating area crafted with cultured stone or Belgard dry-stack wall materials. Your back yard will truly become your staycation spot for relaxing and entertaining. Why wait? You’ve always wanted your own. Call H&M Landscaping today for a quote. Come Memorial Day, you’ll be glad you did. One sure sign that spring is coming is when the first crocus sticks its head above ground to gauge the snow depth. This is soon followed by daffodils, hyacinth, narcissus and tulips. Everyone loves spring-blooming bulbs. If you didn’t get your bulbs in the ground last spring, don’t despair. There are spring-planted bulbs that will bloom this summer. Wait until late spring rather than getting your hands dirty when the last snow melts. Let H&M Landscaping, Cleveland’s premier landscaper, help you make the best selection of bulbs for your area. Dahlias, peonies, alliums and ornamental onions are popular summer bloomers in hardiness zone 6. Another option is to start them in pots in a warm spot in the house and move the plants outside when the weather is warm and there’s no risk of a late frost. Whether you’ve started them inside in pots or outside in the ground, give them some general use fertilizer. That will help with stronger growth and a fuller head of flowers. Less common in hardiness zone 6 are calla lilies and agapanthus. They are considered annuals and likely won’t survive our winters outside. Each plant is interesting for different reasons. The calla lily – which is not a true lily -- comes in a variety of pastel colors that unwraps as it matures. The light green foliage is marked by numerous small white splashes. Place the rhizomes about 3 inches deep in warm sunny spots, in well-drained soil. Fertilize monthly and water weekly if they don’t get rain. Move them indoors at the first frost. Wrap them in peat moss and store in a cool dark place before replanting next spring. Calla lilies are also great house plants, or they can be set outdoors in pots in summer. Stop watering and place them in a darker spot after they fade. Agapanthus, known as the Lily-of-the-Nile, is unique because of the color of its flowers. Agapanthus blooms vary in hue from white to blue and purple, and it’s their blue color that makes them stand out. The foliage is bold, waxy green. They are hardier than calla lilies and the rhizomes can be planted outside in late spring. Remove from soil, place in pots and store out of sunlight all winter. Agapanthus easily divide which makes them ideal for propagation and transplanting. Whatever your need may be, H&M Landscaping is here to help you. Give us a call today. There’s a foot of white stuff in the driveway. Drifts of snow curl around pine and spruce. The roads are edged with blackened slush. Unseen, neighborhood squirrels and sparrows snuggle in their lairs. Howling winds take the shine right off your shoes. It’s that time of year – December, January and February -- when everyone is thinking about landscaping. Right? Wrong. If you are considering landscape improvements to a residential or commercial property, the dead of winter is the ideal season to contact one of H&M Landscaping's sales associates. He or she will be pleased to hear from you. Thinking of a new patio with concrete pavers or fired brick, or maybe Bluestone or textured and tinted concrete? Now is the time to call. 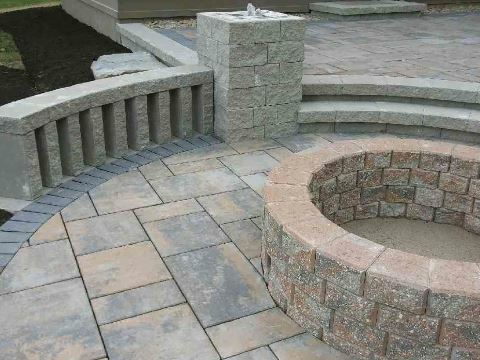 One of our experienced sales associates will work with you to design the ideal patio – shape, size and top quality materials like Unilock pavers, retaining walls and fire pits. How about coming home to a complete outdoor living space using Belgard products? Or maybe a built-in gas grill with masonry walls and a granite top is on your wish list. We will be happy to prepare your drawings and pricing and you’ll be first in line when the robins return. You’ll be grilling while the neighbors are still waiting for other contractors to come out and look at the site. Would a fresh lawn and new plantings make the yard a pleasure to enjoy? It’s hard to imagine with all the snow covering the Petunias. H&M is ready to survey your property and develop a plan for installation in the spring. Is there a water feature in your future? Will the soothing sounds of a fountain or Koi pond or waterfall ease your daily stress? Call H&M today. We can put together a bid for your new water feature or Aquascape Koi Pond that will make you the envy of your neighborhood. 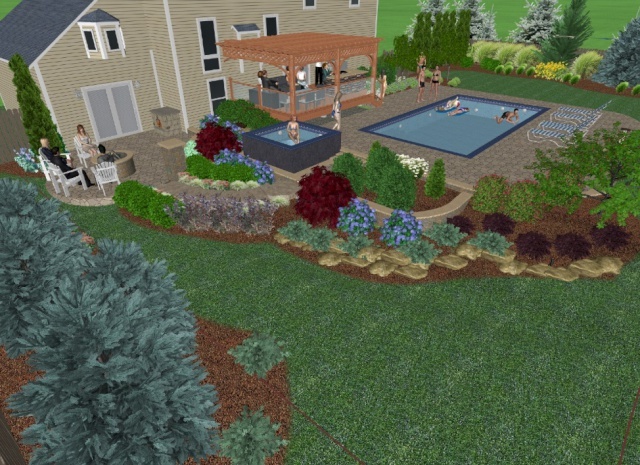 H&M Landscaping designers use DynaSCAPE and Google Sketchup, state-of-the-art design software that produce color drawings and plans. 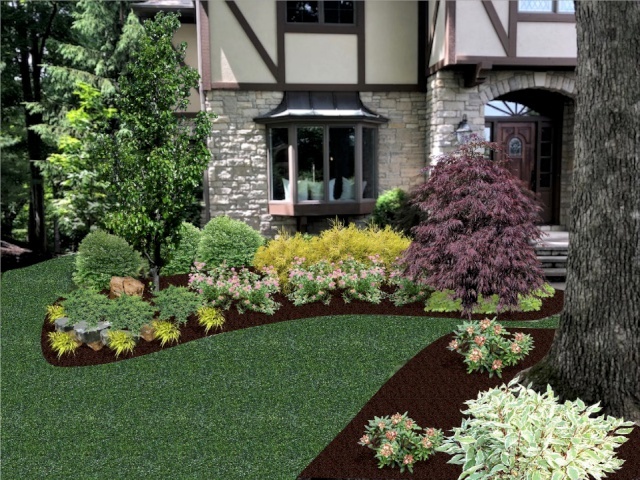 Idea Spectrum Realtime Landscaping software produces before and after color photographs of new landscape designs. These professional design tools eliminate uncertainty, allowing the landscape consumer to easily understand the impact on their property. 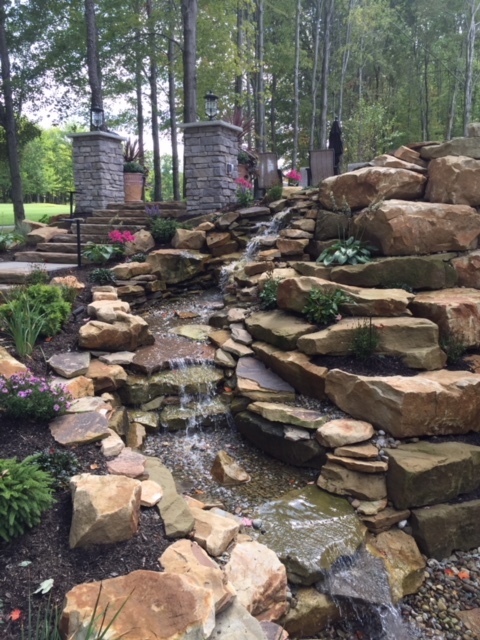 H&M Landscaping services Moreland Hills, Chagrin Falls, Hunting Valley, Pepper Pike, Lakewood, Geauga County, Lake County, Summit County and all the other Cleveland suburbs. When the weather breaks in the spring, landscape designers and contractors are swamped with calls. So why wait? Shrewd landscape consumers know that when the snow flies that’s the time to buy. Call H&M Landscaping today and jump to the front of the line. It’s that time of year again. 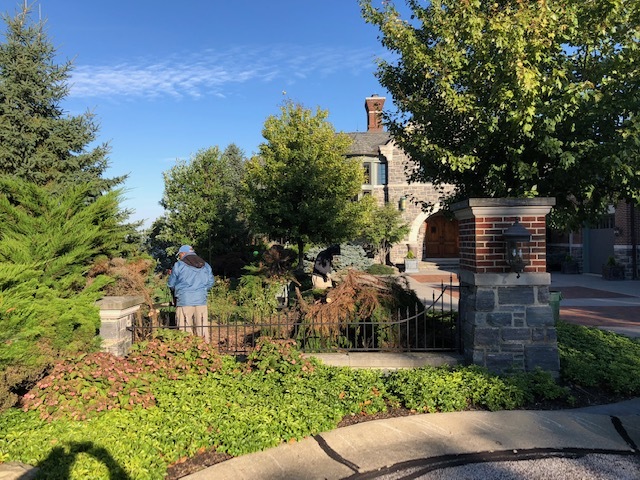 We have been busy at H&M Landscaping doing fall clean-ups and removing ornamental grasses and perennials to prep for winter. Our maintenance and enhancement crews are visiting customers on a weekly basis performing fall clean-ups before lawn maintenance is started. This ensures a clean look for your yard throughout the season. It also helps to prevent leaves from building up which could potentially cause damage if left on the lawn for a long period of time. Our maintenance crews are using the latest equipment, including backpack and push blowers to get the job done. Please reach out to one of our sales representatives for a free fall clean-up estimate. Enjoy your beautiful lawn and let H&M take care of your landscaping needs. Our carpentry crew finished a small set of steps and a railing for a customer just outside of Cleveland. This project called for premium pressure treated lumber for the framing materials. 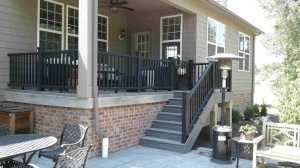 For the decking we used "Amazon Mist" color composite by TimberTech, as well as black Radiance railing by Trex. The customer had us also install a gate at the top to keep her pets and future grandchildren contained. This is a small carpentry project that can be completed in just 3 short days. Call any of our knowledgeable team members to set up your free estimate today! What is the definition of Core Aeration? Core aeration is done on turf areas as a means of reducing turf compaction, reducing thatch buildup, improving the infiltration of water/nutrients, encouraging deeper roots and creating an environment where grass seed can have direct contact with the soil. When is Core Aeration typically done? The best time to aerate your lawn is during the growing season. This is so your grass can heal and fill in any open areas after soil plugs are removed. The most ideal time to aerate your lawn is with the cool season grass in the early spring or fall, and those with warm season grass in late spring. You should avoid aerating a warm season lawn when it is dormant because it may encourage weed growth. Why do you need to Aerate? Aeration will help to relieve soil compaction. Compacted soil prevents grass roots from establishing a healthy root system and will keep water and fertilizer from reaching the plant roots. Compaction can be caused by many things - high traffic areas, play areas and new construction from heavy machinery being driven over top. Aerating will help with thatch buildup as well. Thatch is the accumulation of decaying plant material and clippings. If you allow thatch to build up it will prevent air, light and water from reaching down to the plant roots. What can you expect after aerating your lawn? Right after your lawn has been aerated you will see small plugs lying on top of your grass. With time these plugs will break apart and disappear back into your lawn usually within a couple of weeks. In 7-10 days the core hole will start to fill up with the grass plant roots. The roots will then start to acquire more water, air and nutrients. You will see an increased amount of time between waterings on your lawn without showing signs of wilt. 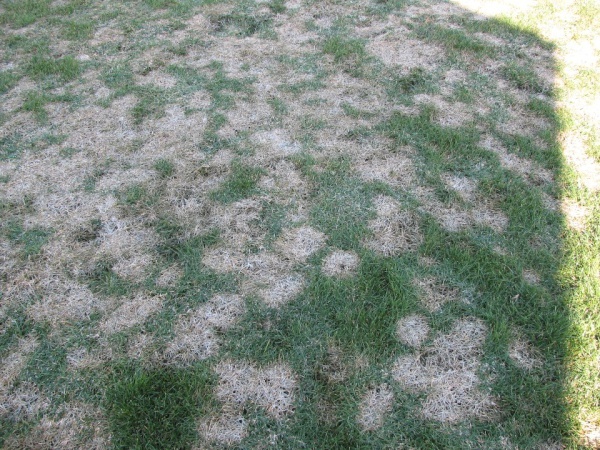 We have been fielding multiple questions this year about “dead” or “brown spots” in lawns. 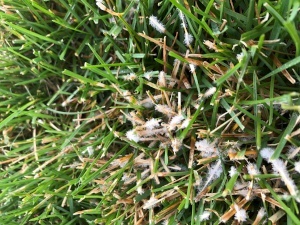 The majority of the time the cause has been Dollar Spot Fungus. There have been other active diseases out there this year, but I want to focus on this one in particular. Dollar Spot –sclerotinia homoeocarpa-loves high humidity and warm daytime temperatures. It gets its name because of the silver dollar-sized spots it produces. As is the case with most fungi, the amount of time that the leaf is wet is the triggering factor. Anything you can do the keep the leaves dry is huge. Do not water late in the evening as the leaves will stay wet all night. Do not start the irrigation cycle too early in the morning. If you have to start early, change your zones from time to time so one area is not always the one that is wet the longest. Deep, infrequent irrigation is better than light frequent cycles. 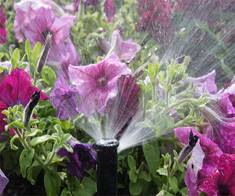 When the weather is sweltering, consider turning off irrigation or just using light syringe cycles to cool the plant. Plants do not respire (breathe) well in this environment and excess water does not help. Improving air movement can help to dry leaf blades. Consider removing some lower limbs or even entire trees to alleviate humid pockets. Manually removing the dew is very helpful. Ropes, whipping poles and mowers can be used. An annual aerification program is one of the best things you can do for your lawn. It removes excess thatch, improves drainage and air movement. This is a very helpful tool to help relieve some fungal pressure. Attached is a picture of classic Dollar Spot in the mycelium stage. Mycelium is active fungi attacking your plant. You normally see this white, cottony look in the morning because the leaf blade has been wet long enough for the disease to start to grow. Dollar Spot does not affect roots or crowns. The blade withers back, but your lawn is not dead. A light, frequent fertilization application along with proper irrigation (or cooler fall temps) and your lawn will recover nicely. 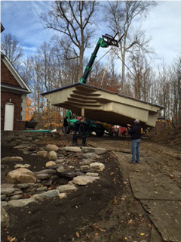 H&M landscaping had the pleasure of working with Otero Homes at this customer's house in Bainbridge Township. The old outdated patio was removed and the footprint made larger for this beautiful two-tiered patio. The walls are made from Belgard's Wellington Wall in Ashberry Haze color. 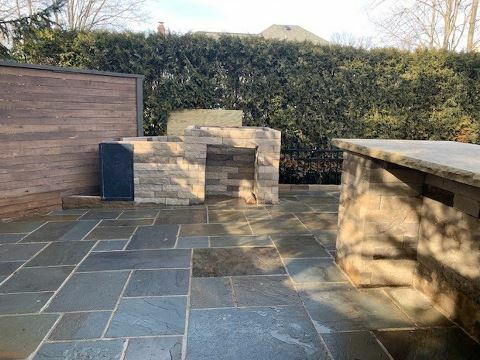 The patio fields are Mega Arbel also from Belgard in 3 colors, Cotswald Mist, Ashbury Haze, and Fossil Beige with a Techo-Bloc Black Onyx paver border. The project was accented with some light plantings, and the entire yard was re-done with brand-new sod. If you're interested in updating your old patio or need assistance with any other yard projects, call H&M Landscaping today for a free quote. Do you have stressful days? 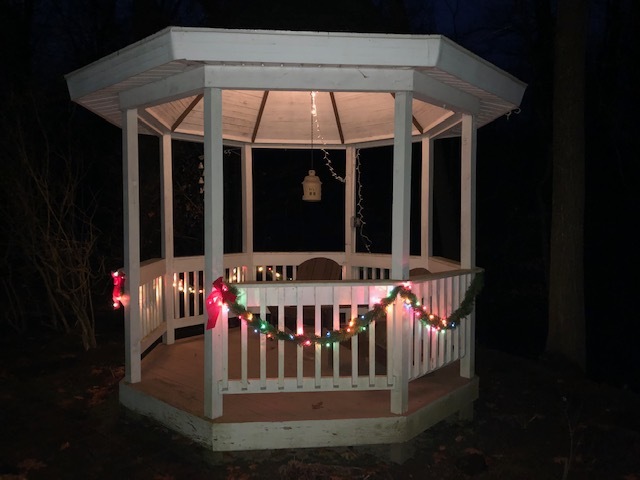 Are you retired and looking for something peaceful to enjoy? Or do you feel as if your landscape is missing something? Think of the serene and relaxing sounds of a waterfall. People travel all over to see waterfalls. They amaze at their beauty and listen to the peaceful water rushing over the edge. 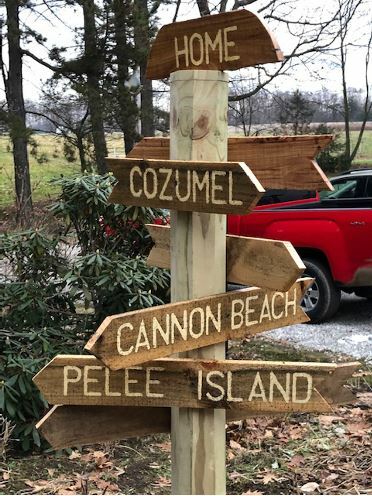 Adding one to your yard may be the perfect touch. H&M Landscaping can help you pick the perfect location by a seating area or window and where best for daily enjoyment. We can then plan and design a custom waterfall. It can be flowing into a pool, into a babbling brook or a pond. 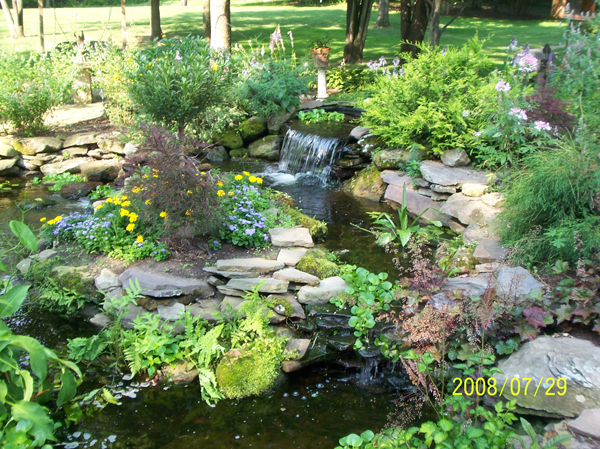 We can even do a pond-less waterfall that does not need to flow into a pond of water. Call us today for all your landscape needs. The last several weeks has been very hot and dry in the Greater Cleveland Area. Our staff has been busy completing irrigation system activations and repairs from our harsh Northeast Ohio winter weather. Our technicians are well versed in working with any type of system, from Hunter to Rain Bird. Whether you have a drip system, pop-up heads or rotor gear drives, you should have it inspected and adjusted. Even If winterized properly, moisture can still get into lines and heads and the cold of winter can wear on fittings and seals. Many times there are hidden problems that could be costing you money in lost water or improper coverage, leading to mortality of plant material and your lawn. It is recommended that you seek professional advice from an expert that knows what to look for. If you have any questions or concerns about your system, please call H&M Landscaping and schedule a service call today with one of our irrigation experts. 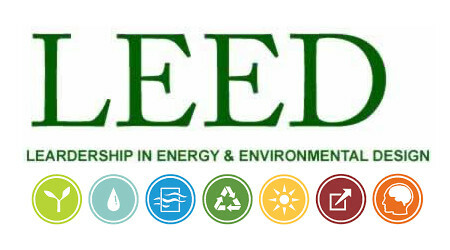 H&M Landscaping is currently working on a Leadership in Energy and Environmental Design (LEED) project in Canton, Ohio. H&M received its LEED certification two years ago with our first LEED project in Chagrin Falls, Ohio. With more of our clients wanting to use sustainable landscape solutions, we felt it would be beneficial to train our staff and offer LEED landscape projects to our customers. 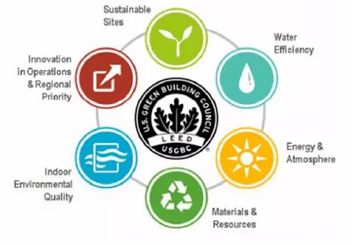 The requirements for a LEED project are permeable pavers, rain gardens, utilization of eco-irrigation, minimization of hard surfaces, utilization of drought-tolerant plants and other landscape-sustainable techniques. H&M Landscaping has used many of these practices on several different sites in the Cleveland market. 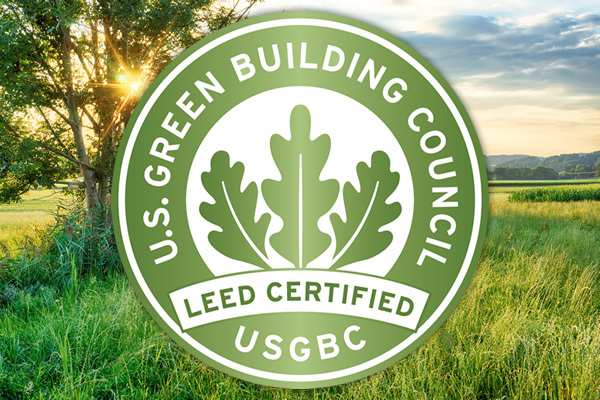 As our company has grown and we have partnered with many landscape architects and engineers, we have been introduced to a myriad of LEED-qualifying products such as Belgard Eco-Dublin Stone, Sitedrain, Tufftrack and many more. We also bring our yard waste back to both of our facilities in Newbury and Bedford so we can compost them. After they are composted for a year, we have them ground up and then mix them to be used as mulch. This recycling system allows us to use about 5,000 cubic yards less than if we didn’t compost. Call us today if you would like to have one of our associates come out and show you how you might be able to protect the environment for future generations. 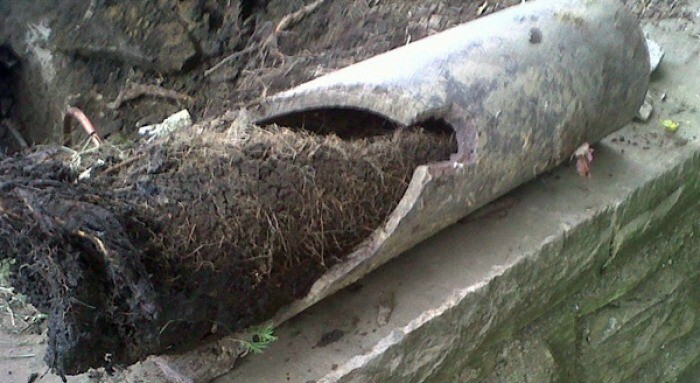 A customer in Twinsburg was having severe water problems in their front culvert. If you're going to fix a landscape drainage issue right, you might as well do it right the first time! H&M Landscaping first started out with completely clearing the area of all unwanted vegetation. With a fresh clean slate, we carved the front culvert out to widen it and make it easier water to flow. Bringing in almost 100 ton of natural sandstone boulders, H&M created a waterfall like setting. 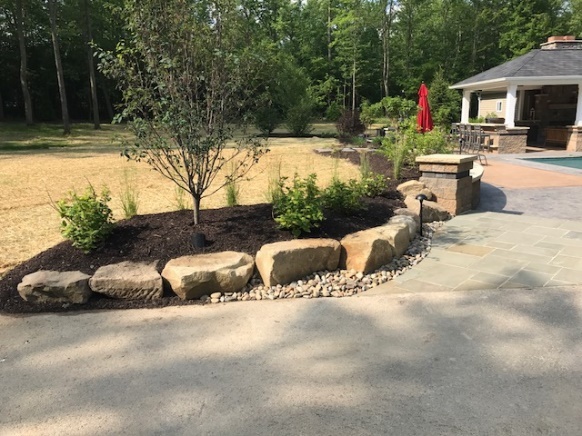 With the installation of some washed gravel pathways and selective plantings (that do not mind wet environments), our landscapers were able to create an natural park like environment in our customer's front yard. To top it off, this project called for a custom made bridge from our carpentry department. If you're having any troubles with water drainage or any other yard projects, call H&M Landscaping today for a free quote. Turn your back yard into something special, or breathe life into an existing patio. 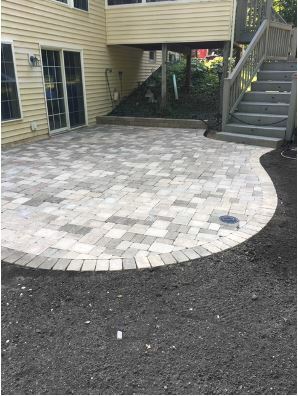 At H&M Landscaping, we have an experienced team with a keen eye for innovation to help with something special, like pavers, natural stone and stamped concrete. We can build it in any shape or size and design it exactly to your specifications. Living Space: More living space can open up opportunities to entertain virtually any event for family parties or a simple get-together, such as a barbeque with your friends. Your guests will love being able to enjoy the nice weather on your patio. Design Statement: Offering any shape, size and design, a patio gives you the opportunity to design your own unique space. 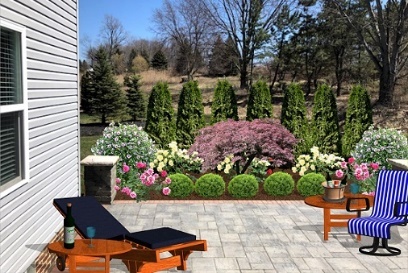 We can help you build your patio anywhere you would like to highlight landscaping, add privacy or more importantly, to make a certain area in your outside more accessible. Increase the Value of Your Home: Adding an outdoor living space is an easy and affordable way to increase the value of your home. Plus, if you ever go to sell it in the future, buyers will be willing to pay a little extra for your home because they will love the fact that there is the additional outdoor patio space. Call H&M Landscaping today for a free estimate to design and install a patio for you. What can H&M Landscaping Build for you this Year? Well, here we are, another Ohio Spring is upon us. We must all ask ourselves: what are we doing different this year from previous with our yard? 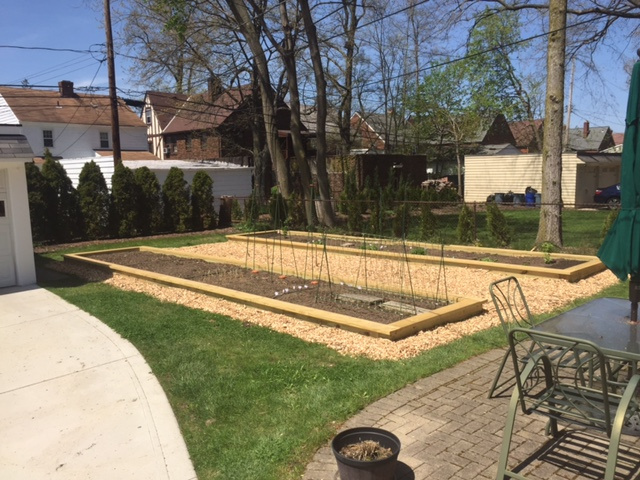 If you are like me, you are planning on when you will be doing your mulching and any planting bed changes for the year and thinking about the upgrades you would like to do. With the limited time that we all have these days, it's nice to have a company that you can trust to take care of your lawn. With all of the services H&M Landscaping provides, we are always striving for perfection! If you are thinking about finally doing that composite deck, new privacy fence, pergola over your patio, or even something as simple as installing new gates to keep your pet in the backyard, we are the guys who can give you the most affordable options. Call me anytime to ask for my thoughts or opinions on a project or if you would like me to stop out and provide a free quote. Remember, H&M serves our customers needs first. Hope to talk to you soon! 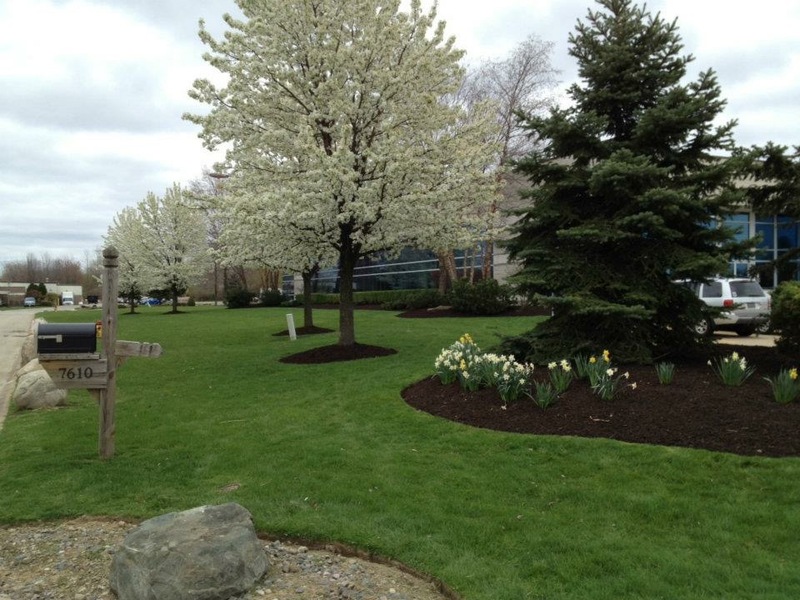 Spring is finally Here and H&M Landscaping offers a wide variety of services for your yard. 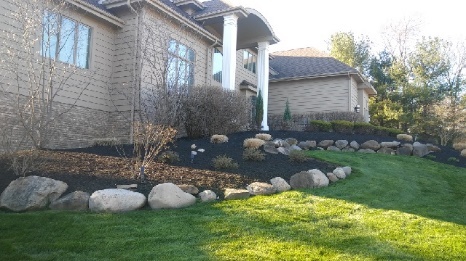 From a spring clean-up and mulching, to a deluxe maintenance program, we cover all of your landscaping needs. Just sit back, relax and enjoy your beautiful yard with full service maintenance program. 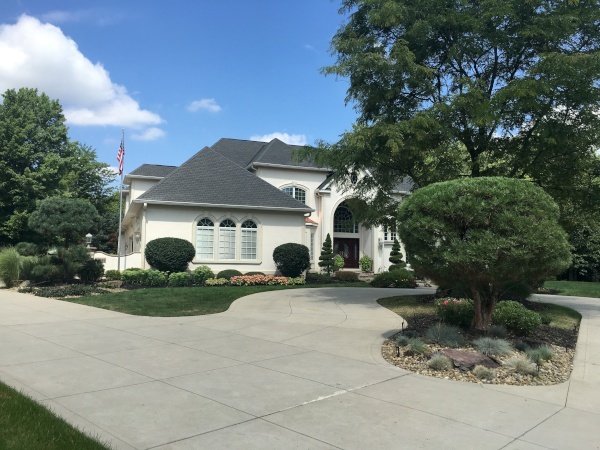 H&M Landscaping provides weekly lawn maintenance, shrub trimming, lawn and plant fertilization programs, landscaped bed mulching and spring and fall clean-ups. Please reach out to one of our team members for a free estimate and make your yard and outdoor living space the best it can be this year. Spring is officially here and everyone is itching to be outside enjoying their outdoor living space. If you are considering landscape improvements for your yard, please schedule a free estimate with the H&M team. Whether you are looking for something small or large, we can create the perfect backyard for you- tailored around your budget and needs. One of our current projects is a new construction home in Willowick and a first home for a newly married couple. First we built a retaining wall out of Sheffield Blend Versa-Loc, excavating down to allow us to put 4 inches of compacted base material and 1 inch of limestone screening as the foundation for the Versa-Loc. 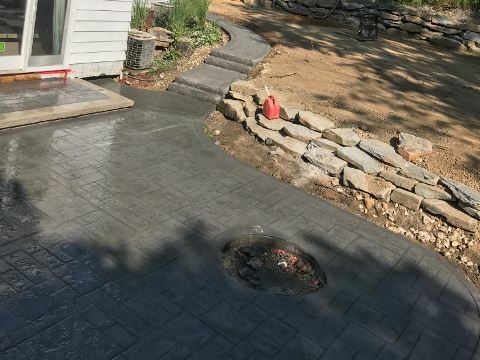 Next we poured colored concrete with a stamp pattern that the customer chose for the main patio area and then built a louvered style seat wall around a split and stack fire pit. 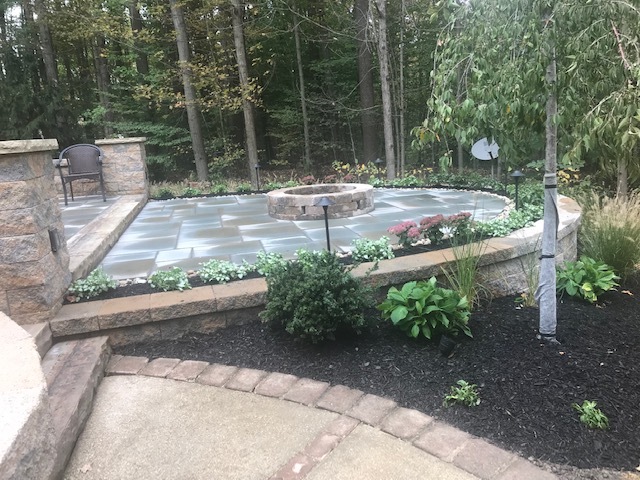 After patio completion we top dressed the job with new plant material and mulched everything giving this family the backyard living space they had envisioned. 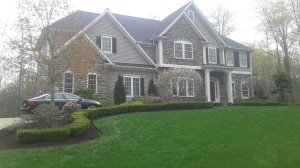 H&M Landscaping Spring landscape clean-ups are a vital part of maintaining the value and appearance of your home. Once spring comes around, your grass and spring time blooms may not be able to grow or recover from the intense freeze/thaw cycles we experienced this winter. 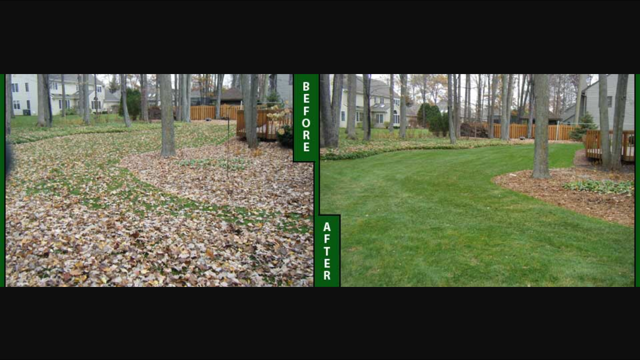 Most homeowners do not realize the importance of of this yard clean-up aside from just the overall improved look. 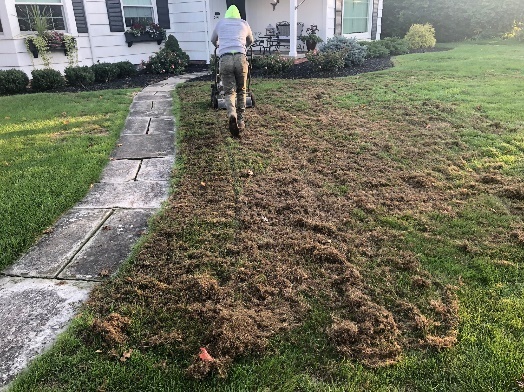 The main benefit you will gain from a professional yard cleanup by H&M is preventative buildup of debris and organic matter which can form a blanket which acts as a barrier between your grass and the sunlight. It can also end up blocking out water, oxygen and other crucial nutrients. When this blockage is left unresolved it can cause harm to your lawn. You should not assume this material will break down on its own. When properly chopped up and used as an organic mulch, it can be beneficial to plant life. If left on top to cover, it may smother your grass, flowers and other desirable plants. H& M Landscaping has decades of experience taking care of this type of work and we know what goes into creating a stunning and healthy yard. Scheduling a thorough spring cleanup right now is critical to getting your landscape ready for the upcoming season. Contact us today if you would like our experts to reach out to discuss all of our landscape services. 1. Now is the time to get preventative crabgrass control down. If you happen to have bare spots in lawns that you want over seeded, you might want to skip over these spots to help growth of new seedlings. Remember the crabgrass control is a pre-emergent herbicide that keeps things from germinating. 2. Have a plan in mind for care of the lawn this summer. Feeding it is always important, but water is just as important. Any fertilizer that goes down needs water to help it get into the plant. 3. Cut at the proper height. Most cool season grasses like to be 2” or higher. You might want it to look like the country club fairway, but you are not set up to take care of it at that height. 4. If you are not sure what to do, give someone a call. You probably call a doctor when you are sick or a plumber when the pipes back up. Give us a call with your lawn issues. H&M Landscaping not only designs and installs new landscape irrigation and lighting, we also provide service to existing irrigation systems and/or lighting to keep them working for you as long as possible. Whether it's an adjustment to bulbs or diagnosis of an electrical issue with your lighting, our trained and knowledgeable crew can help you. 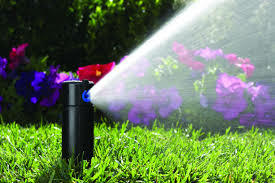 We also offer irrigation maintenance for spring system activation and winterization when the dreaded cold comes back. From routine service to quick help for system problems, call us today for all your irrigation system and landscape lighting needs. 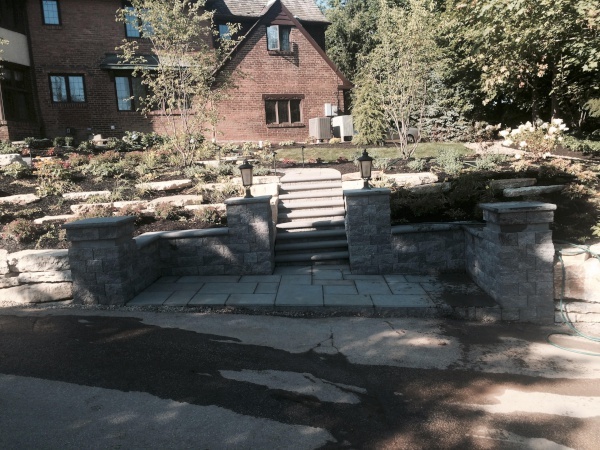 H&M Landscaping installed a fantastic bluestone patio recently in Shaker Heights. To begin this project, the soil is be excavated down 8" followed by installation of 4" of compacted limestone. Next, a 4" concrete pad with a brass drain(to help collect any surface water) and wire mesh is installed to strengthen the pad that will be the base for the patio. The bluestone is set in mortar on the concrete pad and cut to the proper length to fit the pattern. The joints should be filled with mortar and smoothed out so water won’t collect in them. Finally, the patio is power washed to remove debris and is ready for use. 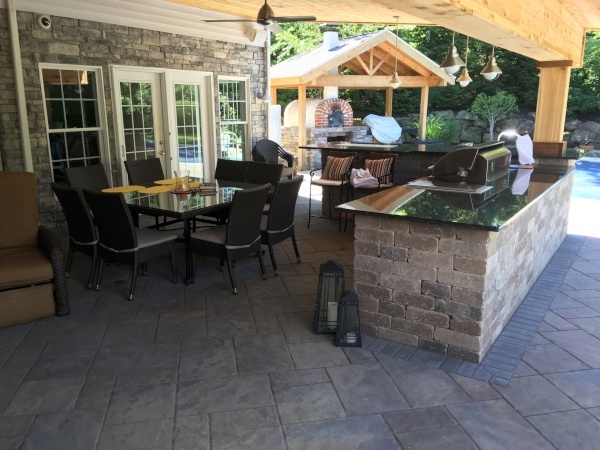 If you would like a bluestone patio like this installed in your outdoor space, please contact our office and we would be happy to visit your property and assist you in the process. It's a proven fact, whether you take a break at work to help tend a community garden on site or come home from a tough day at work, tending to a garden is both relaxing and gratifying. H&M Landscaping employees consider themselves professional gardeners and we can help you get started this Spring with valuable advice to insure your efforts are a success. We have built large flower and vegetable gardens on corporate campuses for employees to relax and take some stress out of their day while they show off their horticultural skills. Our teams also build raised gardens for homeowners who want to plant and watch their garden grow, but may not have the time to do the initial set-up. Our landscape teams can also advise you on the best plant selections and timing of your garden to match our unpredictable Northeast Ohio weather. Give us a call today and we will set up an appointment to discuss your gardening project. With the spring season fast approaching, it’s time to start thinking about getting your yard or business landscape back in shape. 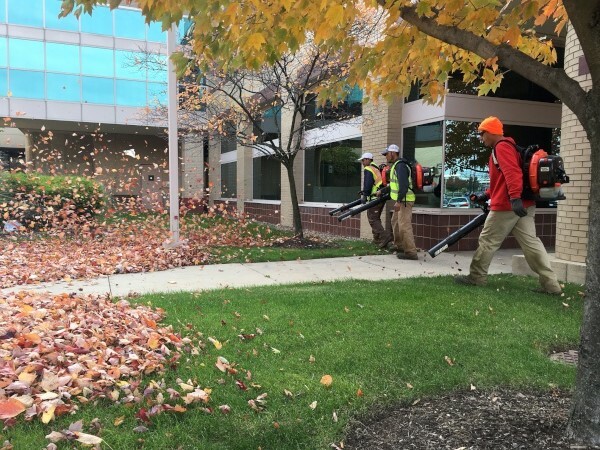 H&M Landscaping will soon be out in full force around the Greater Cleveland Area cleaning up any organic debris remaining from fall and winter. Nothing says spring like a nice deep edge on the beds and the smell of some fresh organic mulch. Give us a call and get a free estimate from one of our sales specialists today! Do you have cabin fever? Are you feeling the winter blues? Well let's start thinking of spring flowers, the sun shining and enjoying the outdoors. 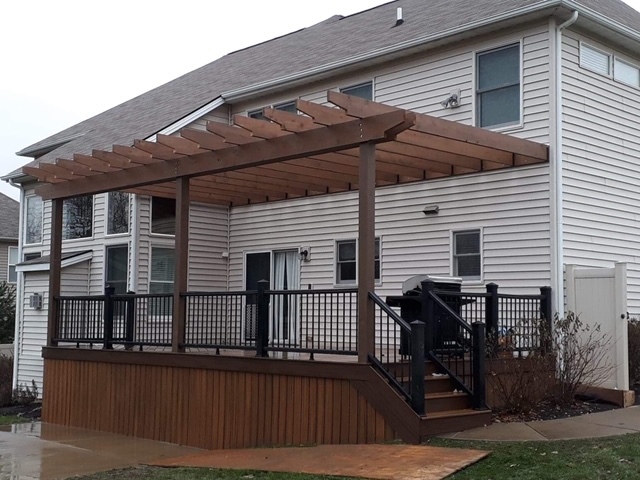 We are having some great weather here in Northeast Ohio and we can start sprucing up your yard for spring and building a deck or refinishing a pre-existing deck. Consider adding some pops of color with flowers, fresh mulch and a deck to enjoy all of your holiday parties and summer evenings. Upgrading your outdoor space is also a great way to add curb appeal and resale value to your home. 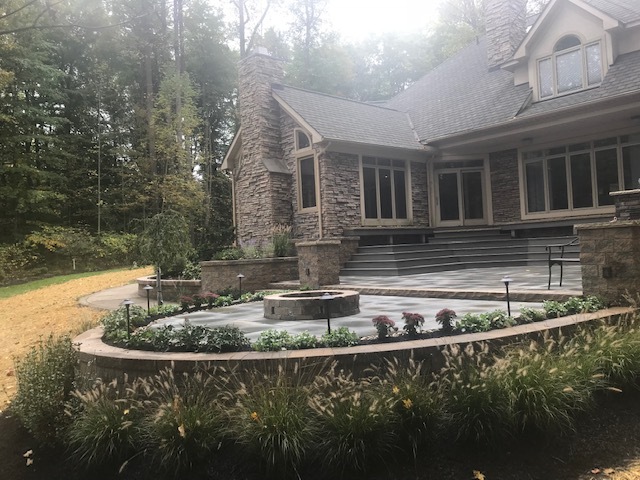 H&M Landscaping strives to exceed our customers expectations with a landscape design and installation to provide that outdoor lifestyle you dream of. No matter if your yard is large or small we can design an area that fits your needs. A small paver patio, a refinished deck or a new multi-level deck with a pool will give you a space outside to relax after a hard day at work. H&M will work with your budget and ideas to provide a design that is customized for you and your family. We also provide year round up-keep of yards and landscapes with spring and fall cleanups to keep your new oasis pristine and beautiful. 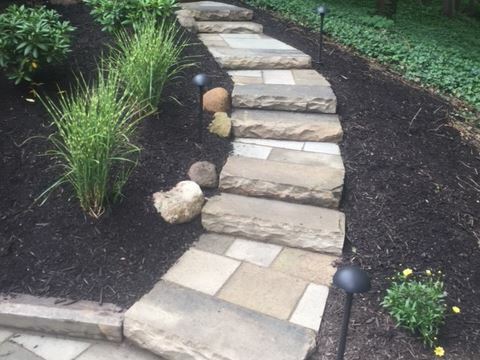 As the green movement continues to grow, H&M Landscaping is committed to helping the environment by transitioning to all LED low voltage installations for customers in Cleveland and Northeast Ohio. Our focus has always been on cutting edge education for our team, as well as our clients, using the latest technologies for managing their properties and saving them money. While the cost of replacing your fixtures or changing out the bulbs to an LED retrofit may seem pricey, the return on investment is typically only around 3 years. LED fixture costs have dropped dramatically over the last 4-5 years as their popularity has grown with increased availability in the market place. We typically focus on two different manufactures: Kitchler LED Lighting and Encore LED Lighting. Both of these companies have good value for their fixtures when factoring spectrum of light color, price point and warranty. Here are some interesting facts about LED lights and low voltage lighting. In 2012 legislation was passed to outlaw the manufacture of all incandescent bulbs of 100 watts or greater. In 2013 the manufacturing of an incandescent bulb of 75 watts or higher was outlawed and finally, in 2015, the manufacturing of 40-60 watt incandescent bulbs was made illegal. The government's goal was to completely remove all incandescent bulbs from the market place by the year 2020. I really feel that this saves energy and is great for the environment. Not only do the LED fixtures use less wattage, but they also allow us to focus on other property management tasks because of their average life span of roughly 50,000 hours. To see how much money you can save by upgrading your standard low voltage system to a new state of the art LED Low voltage, try out our LED Lighting Calculator. You will be surprised how much money you can save by doing this simple upgrade. H&M Landscaping is currently working through fall clean-ups and winterizations of irrigation systems. Our landscape service crews are also busy cutting down perennials and ornamental grasses to ready these plants for the winter. H&M's irrigation techs are blowing out irrigation systems to ensure that there’s no water left in the lines when the ground temps go below freezing. We service all types of irrigation systems including Hunter and Rain Bird. 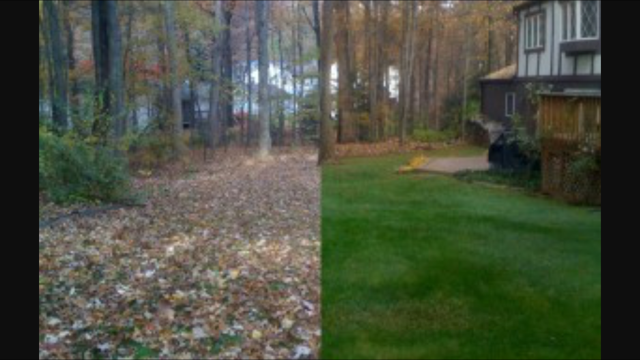 If your property isn't winterized yet or you need a fall clean-up, give us a call for a free estimate today. As summer finally comes to an end and this week fall season begins, here at H&M we will be doing hundreds of cleanups for all of our maintenance and non-maintenance customers. 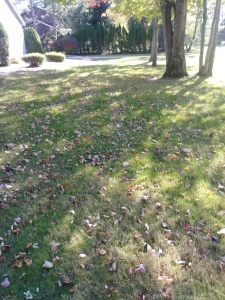 We do weekly cleanups by removing all leaf debris from lawn and bed areas. This is done both manually and mechanically with the latest blowing equipment. Weekly maintenance of your lawn creates a longer lasting clean curb appeal. To maintain a beautiful lawn throughout this colorful fall season, please reach out to one of our team members. We will be happy to stop by and give you a free estimate for discounted pricing and to ensure availability. H&M Landscaping just installed new raised patio, paver walkway with landscape planting in, Solon Ohio. We used Versa-Loc wall stone from Belgard (Harvest Blend) for the raised patio wall support and for the louvered seating wall around the lower patio. 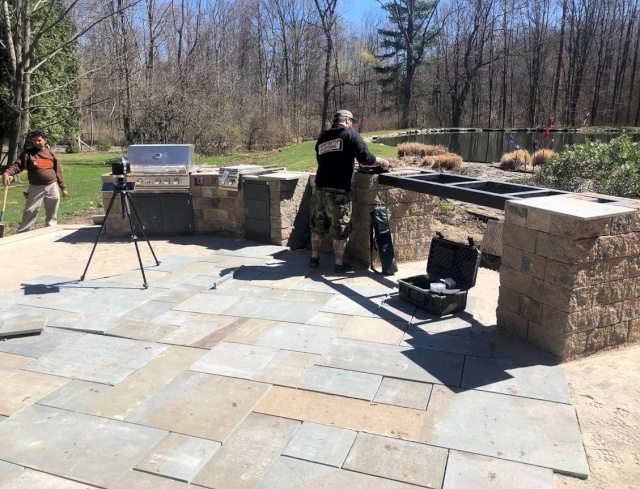 The Versa-Loc was set on #411 bases around the perimeter with #57 limestone compacted every 3” for the interior area which was filled to the top of the patio with geo-grid tied into the Versa-Loc every 2’ to give the wall extra support. We used Cambridge Cobble paver for the patio and back walkway with the Holland Stone as the soldier course, for the border. 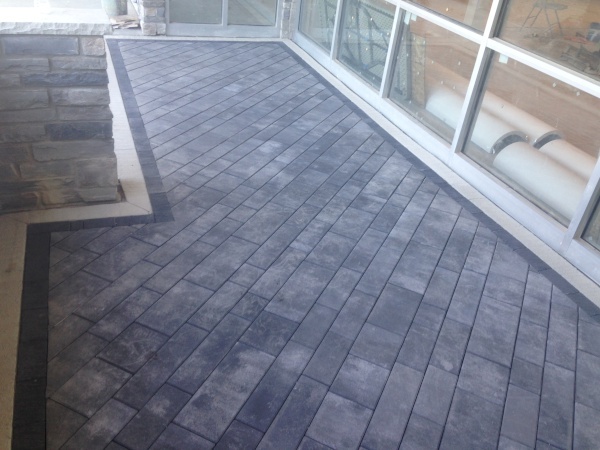 Tan polymeric sand was installed between the joints of the stone. The landscape beds were amended with bed mix, plants installed and mulched with double process brown mulch. 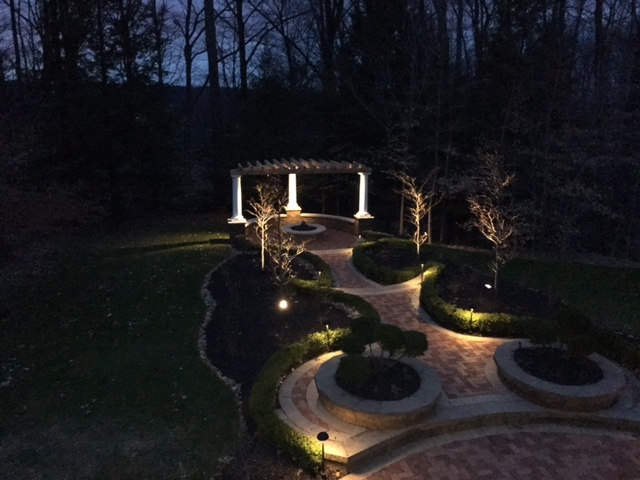 Landscape lighting was installed in the backyard to highlight the specimen trees and shrubs. 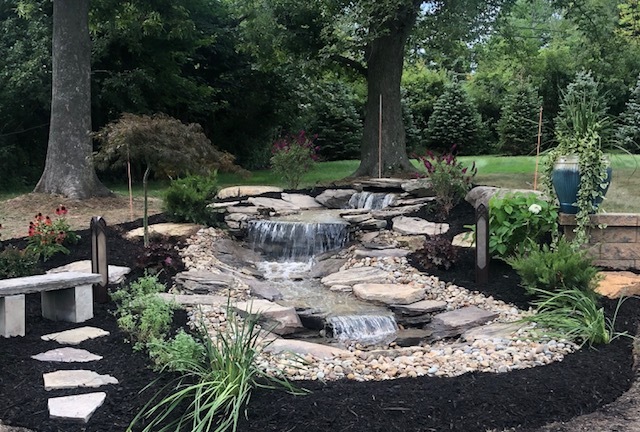 If you are interested in having a landscape installed like this, please contact our office and one of our sales associates will call you to set up an appointment. We all know your not supposed to judge a book by its cover or let a first impression be your lasting impression but life just doesn't seem to work that way. In this case, I'm referring to your curb appeal and the upkeep of your landscaping. Empty flower beds, tall grass, weeds, lopsided bushes and piles of leaves will be no more when you hire H&M Landscaping. Our team of professionals work hard to keep your lawn looking pristine. Weekly maintenance, spring and fall clean ups we do it all! 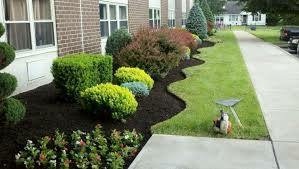 No matter what your yard looks like we will make sure we work hard to give you just the curb appeal your looking for. H&M Landscaping "Where Quality Comes First" so that we make sure we are "Satisfying Customers". Let us know if you would like us to provide outstanding lawn and yard maintenance for your property. The rains have finally started falling again and the dog days of summer are almost behind us. Lawns have responded well to the much-needed precipitation we have experienced recently. Some lawns that have not responded well though have other issues that may need to be addressed. Heavy thatch layers, insect damage and fungus damage are a few that we have encountered. Deep thatch layers have to be removed to encourage better growth. Consider total removal or an ongoing, heavy aeration program; one quarter to one half inch thatch layers are considered acceptable. 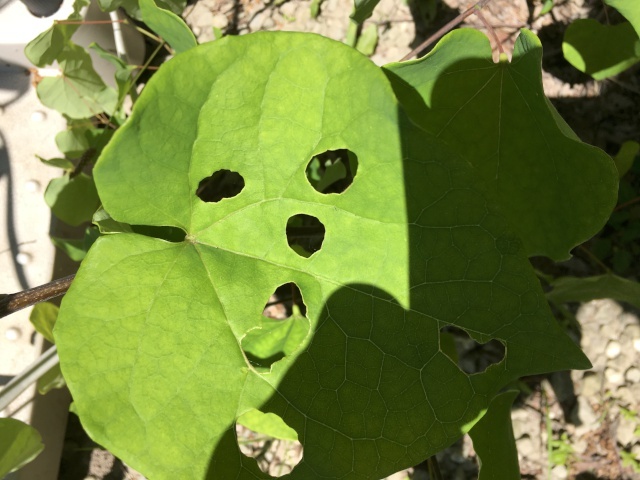 Certain insect and fungal pathogens can kill the entire plant. Most just cause damage to the blades of the grass and you will see recovery. If you suspect total plant failure, you might consider over-seeding into bare areas. 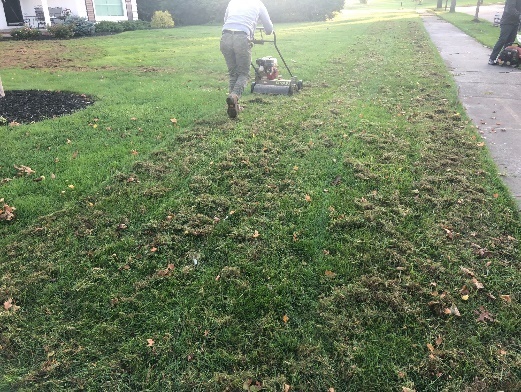 Since most grass has greened up, you might think nothing needs to be done this fall. Do not forget to feed your turf. If you only fertilize once, fall is the time to do it. All the nutrients will be stored in the roots of the plants, enabling them to be ready for next summer. Fall is also an optimal time to deal with any unwanted weeds that have popped up this year. Lawns are resilient systems that are built to withstand the stresses of summer. If you have any concerns about the health of yours, give us a call and we would be glad to help with suggestions to improve your curb appeal. Recently H&M had the pleasure of working with a customer on Cleveland's Westside in Lakewood. This customer just recently purchased the house and was doing a lot of renovating. One of the things on the list was the old outdated sandstone patio in the backyard that was unlevel and falling apart. Patio materials can get expensive, that is why we recommend using materials homeowners already have onsite to save on costs. Pulling the sandstone up and fabricating the pieces we needed for our application is how we saved this customer money. Once your materials are pulled up and set aside for later use, it is IMPORTANT that you check your established sub base for any imperfections and address them. Once your sub base is verified you can start basing up for your new patio. We recommend using at least 4"-6" of compacted base material also know in the industry as #617 limestone base. Once your base is finished making sure it promotes good pitch so water can run off smoothly, you can now relay your patio. Some fabrication of stone might be needed, especially if your new patio has a different layout of the previous one. Once your patio is laid, we recommend sweeping in Polymeric Sand by Alliance to fill in all your gaps and lock the patio in. Snap Edging is secured around the outer perimeter with 12" galvanized spikes every 18". As you know the older stone might not look as vibrant and colorful as new patio product. What we recommend is that you seal the patio with a sealer from Polybind in the "wet look" finish. This really brings back the life into old faded pavers and stone. If you have an old out dated patio that needs a face lift, but you don't know where to start? Give H&M a call today, and someone from out Sales Department will be glad to come out for a free consultation and estimate to get you on the right track to enjoying your outdoor living space again. 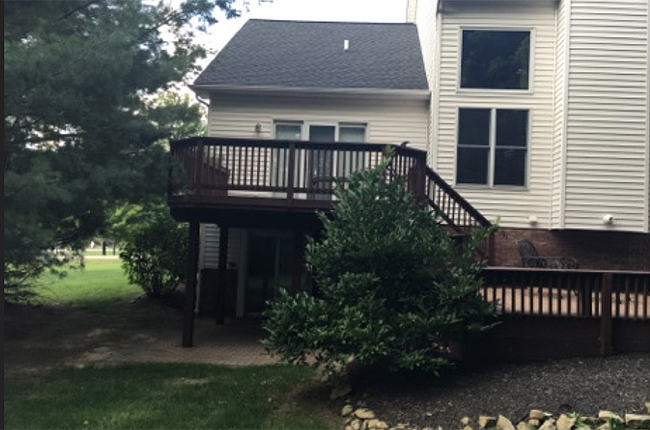 This deck renovation was recently completed in Akron, Ohio by H&M Landscaping. 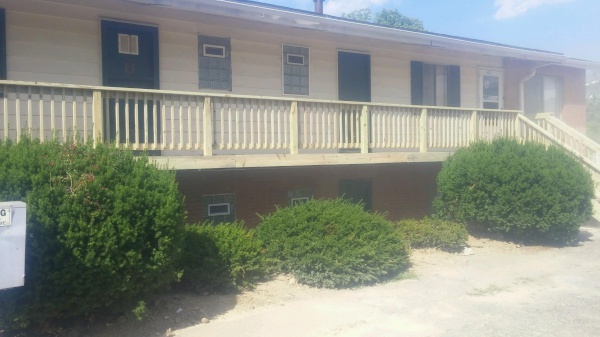 We started the project by removing all old and rotting lumber and the long deck, railing and staircases were rebuilt using premium pressure treated lumber. We used LedgeLOK bolts to build the framing and used 3" screws to attach all decking. The railing posts were cut in next and attached together with 2x4's, 2x2 spindles and finally 5/4 deck board on top to finish it up nicely. Let us know if we can assist you in your deck or other carpentry projects. We would be happy to send out a professionally trained supervisor for a free estimate. Many of you experienced the constant hum of the Cicadas that emerged around Memorial Day and kept us company for the month of June. Now we are dealing with the aftermath of these pests and noticing significant damage to certain trees which they preferred. The damage they left behind consists of the ends of branches dying off. This is caused by them slicing the branches to lay their eggs for their next life cycle 17 years from now. This has been an eyesore in many areas of Northeast Ohio. No need to be worried though as the tree will not die back anymore then it has during this severe drought situation. If you have damaged trees that need pruning or replacement, please call H&M Landscaping for a free tree service estimate and consultation. 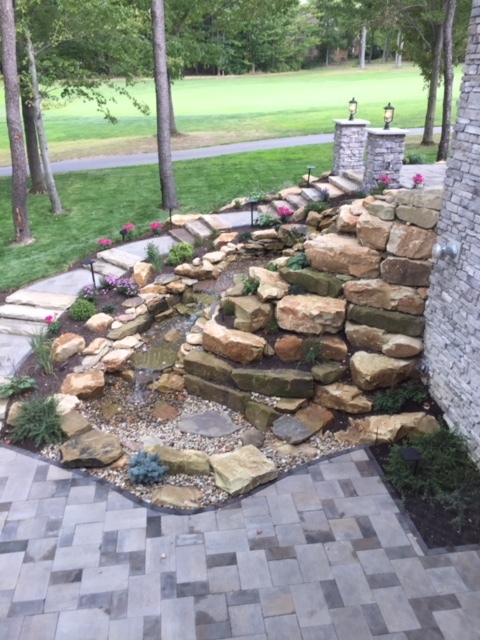 H&M Landscaping just installed a "Rustic Buff Chunks" natural stone wall in Kirtland Ohio. 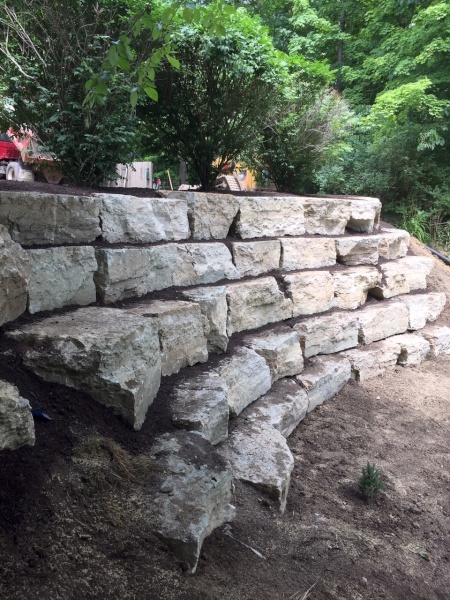 The customer requested installation of a chunk stone retaining wall, 25 to 27 inches thick, due to a serious erosion issue on a steep hillside. It is important to install this type of wall on top of 3 to 4 inches of washed gravel base. Once the gravel base is installed, the stone can be installed in rows. As each row is installed, the wall must be back filled with #57 gravel to help with drainage. This process continues until the wall and ground are level. If this sounds like a good fit for your erosion problem, please contact our office and one of our sales associates will meet you for a consultation. Do you have a great outdoor living space but can't seem to beat the summer heat? This customer in Richfield Ohio had a great outdoor living space but no where to take cover from the sun. 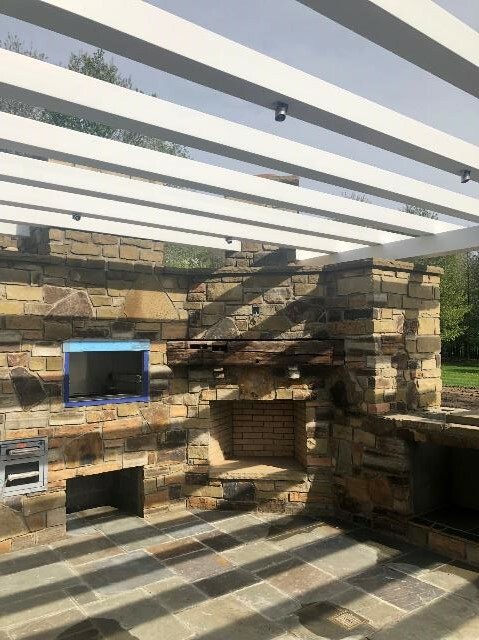 Installation of overhead cedar cover, Brussels block pillar, Brussels block outdoor kitchen with granite counters provided the comfortable living space they were looking for. Please call H&M Landscaping today and let us help you beat the heat this summer! H&M Landscaping installed outdoor LED lighting on this project in Gates Mills, Ohio. 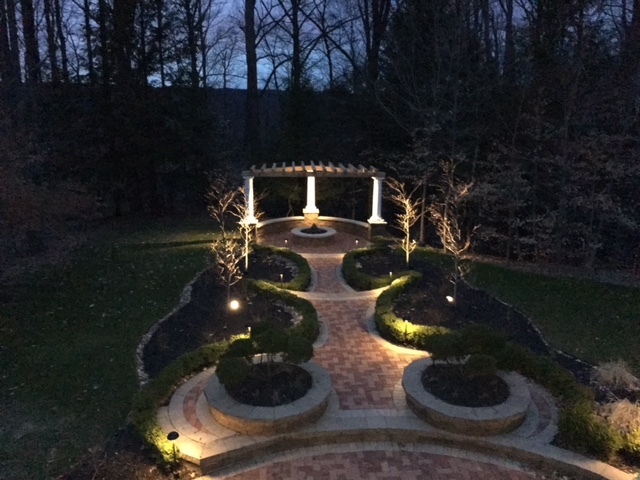 The lights help to illuminate the custom built pergola and Belgard Versa Lock retaining walls, all custom designed by H&M Landscaping. Outdoor lighting makes your landscaping beautiful after the sun goes down and let's you enjoy your outdoor space throughout the evening hours. One of H&M Landscaping's Hardscape crews installing paver patios with Uni-Lock pavers at a commercial properly located in Independence, Ohio. 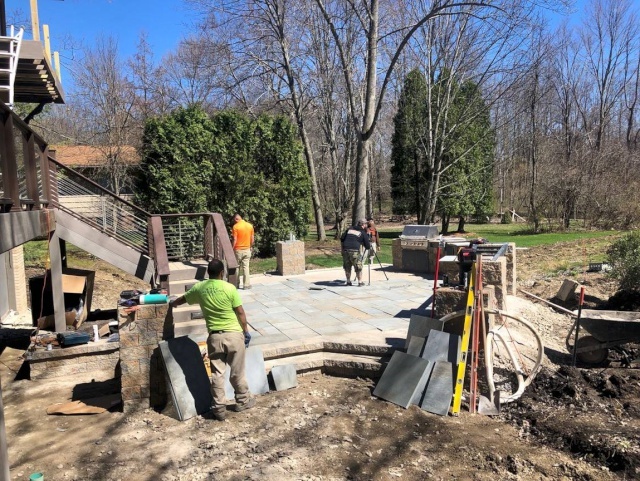 H&M did the entire landscape design and will also do the irrigation installation, lawn and bed installation, plant installation, concrete installation, culture stone as well as an outdoor fireplace. 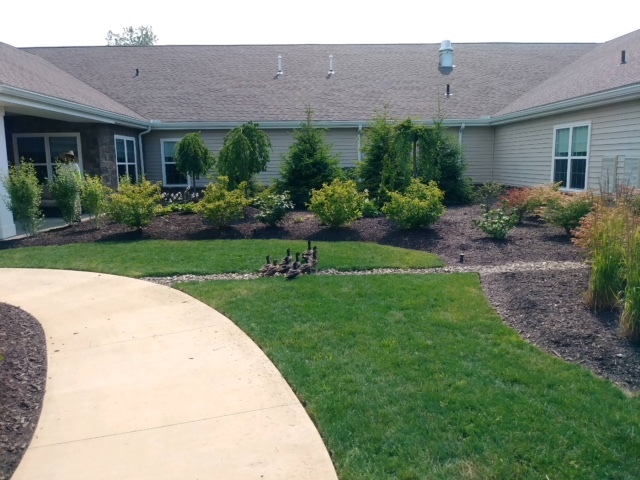 H&M Landscaping Lawn Maintenance Division providing property maintenance to a customer in Bedford, Ohio. This customer is a full service maintenance customer. We provide weekly lawn maintenance, shrub trimming, fertilizer, plant fertilizer, mulching, spring clean up and fall clean up. We strive to make each property we visit look the best it possibly can. It has been a wild ride this spring. A relatively mild winter and warm March has us about a month ahead of the growing season this time last year. A lot of plants pushed early only to be hit with a nasty April snow with some pretty bitter temperatures. If you have Lilies and Pachysandra, you have probably noticed some of the damage. The plants will recover, however only time will tell if all the Lilies bloom. If you live in an area with any kind of deer population, they too are enjoying the early spring and have been feasting on your Hosta and various other tender plants (Lilies included). H&M offers a deer control product that can be helpful in deterring the critters, but it is not a one-and-done treatment. We recommend starting with 10 treatments and adjusting after that. Current customers have had success with 6 applications, while others may need weekly visits. The mild winter has also helped the weeds. They will grow in all kinds of weather, but winter annuals have been growing like crazy. Winter annuals germinate in the fall, live through the winter, flower and die. The nasty looking weed with the little white flower is Bittercress (see picture). It has taken over a lot of beds this year and also popped up in many lawns. 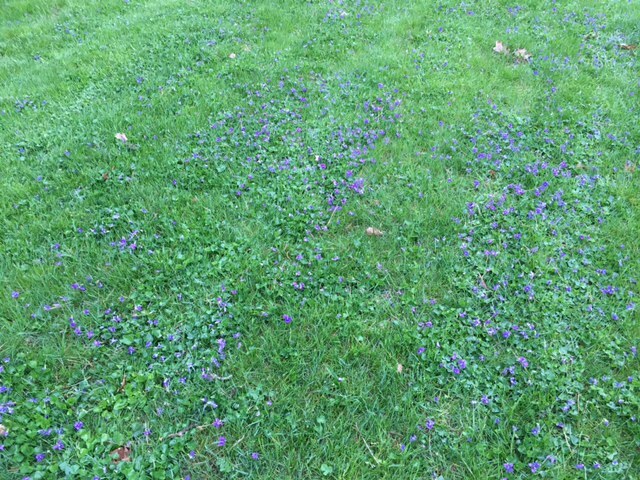 Annual Bluegrass (most people consider it a weed although it probably has filled in any bare spot you may have had in your yard) is nice and healthy. The true annual variety will fade away during the first hot spell we encounter and there is nothing you can do about it. Try to reseed these bare areas with perennial grasses. I have encountered a winter annual Violet this year. It looks nice in the bed, but has also moved into the lawn. The customer doesn’t want it in either area. Again, a true annual will die, but not before seeding so it can be around again next year to bother you. A healthy, full lawn is your best defense for weed encroachment. Proper feeding and weed treatment will be necessary to keep it that way. If you have any true annual weed issues, a pre-emergent weed treatment in the fall would be very beneficial. A weed is anything growing where you don’t want it. Take a look at the pictures of the purple Violets (these are not the annual type). One picture is of a lawn area, the other is from a bed area. Depending on who you talk to, it may be a weed in both situations, or desirable in both situations. Beauty is in the eye of the beholder. April showers bring May flowers, and this year snow plowers. Remember, we live in Ohio; you can do everything right and get thrown a curve that changes everything. Enjoy the weather today because who knows what is coming! 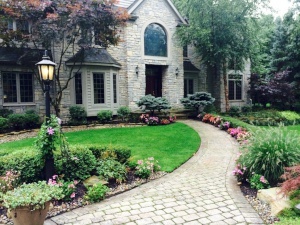 H&M Landscaping recently completed this construction project in Mentor, Ohio. We started the deck work by setting pressure treated 4x6 support posts 42" deep. Next, we built the support beams, installed the ledger board onto the house, added the joists and surfaced with 2x4 premium treated decking. A 1x6 fascia was installed around the deck and custom seating benches were built on site. The new deck should cure for 6-10 weeks (before staining) to fully dry out from the pressure treatment process. H&M began the hardscaping phase with 6" of #617 base material and 2" limestone screenings compacted to the exact grade needed. 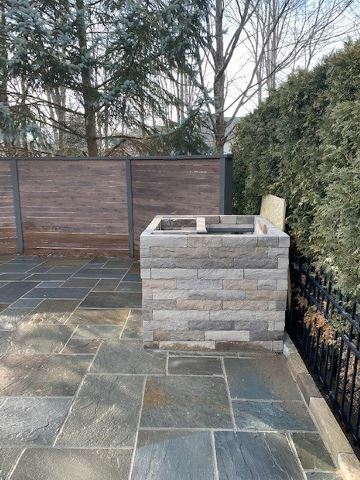 A 3'x5' Versa-Lok fire pit was installed using Unilock "Coffee Creek" Hollandstone for below cap banding and also for the patio pavers. Two large Canyon Tan outcropping boulders were placed near the patio edges to round out the project. This can be done in your backyard too! Call the H&M landscape office today to schedule your free estimate. The snow may still be flying, but it's time to think about all of the warm days ahead! 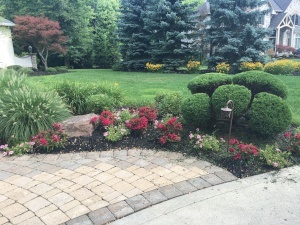 H&M Landscaping offers a wide variety of services – from a spring clean-up and mulching, to a deluxe maintenance program to cover all of your landscaping needs. You no longer have to lift a finger! Just sit back, relax and enjoy your beautiful yard. Call us now (to beat the rush) and one of our experienced representatives will be happy to discuss your property’s potential and all of your landscape needs for the upcoming season. It's that time of year again, spring is finally here. H&M Landscaping has been busy doing spring clean-ups and I would like to share some helpful information that we have come across regarding snow mold. 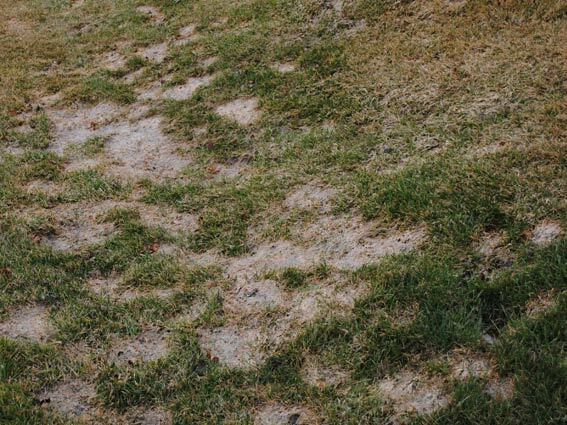 The most common types are grey snow mold and pink snow mold, named for their appearance. Both can develop during periods of cool damp weather, under a layer of snow. 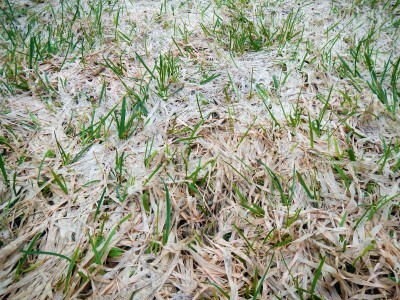 After time, the mold grows and can be seen after snow melt as either pink or grey round patches in your lawn. An improper fall clean-up of leaves and/or inadequate final cutting are major contributors to lawn mold growth over the winter months. 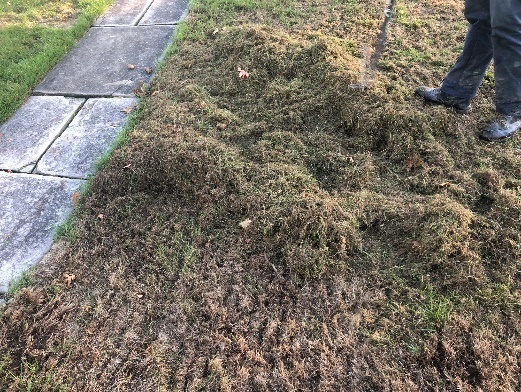 To address this condition, these areas should be raked through several times and the matted grass can be removed, allowing the grass to recover. A spring fertilizer application will also help grass recover more fully. In severe cases, some areas of turf may need to be removed- which will then require the addition of new soil and over seeding. If your yard is suffering from snow mold and you need lawn care assistance, please call us and one of our team members can help you with all of your landscaping needs. 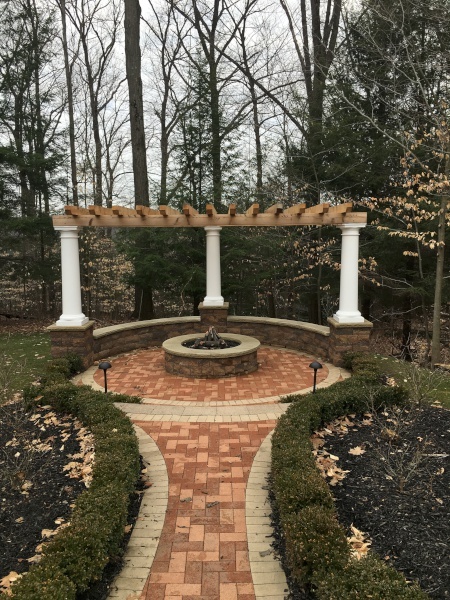 H&M Landscaping installed a Belgard, "Harvest Blend" color, Versa-Loc seating wall and pergola in Gates Mills Ohio. First, 3 six by six treated post were cemented into the ground to support the pergola. Second, we excavated down 10" and installed 8" of #617 base materials compacted with 2” of screenings over that for leveling, with the subbase compacted at 2” intervals. Once the base is compacted, start setting the Versa-Loc for the pillars and the walls using a construction adhesive to hold the wall together. The sandstone cap can then be installed and features rock faced on both sides to give it that natural look. 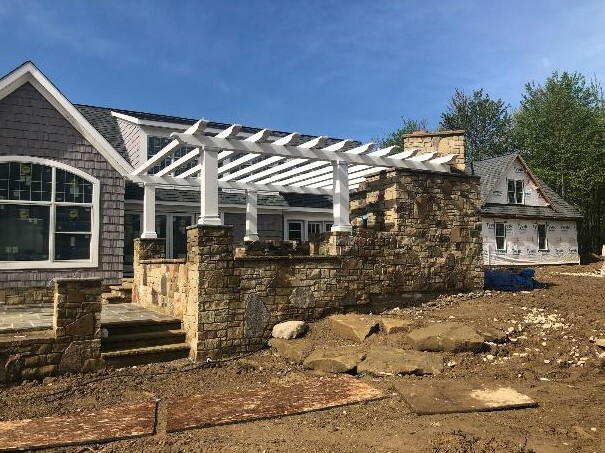 The white fiberglass columns are now installed over the six by six posts to give a polished look to the pergola and to match the front of the house. Next, the frame for the pergola is constructed that will support the cedar beams. Finally, the cedar beams are installed and fastened in place while the finishing touches on the corners are completed. If you would like a seating wall, pillars or a pergola built, please contact our office and a sales person would be happy to visit your site and assist you in the process. H&M Landscaping just installed a Unilock Brussels Dimensional 3 piece stone paver walkway in Chesterland, Ohio. For a quality job, it is important to install new pavers on top of a 6" (minimum) compacted base material. Usually 4" of #617 limestone and 2" of screenings would be used- compacting the subbase in 2" lifts. 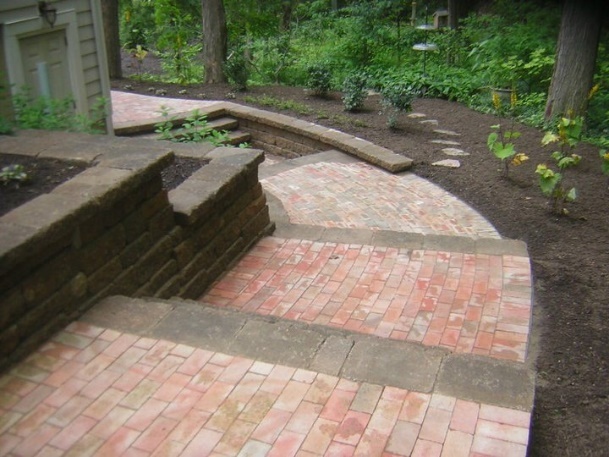 Once the subbase is completely compacted, you can install the pavers of your choice. It is advisable to use Snap Edge PVC edging along the outside of the patio to ensure the paver joints remain tight. We recommend sweeping polymeric sand into all paver joints and moistening to activate the polymer. If this process sounds overwhelming to you, please contact our office and a sales representative will gladly schedule an appointment to visit your property. 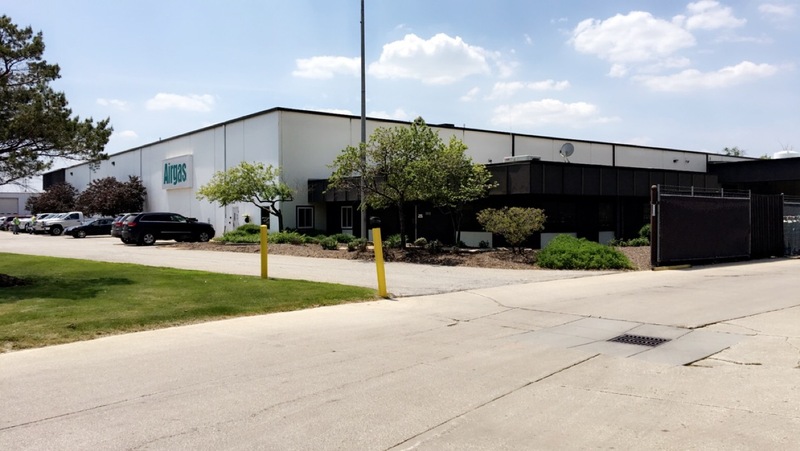 H&M Landscaping recently completed the first phase of a landscape project at the Arhaus corporate headquarters and distribution center in Boston Heights. 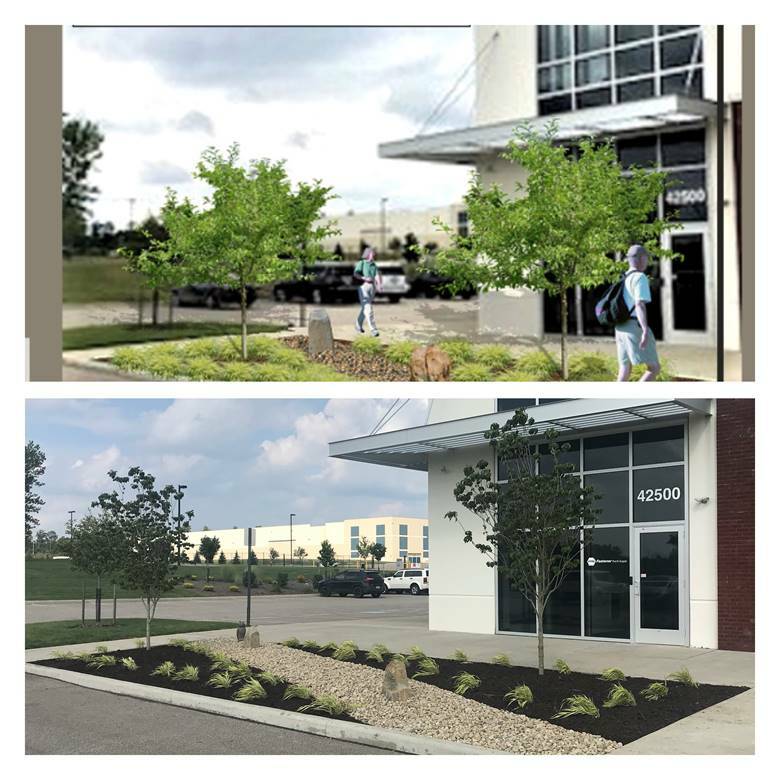 This initial phase included the installation of over 400 evergreen and shade trees plus 350 shrubs and perennials at the 770,000 square foot facility, located just south of Cleveland. We are currently gearing up for the second phase of the project that will include the restoration of a portion of the site to a butterfly habitat. In addition to planting hundreds of milkweed plants, Arhaus has asked that we include many other pollinator species such as Joe-Pye Weed, Butterfly Bush, Aster and Coneflower. No job is too big or too small, please contact H&M Landscaping today for expert help with your upcoming project. I wanted to share an exciting new product called Silca System that we believe will revolutionize the landscape renovation market. With new composites such as Trex and TimberTech being cost prohibitive in many cases, this product fills a unique niche in deck restoration. The Silca System allows installation of specialty pavers (such as Unilock or Belgard) on top of a normal deck substructure. It can also accommodate natural stone such as sandstone, limestone or bluestone. 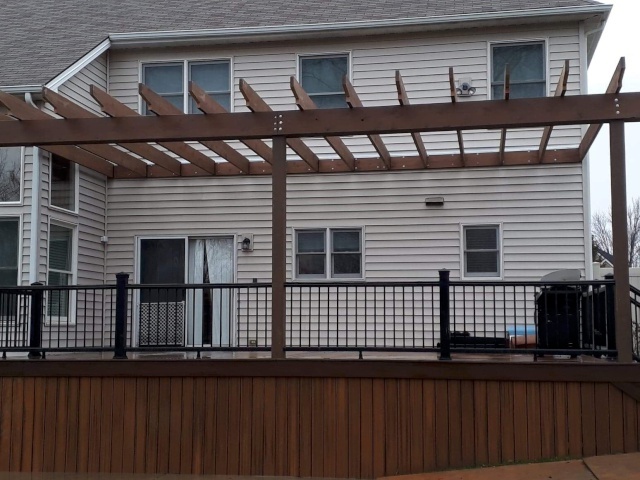 The landscape installer can simply remove the existing lumber decking, install the new system onto the existing structure of the deck, and then install the solid surface of choice. Call H&M Landscaping today to learn how you can utilize this truly amazing technology to turn your old deck into a brand new outdoor space. I hope everyone's new year is off to a safe and enjoyable start and I'm sure many of you are excited for spring to finally arrive. A great and exciting benefit coming to our customers will be the launch of the H&M Landscaping Mobile App this March. We have discovered (and have always believed) in leveraging technology and feel this is the next step in providing a new and easy way to communicate with us. Our app will feature many benefits including loyalty programs, mobile ordering, requests for information or estimates, quick links to contact staff members, project gallery viewing and much more. We will provide QR codes in all future mailings to allow your smart device to take you directly to the app. Additionally, customers who enable push notifications will be eligible to receive discounts on services and free giveaways. Please stay tuned as we will be updating this information at app launch. Here is H&M Landscaping installing a Barrier Reef fiberglass pool over the winter in Kirtland Hills. Spring will be here very soon and now is the time to plan for your new pool or outdoor living space. Give us a call now and we can come out and discuss your project. 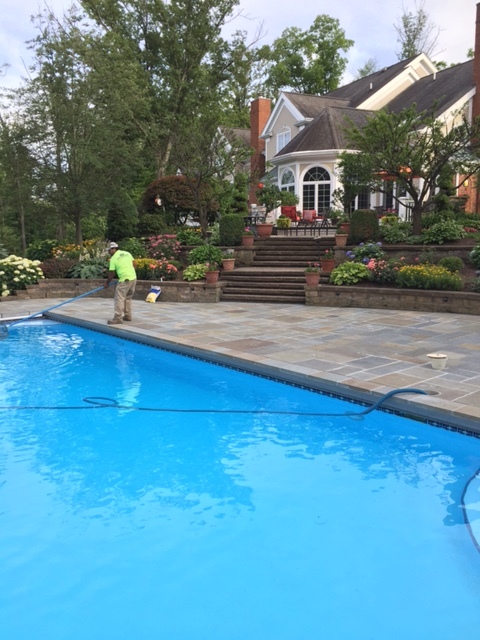 H&M Landscaping uses Pentair and Haywood pool products, many with state-of-the-art automation and monitoring systems. There are many styles and options available that will work well for you and your family. If you already own a pool and are looking to spruce it up a bit (or are having some problems), let us know and we can lend a hand in making suggestions and provide a free quote. With the spring equinox fast approaching, it’s time to start thinking about getting your outdoor living space in order. Nothing starts the season off on the right foot better than a spring clean up with a deep bed edging, trimming, pruning and fresh colored mulch of your preference. Whether you live In Mentor, Rocky River, Hudson or anywhere else in Northeast Ohio, H&M Landscaping has you covered. Give our office a call today at 440-564-1157 and one of specialists will gladly assist you! With the start of the new year upon us, one of the greatest impacts that you can make to better the environment is to recycle! If you have not started this practice, why not make it a resolution for this year? When applied to your landscaping, recycling can extend to many materials used in and around the house. 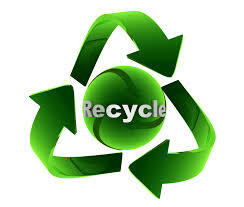 A good example would be recycled materials for decks, such as composites. Local municipalities will occasionally have pavers from old streets that have been repaired and then sold to the public. These pavers could be used for inlays and other retro designs. Every little bit that one person can do is a benefit for the environment and can be a sustainable way improve your landscaping. These past few weeks have been a wonderful break for the typical December winter weather in Ohio. With temperatures staying in the 50s and above freezing during the nights, continue to water your landscape at least once a week. A nice drink before the winter hibernation would be ideal for your landscape plants. Since the soil has not started to freeze yet, nutrients are still available to provide a quick start in the spring. Before the harsh temperatures become prominent, consider removal of plant material in pots. If the pots and the plants they contain are exposed to low winter temperatures, the plants can freeze and perish. They can be transferred to a landscape bed and mulched in to help over winter them. After the plants and soil have been removed from the containers, any concrete pots should be sealed, covered and stored for the winter. Alternatively, potted plants can be moved into an attached garage or a heated shed where temperatures will remain above freezing. 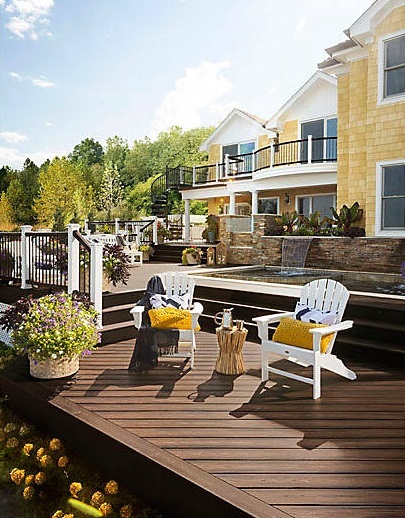 When thinking about or designing a deck, do not limit the project materials to composite decking or treated lumber. Consider steel beams to traverse longer distances which can then be clad in decorative accent woods, incorporate stone inlays and use glass or cable railings. Angled vs. traditional layout and a curved vs. standard deck are options to preserve ideal views and separate different areas. With the advent of composite decking, such as TimberTech (Cleveland Ohio), it's now possible to have a curved deck that also includes a travertine tile inlay using a product by Silca System (Alliance Ohio). 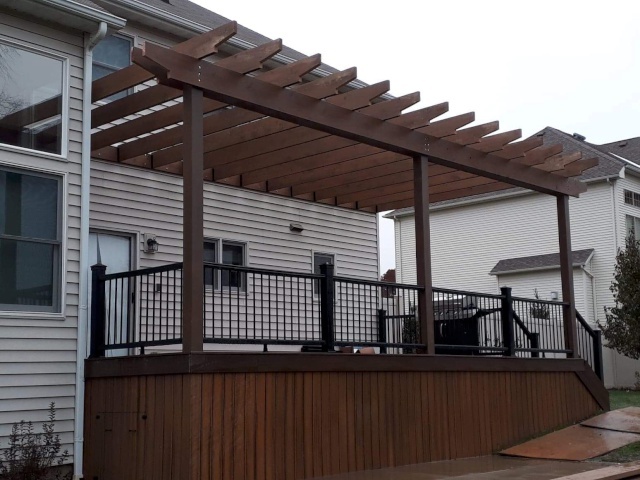 Let the professionals at H&M Landscaping help design your next deck project and bring that outdoor space of your dreams to life, all while supporting local Ohio businesses! The holiday season is upon us once again and as we focus on family, friends, trips, and travels, let's not forget to tuck in our landscaping for a snug winter's nap. Just like changing out the smoke detector batteries and adjusting our clocks, landscapes need our attention as well. Take a thorough look at your property and note any trouble spots. For instance, low areas that hold too much water, weak and/or crowded plants, and settling issues with patios and retaining walls. These issues may not have been apparent during the summer while the leaves and patio furniture were present. Next "tuck-in" your landscaping for the winter by adding an extra layer of compost to provide winter insulation and a boost of nutrients in the spring. Avoid fertilizers late in the year to prevent new growth that can be susceptible to frost. Finally, while the weather and temperatures allow, seal concrete patios, driveways, and stone counter tops. 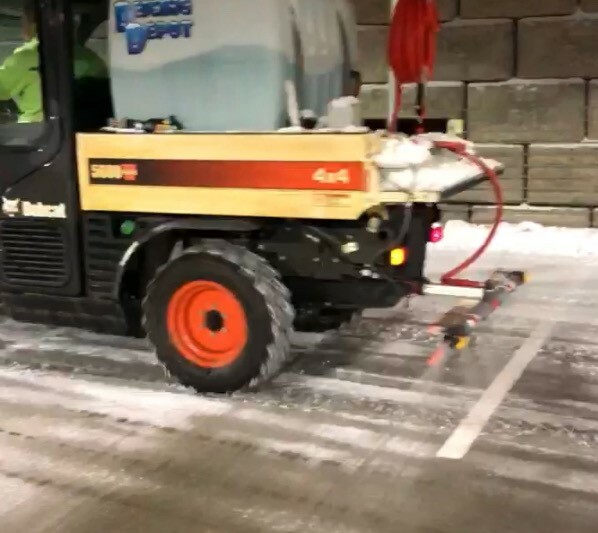 H&M Landscaping can assist with choosing the appropriate sealer to lock moisture out of the porous surfaces of concrete and stone. End of year maintenance or "reflecting upon the year", is a prime time to document issues and changes that have taken place with a dynamic and evolving landscape. Any notes and photos taken now (before the snow falls) can also be extremely helpful to our landscape designers as they prepare your projects for the coming spring. Fall is a very important time of year for your turf areas and planting beds when preparing for our cold winter months creeping up ahead. H&M fall clean up services start you off in the right direction which is key to a thriving spring. Here are some of my personal fall maintenance tips when dealing with turf and beds. 1. Grass should be cut fairly short with properly sharpened blades. This helps the aesthetics of a lawn with an even re-growth. 2. Be sure to properly fertilize your lawn. 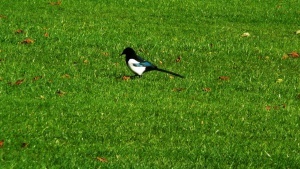 A final feeding is vital to assure that lawns survive our harsh and bitter weather conditions. We at H&M offer today's top performing fertilizers. 3. 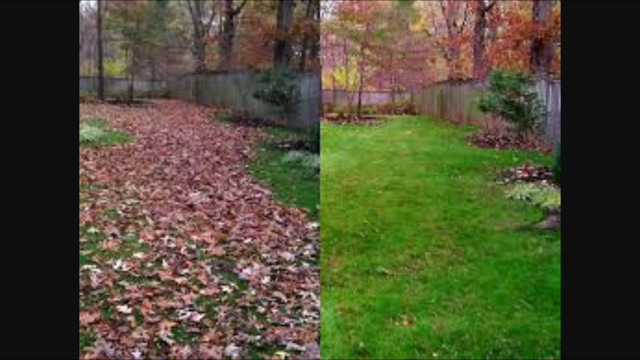 Planting beds and turf areas should be free of all debris, excess yard waste; such as leaves and branches. 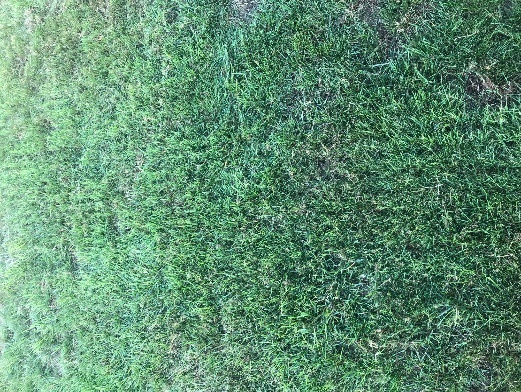 Remaining waste harms lawn surfaces by suffocating the smothered areas causing Bare Spots. H&M fall clean ups aid a lawn's rejuvenation come spring. 4. When dealing with landscaped beds, shrubs should be properly pruned; promoting a healthy re-growth. I ideally prefer perennials to be cut down during fall. 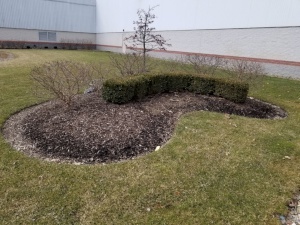 H&M perennial cut backs not only eliminate unsightly perennial skeletal remains, but also minimize shock to new growth in the spring. I hope these tips help you during your fall clean up and winter preparation! If you have any questions, contact one of our friendly H&M Pros to help guide you along the way. Social networking sites like Facebook are emerging quickly as advertising platforms for many types of businesses and organizations. Here at H&M Landscaping, our Facebook page provides several benefits to those that have liked our page. We provide a snapshot of current offerings to our existing and potential customers as well as reminders for property maintenance that should be addressed for specific times of the year. You can also browse through our photo library on Facebook to get some inspiration for your potential landscape project. Be sure you Like H&M Landscaping on Facebook so you can reap the benefits as well! As we all know, Northeast Ohio has a beautiful display of colors this time of year. However, with the falling leaves comes the colder weather, and many of us begin dreaming of Spring, sunny skies and the colorful emerging landscape that comes with it. Why not get a jump-start on next year by working with H&M Landscaping to create your dream project THIS YEAR! Yes, there is still time to have Cleveland’s premier landscape design/build firm help you ease into next Spring. That way, all you'll have to do when great weather returns is sit back and enjoy the view. 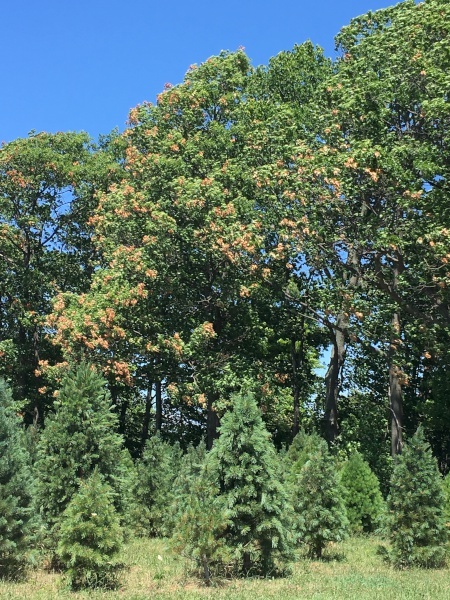 Cooler, more consistent temperatures and soil moisture levels make Fall a perfect time to plant many varieties of trees and shrubs. Coupled with our award winning team of designers and hardscape professionals, H&M Landscaping can transform your property into the space you’ve always dreamed of. It’s not too late to make your landscape the envy of the neighborhood! 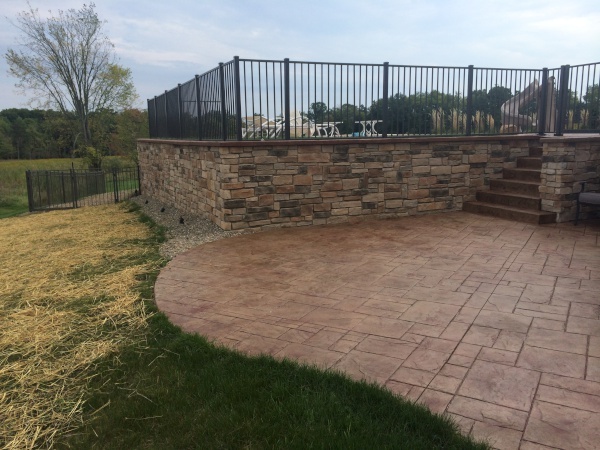 H&M Landscaping just installed a new beautiful Belgard Versa-Lok retaining wall in Pepper Pike, Ohio. 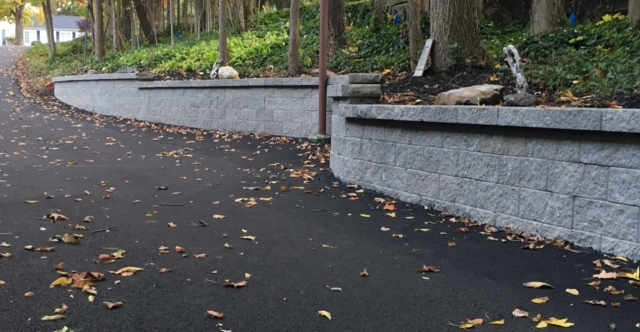 The client needed this retaining wall to support the grade change on their property and our hardscape certified technicians expertly completed the project with the following steps. First and foremost, we excavated below the starting point of the wall to reach a solid sub-grade. Next, we installed a base material at six inches (five of the six inches of #617 limestone- compacted in two inch lifts) and finished off with compacted highway sand and limestone screenings. Once the base material was installed, we were ready to start laying down the Versa-Lok product. Each piece of block has two Versa-Tuff pins installed that extend through the block and into the bottom unit. We then installed perforated pipe (wrapped in fabric) and back-filled with washed gravel for proper drainage. Finally, we installed the Versa-Lok cap unit using a high strength waterproof glue for maximum adhesion. You can trust a job like this to the trained specialists at H&M Landscaping; we would love to come out to your property and help you with your project. 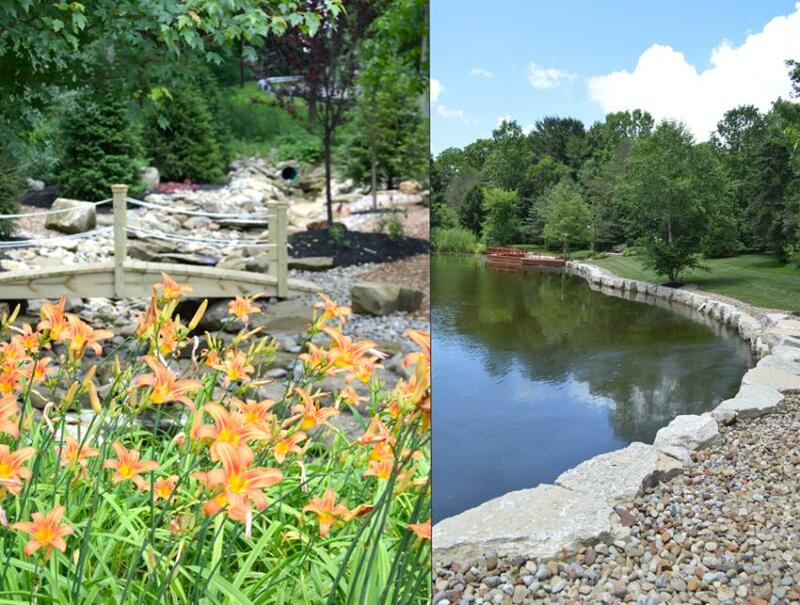 H&M Landscaping provides a wide variety of landscape management services to all of Northeast Ohio. We specialize in commercial and residential property maintenance including: mowing, lawn fertilization, fall clean ups, annual flower installation pruning and mulching. We service customers from Chardon to Avon Lake and all the way down to Medina. We are Northeast Ohio's preferred property maintenance provider with nearly three decades in the landscape industry. Call us today for a free estimate on all of your landscaping needs. 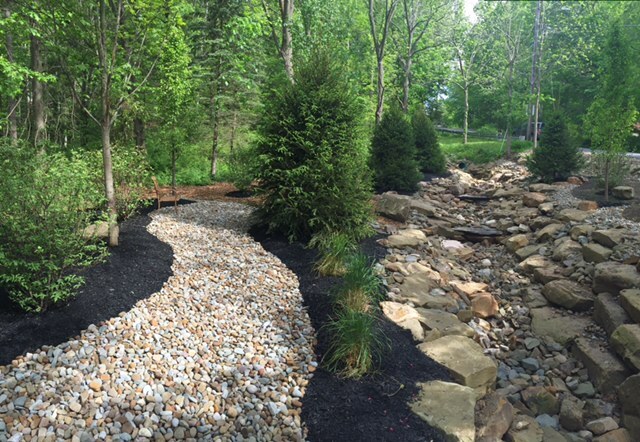 H&M Landscaping recently completed a landscape installation for the Weils Memory Care Pavilion in Bainbridge. The project involved coordination between every division of the company. Our Construction Division installed an arbor and cedar fencing. 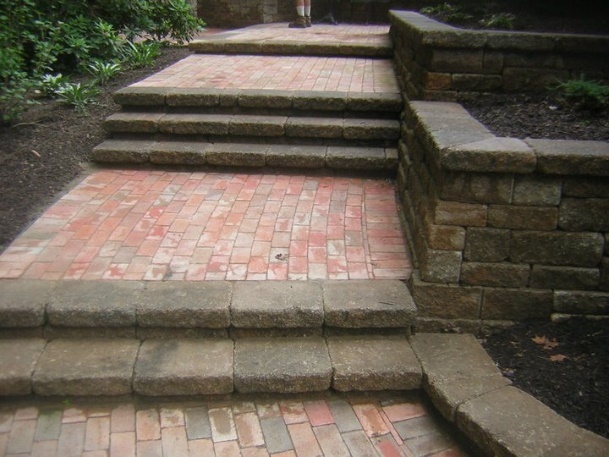 Our Masonry Division installed stained concrete patios, walkways and hand rails. H&M's Hardscape Division installed Belgard retaining walls and a self contained water feature. 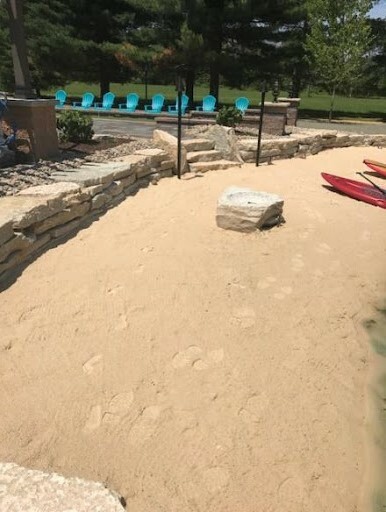 An irrigation system was installed by our Irrigation Division and the softscape crews provided plant and turf installation as well as miscellaneous amenities required at the site. No matter how complex, H&M Landscaping has the resources and expertise to tackle any project at any scale. Please contact us this fall for any and all of your landscaping needs. Do you currently have concrete or paver surfaces that are starting to show wear or are simply just falling apart? 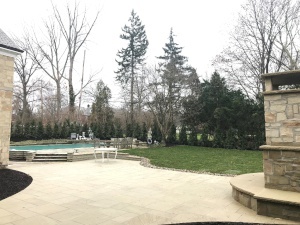 This May, H&M Landscaping was called upon by a customer to provide advice and a solution to a failing masonry wall that supported their upper patio and swimming pool, along with stamped concrete surfaces that had become very dull and faded over the last several years. While meeting with the home owner, it was evident that this was an area where they spent much of their summer as a family and it was truly important to them that we provide a sustainable solution so they could continue to enjoy this space for years to come. 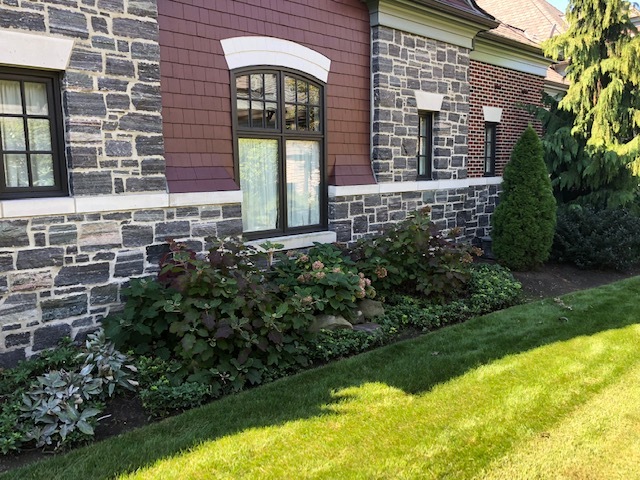 H&M Landscaping provided them with a solution to rebuild all the masonry retaining walls with Boral Ledge stone Cultured stone and poured concrete coping on the tops of walls. 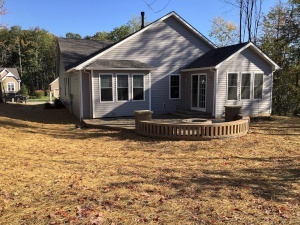 We also stripped the surface of all stamped concrete and applied Scofield Revive exterior concrete antiquing stain- all with a project timeline of 7 weeks. At the end of the project the owner was ecstatic to have a backyard that exceeded their expectations and a beautiful setting to enjoy for years to come. If you have a space requiring restoration or renovation please contact our office and we would be happy to schedule a consultation to offer a solution to your needs. H&M recently completed this project in Hamden, Ohio. 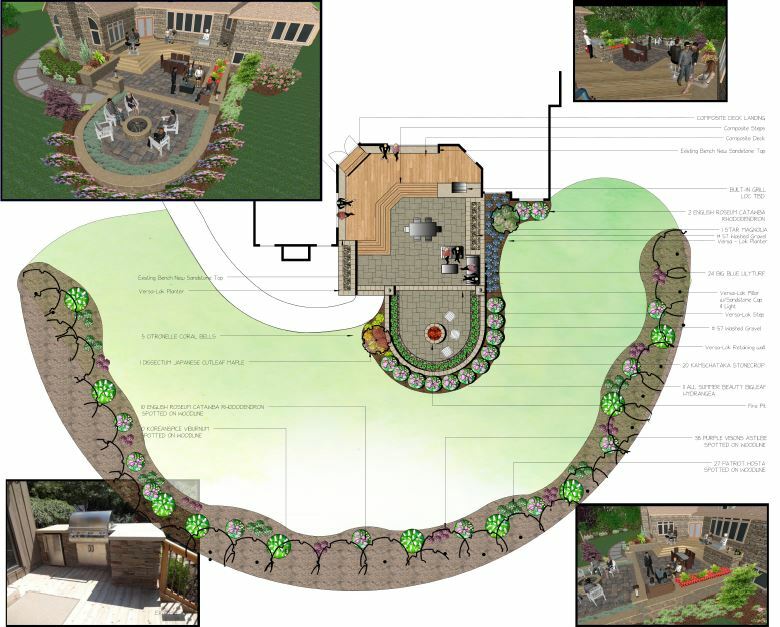 Our customer wanted us to design an outdoor entertainment area where they could host small get-togethers or just enjoy as a family in the evenings. We came up with several ideas and suggestions and with the help of one of our designers, we put it all together in a professional Dynascape drawing so the customer could visualize the work we would be performing. Upon agreement, we installed a custom Cultured Stone® fireplace in San Francisco Cobblefield color with Sandstone caps on each tier. 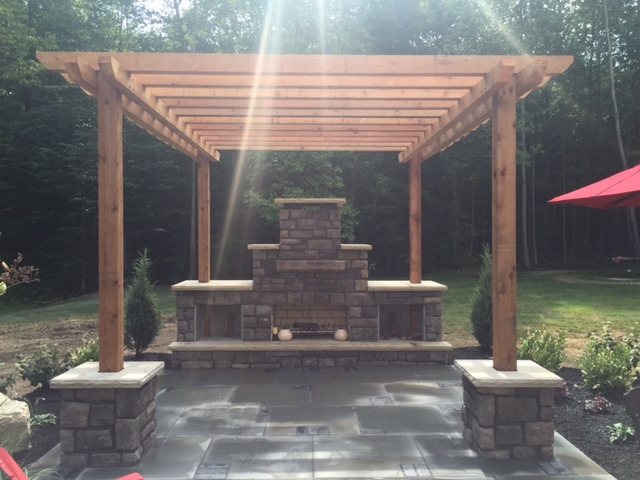 We also built and installed a 100% Cedar pergola over top of a uniquely designed Bluestone patio with custom inlays. We tied it all together by adding this Barnstone™ fountainscape on the other side of the patio to provide a peaceful, relaxing ambiance. The weather this year has been perfect for building projects like this. Call H&M today to schedule an appointment to have an account manager stop by and see what we can do for you! Fall can be the best time of year to transplant the shrubs or perennials that you have been wanting to transplant or split up. With the major heat waves gone and the longer days growing shorter, the plants are less stressed when we move them around the landscape, at the end of August and beginning of September especially. 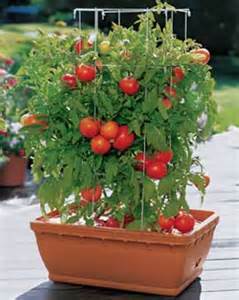 Be sure to keep all transplanted plants watered enough to keep the soil around them moist. The cooler temperatures mean that it's time to think about planting bulbs as well. This is usually done in the fall when the leaves are starting to change colors. It can add some beautiful spring color to your landscape when they flower in April! 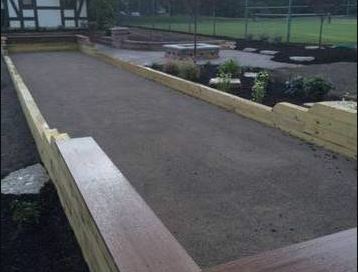 H&M Landscaping recently had the pleasure of working with Mayfield Country Club to install a Bocce Ball Court and patio in their beautiful South Euclid, OH location. Surrounding the court are numerous VERSA-LOK seating walls and pillars, accented with Belgard Holland Stone in the Harvest Blend color. 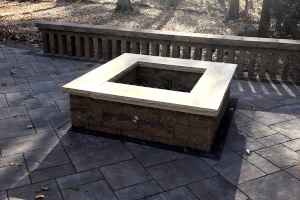 No patio entertainment area is ever complete without a custom-made fire pit with custom Sandstone caps to finish it off. 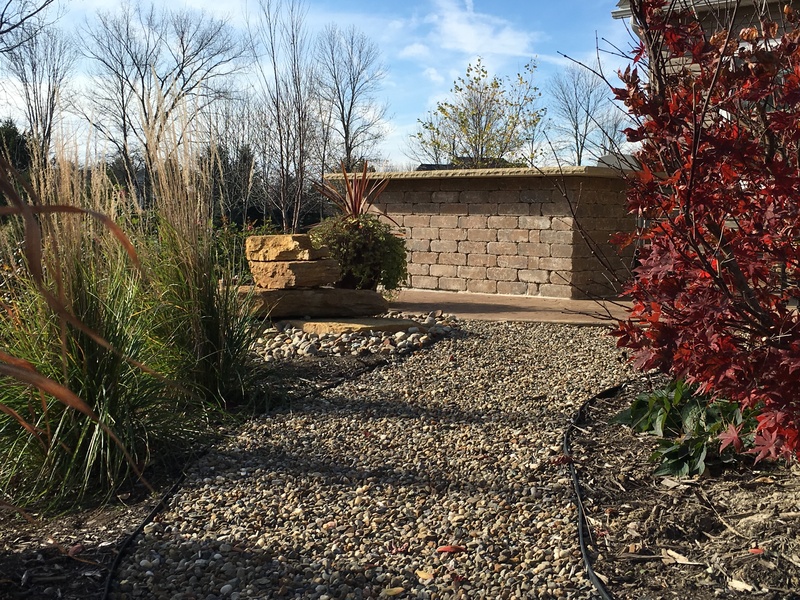 The cherry on top for this project…we surrounded the area with colorful planting beds filled with beautiful trees, shrubs and perennials and peppered Canyon Tan outcropping stones throughout. If an outdoor project is something that is on your mind but you don’t know where to start, call H&M Landscaping. One of our experienced sales representatives will be happy to meet you and help you to explore the endless possibilities. Give us a call today for a fast, friendly and above all, FREE estimate. There are many ways to enhance the look of your property. For some, it may be a new patio, deck or pool. For others, the installation of new flowers, shrubs or trees may be all it takes to give a fresh, new appearance. 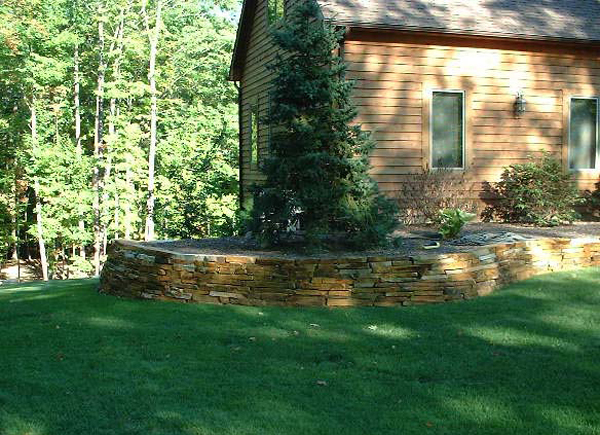 Stone features are one way of giving your landscape a great look. 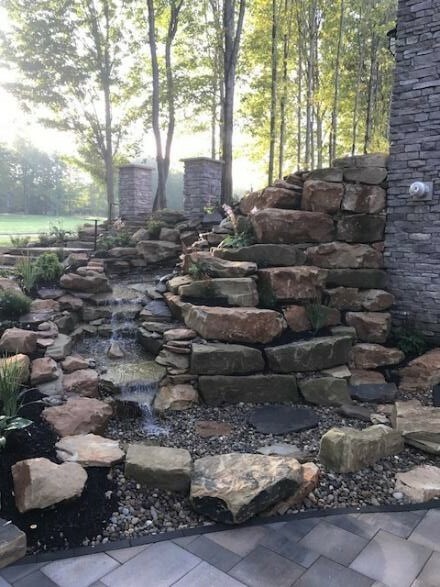 We can supply and install a variety of different stone features, including waterfalls. This addition can give your property the final touch it needs to achieve “eye-catching” status. Call H&M Landscaping today to schedule an appointment with one of our sales representatives to see what we can suggest to take your landscape to the next level. It's been a very hot and dry last few weeks here in Northeast Ohio. With all the effort and hard work you've put into your yard, is your investment protected with a worry free irrigation system? 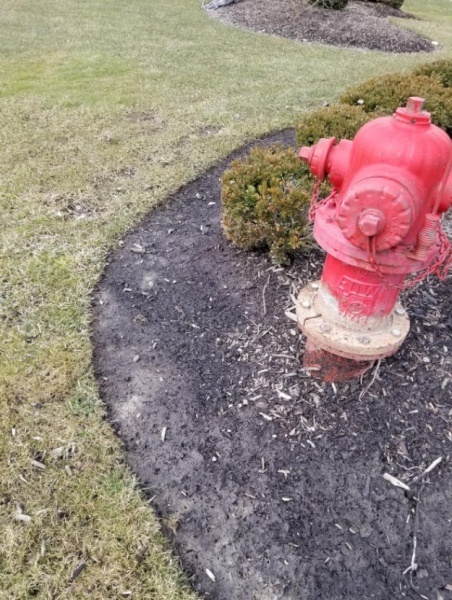 Call the irrigation experts at H&M Landscaping(servicing the entire Greater Cleveland Area) to get an old system up and running, or for a complete new install. Our staff is well versed in all types of systems- including drip irrigation, pop-up heads, rotors and spray misters. We use quality products from Hunter, Rain Bird and Toro to give you a maintenance free system with outstanding results. We've got you covered with new installs on everything from newly seeded lawns or sod, to gardens, flowers, trees and shrubs. 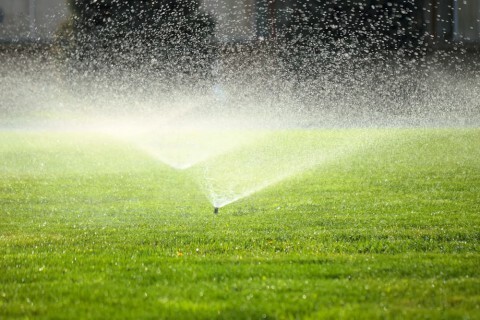 Give our office a call today and one of our irrigation specialists will gladly assist you! 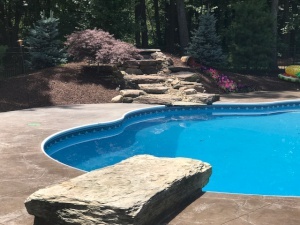 H&M Landscaping just finished this pool renovation in Gates Mills Ohio. This was a complete renovation including new Pentair pumps, heater, filter, and a salt water chlorine generator to make the daily maintenance easy. The pool deck is covered in Natural Cleft Bluestone. Olympic pool paint was used in the pool and an auto cover was installed. H&M Landscaping can install new pools of all kinds and renovate an old, tired, outdated pool to look brand new! Call our office today to find out what H&M can do for you. 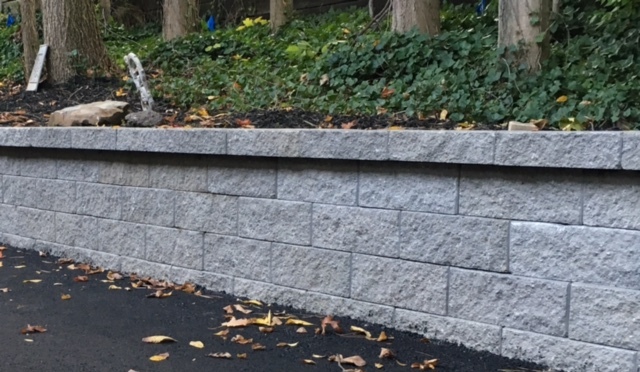 H&M Landscaping just installed a Unilock/VERSA-LOK retaining wall at Mayfield Country Club in Lyndhurst Ohio. 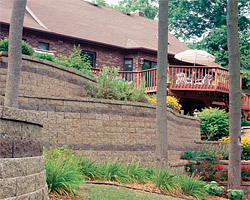 It is important to install a new retaining wall on top of a minimum 6” of compacted base materials. First install 4” of #617 limestone and 2” of screenings- compacting the subbase in 2” lifts. Once your subbase is completely compacted, you can install the wall block of your choice. It is important to use VERSA-LOK pins to help lock the block tight together. We recommend using fabric along the back of the block and #57 washed gravel to provide for drainage. If the process sounds too overwhelming, please contact our office and we can visit your site to help you with your project. 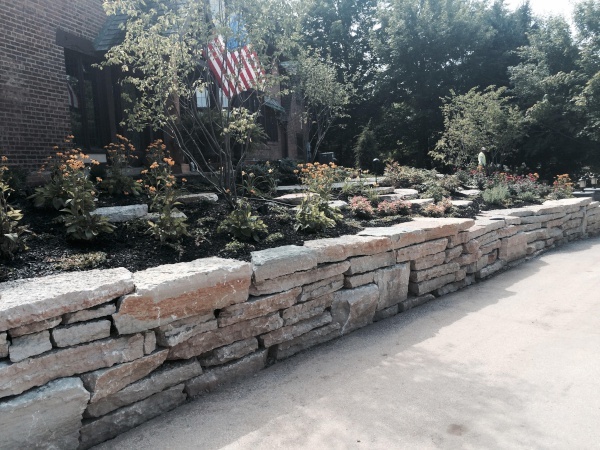 H&M Landscaping just installed a new stone wall and landscape plantings in Pepper Pike. 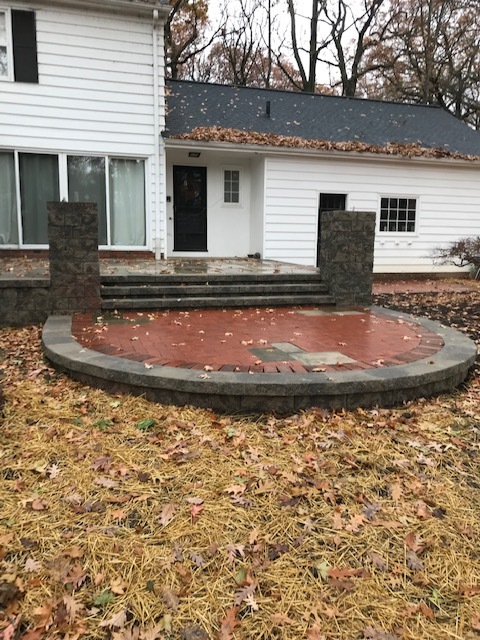 We used Belgard's Versa Loc wall stone "Oxford Charcoal" for the entry wall and "Rustic Buff" and "Cannon Tan" stone for the wall along the driveway. The stone was set on #411 base with drain tile installed behind wall and backfilled with #57 washed gravel. 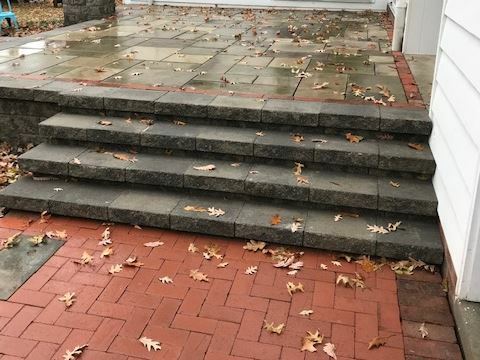 For the front walkway, we used full range bluestone with 3” bluestone treads on the steps. 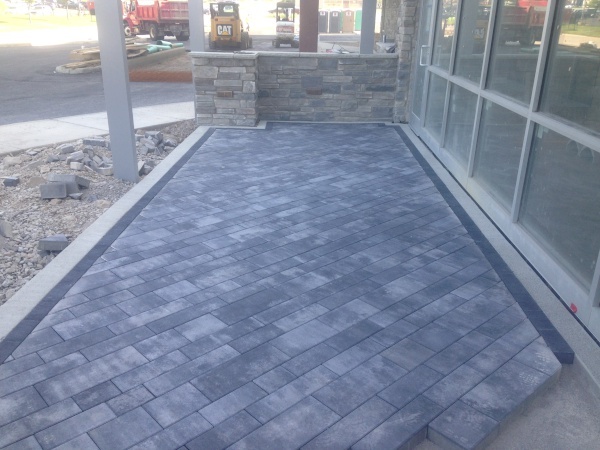 Grey polymeric sand was installed between the joints to stabilize the walkway. The landscape beds were prepared and amended with bed mix. 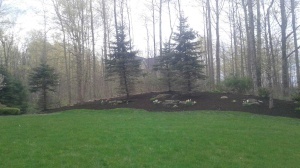 Plantings were then installed and mulched with double processed black mulch. 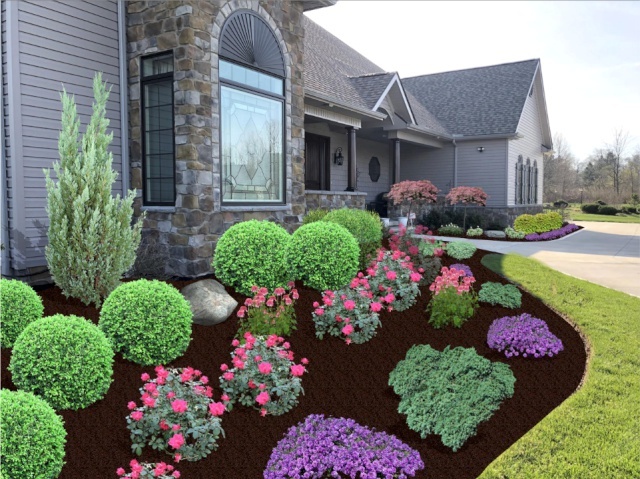 If you're interested in having a landscape installed like this, please contact our office and one of our sales associates will call you to set up and appointment. Mid-summer pruning can be difficult to do, especially when buds have already established. The majority of flowering trees, shrubs and perennial plants can be deadheaded to get the most color with new flowerings. However, keep in mind that many plants have already established new year buds. If you prune your shrubs any further (or not properly) and remove new year buds, this can cause problems in flowering for next spring. For example, Azaleas and Rhododendrons have already established buds for next year and should not be pruned but detailed instead. The professional pruning and detailing crew at H&M Landscaping is experienced in a variety of shrubs, trees and perennial plants. 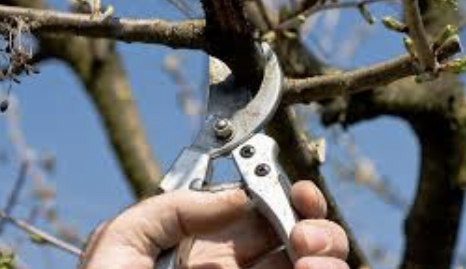 To insure proper pruning and the best outcome for next spring, please give us a call and we will be more than happy to assist with all your landscaping needs. H&M Landscaping just installed a Belgard Cambridge Cobble Stone paver patio in Chagrin Falls Ohio. While this process may sound overwhelming to the average homeowner, it's a routine job for the professionals at H&M Landscaping. If you're interested in a new patio for your property, please contact our office and we can visit your site to help you out. 1. Fertilization: A 6 step program is (believe it or not) the best way to keep weeds out of your lawn. The key is to keep your lawn growing thick and filling itself in. 2. Aeration: Aerating your lawn will reverse compaction of your soil and enable water and nutrients to reach the roots faster and easier. 3. Thatching: Removing that unsightly dead grass allows the existing turf to continue to spread and grow unhindered. Call H&M Landscaping, Cleveland’s #1 turf maintenance professionals, to manage your turf TODAY. Come see the difference experience makes! Don't let water issues get you soaking wet under the collar! 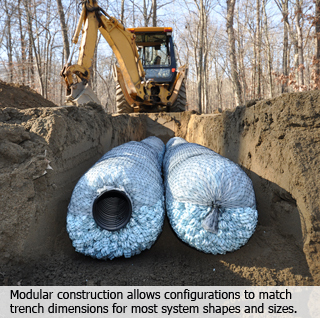 Most people think that the only way to resolve a drainage issue is by digging up the yard and bringing in tons of stone and perforated pipe. This ultimately results in having to replant all of the grass after tearing up the entire lawn. We are here to debunk that myth. With today's technology, we can come into your yard, sod cut the area that you are having issues with, remove the dirt and install a new revolutionary product called EZflow. After installation, we put the sod right back in place over the top of your new drainage system. No more wheelbarrows of stone and messy clean ups. Did you know that H&M Landscaping constructs outdoor open air pavilions? Having a covered area can extend your season especially with the unpredictable Cleveland weather. 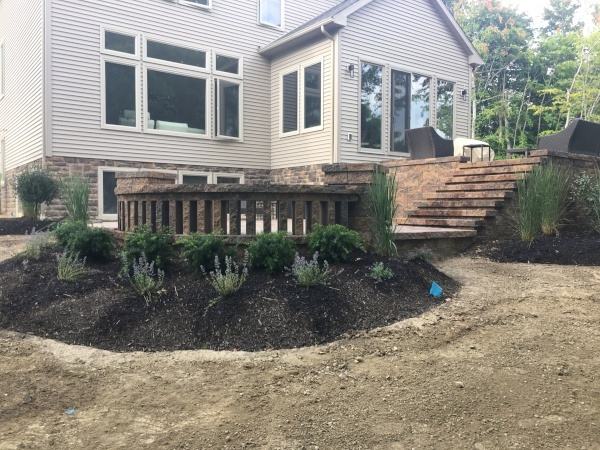 Call us today to have one of our landscape designers come out to create an outdoor living space that will allow you to extend your Ohio summer from 4 months to 8 months. Watch the Cleveland Cavs make their final run for the NBA championship under a new patio cover designed and installed by H&M Landscaping. The grass is growing and this brings mixed emotions for the H&M Landscaping team. The good news: spring is here to stay and it's time to start spinning blades to create that neatly manicured lawn. The bad news: the weeds are sure to follow, and if you haven’t gotten those weed pre emergents down, you're running out of time. Once the soil hits the 55 degree temperature mark for more than 10 days, the window to keep the weeds from sprouting closes and we must go from pre emergents to post emergent’s. Dealing with weeds after they start coming up actually makes controlling them twice is hard! Call us today to keep your lawn looking great all summer. A beautiful yard starts with one easy a phone call. RELAX don’t do it...don’t do anything. According to Reuters, an American professional works an average of 55 hours per week. Outside the office, they have an average of 30 hours of family commitments or obligations per week, 10 hours of other commitments and sleep an average of 7 hours per day. If my math is correct, that only leaves 24 hours for the entire week to sit down and relax. With nice weather on the way, why not unwind in your new outdoor living space. Imagine your own outdoor kitchen, right out the back door, where you can grill up a steak or even bake a pizza. You work hard and play hard, but don't forget to slow down and enjoy your property this summer. Call H&M Landscaping and let one of our Design Professionals create the backyard of your dreams. Isn't it time to "just say no" to Domino’s and bake your own pizza? Mangia! Mangia! How about a Pool or Spa? 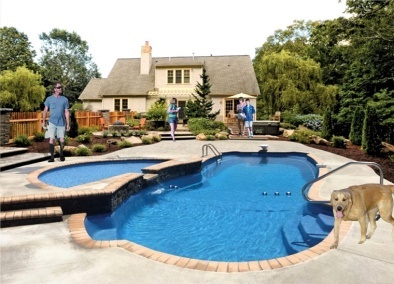 Did you know that H&M Landscaping does pools? We have expanded our resume to encompass pools and spas. Not only can we develop an outdoor living space, but we can also incorporate a pool or spa that you and your family can enjoy on a daily basis. One company that does it all- no more dealing with multiple contractors, the pool guy, the fence guy, the irrigation guy. We bundle the entire project to make it a seamless experience. COME SEE THE DIFFFERENCE EXPERIENCE MAKES. Before you know it, you will be saying: "WOW its 90 degrees out and I wish I had a pool"...we can make that wish come true! Spring is here! Even though the thermometer outside reads 30°, our crews are out starting the 2015 production season. We can appreciate that all of our customers are anxious to get out and enjoy their outdoor living spaces. Call the office now to get ahead of the rush and set up an appointment for one of our associates to come out and walk your property. We look forward to working with all of you again in the near future. Think warm thoughts!